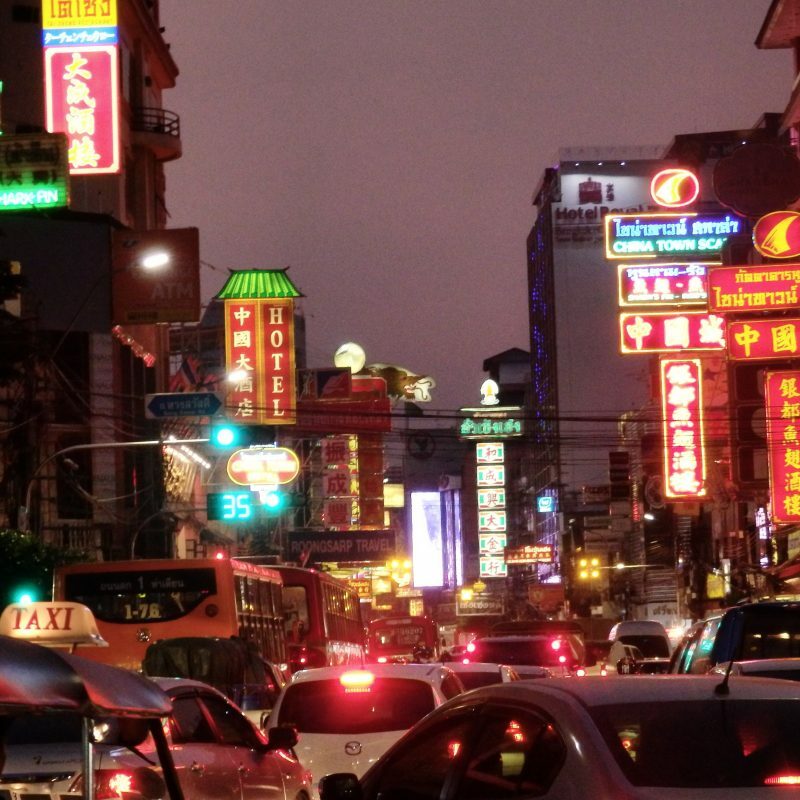 Here are some pictures (and videos) from 3 week Thailand itinerary for backpackers I did time back, from the mountains in the north to the beaches in the south. 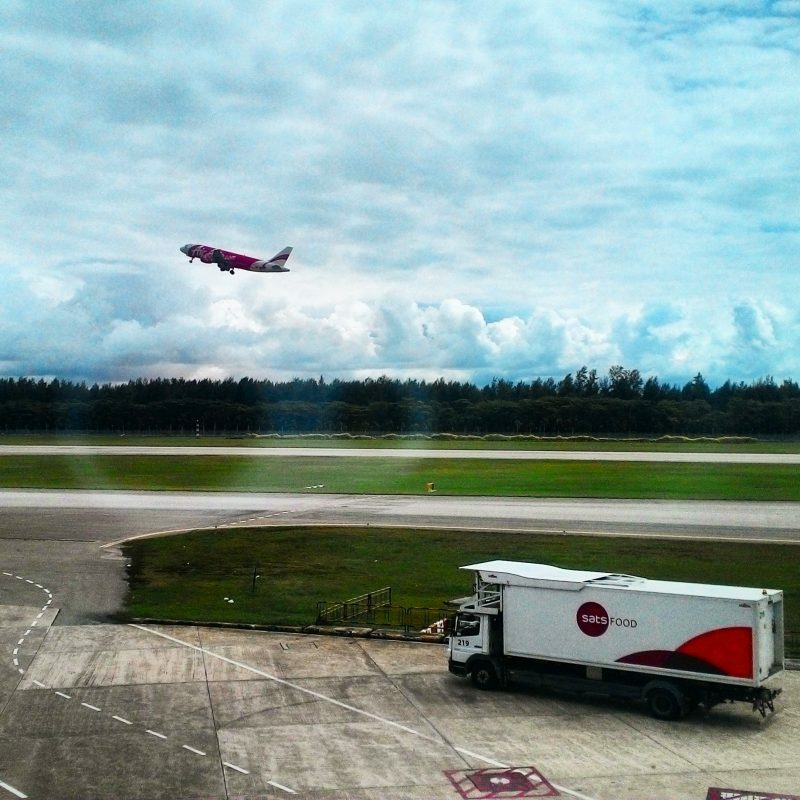 Started my trip right after my final internship of University life, with a short flight from Changi Airport. Took it easy on the first day, settled down and explored the area around my hostel, near the Yaowarat district. 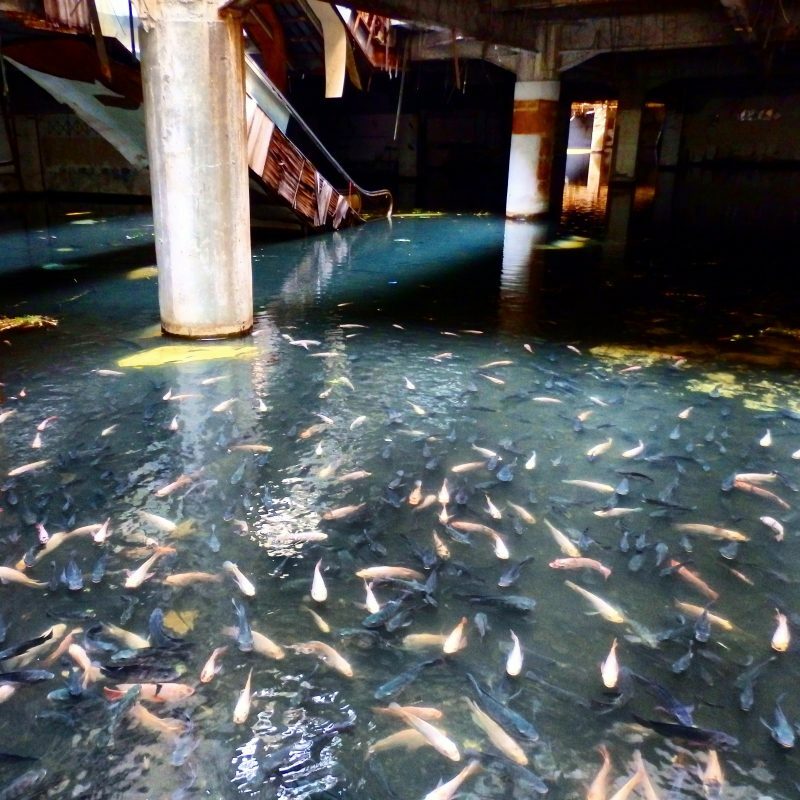 After a late lunch at a noodle joint that near Pratunam that seemed really popular with tourists (more specifically, Singaporeans, Malaysians and Hong Kongers), went in search of an abandoned shopping center (New World Mall) that had been supposedly filled with fish. It wasn’t easy locating it, despite being able to get to its vicinity easily (near Khao San area). Locals in the area weren’t sure if it still existed and couldn’t point me to the right direction. Nevertheless, managed to get help and found a narrow entrance hidden behind some food stalls, but my joy was short lived, and I got chased out after taking a quick vid. Edit: Read that the fish have been cleared (not sure if the mall has been demolished), some time after this trip (in late 2014), so it may not be a good idea to try looking for it. Wasn’t about to let the abruptly ended visit to my first stop dampen my mood, and I headed off towards somewhere I thought might be interesting too, but at the same time not having any risk of being chased off. Had a nice stroll through the (former) backpacking haven, Khao San Road, crossed a big field adjacent to the Grand Palace, and took a boat across the Chao Phraya river to the Siriraj Hospital, home to a very eye opening (or morbid) museum, the Congdon Anatomical Museum. Occupying the top floor of a old wooden building in the hospital compounds, the museum was filled with all sorts of preserved bodies and body parts. Other than learning about what was inside my body, or all the different kind of deformities that could happen during gestation, it kinda gave perspective of my mortality and the transience of life. Not life changing, but certainly provided food for thought. No entrance fees, and no photography allowed inside the museum, but here’s a shot of the creepy wooden staircase leading up to the museum. 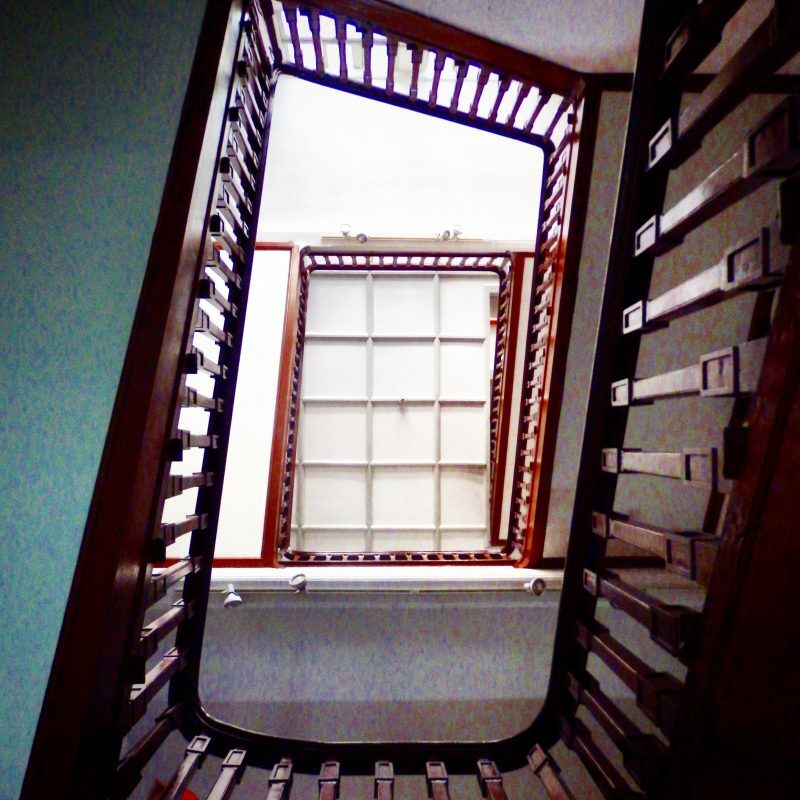 Old wooden staircase in a museum with lots of preserved bodies and body parts. 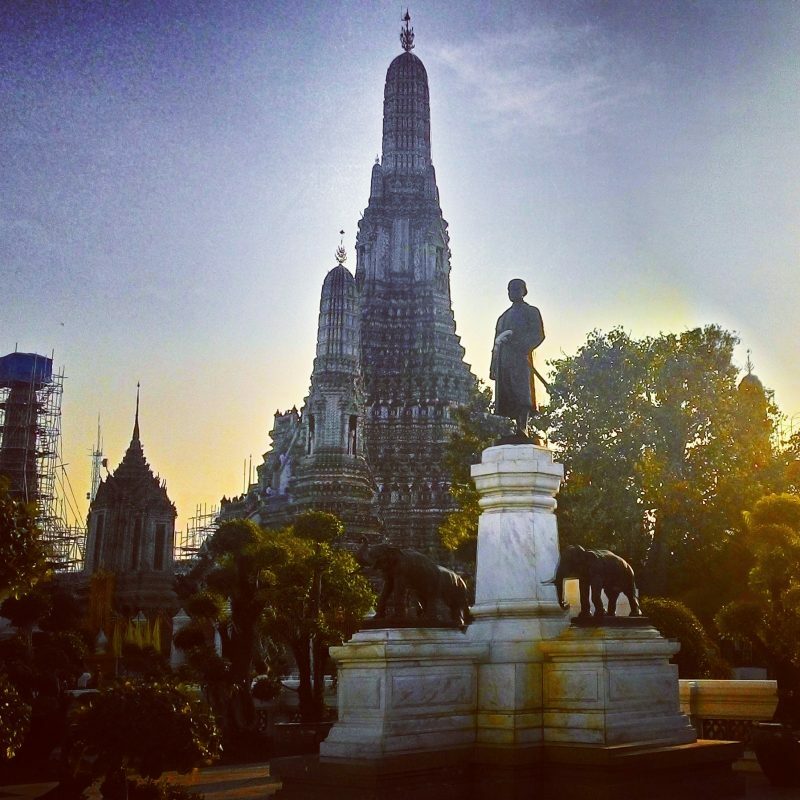 After a fulfilling (and rather silent) hour or so in the museum, I left and made my way to a more mainstream tourist attraction, Wat Arun, or the Temple of Dawn. I had visited the Grand Palace on my previous visit to Bangkok thus this was my only temple visit this time. 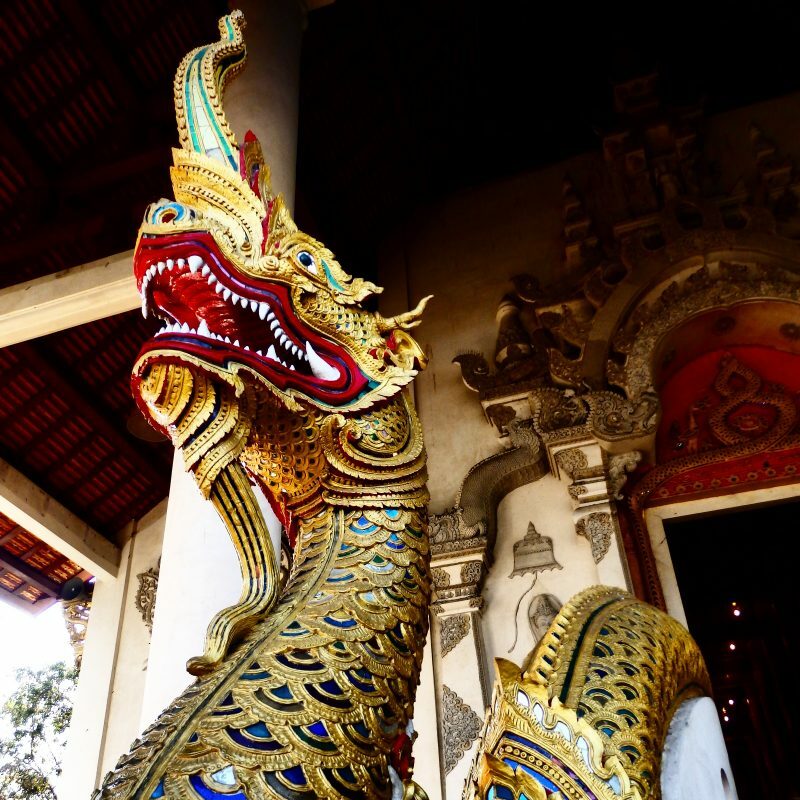 Despite being crowded with tourists, and the temple being under restoration when I visited, Wat Arun was still a beautiful place to visit. I’d recommend visiting late in the afternoon, and crossing the river to see the sun set behind the spectacular central phrang of the temple. Some black spot appeared on my camera that day so the photo below was the best I could get (from my phone), but I’m sure you’ll be able to get much nicer views of the temple than that around sunset. Beautiful temple along the Chao Phraya river. After getting a little lost on the way back to the hostel, grabbed my bags and took a minibus from Victory Monument BTS station to Kanchanaburi, about 3 hours away. It was quite a change from the bustling city, to a much more serene town with a somewhat dark past. Almost everything was dark and closed by the time I arrived. Fortunately, I was able to get a hot bowl of glass noodles soup and some mango sticky rice before calling it a day at a simple but sufficient guesthouse. Had a room to myself with attached bath (no hot water) for the same price as the dorm bed I had in Bangkok. 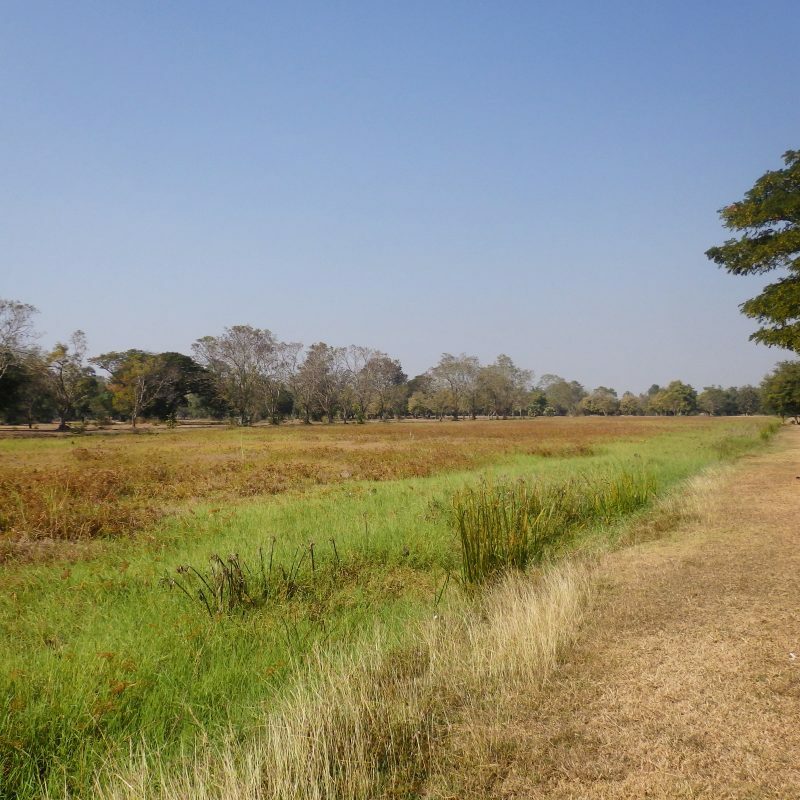 Kanchanaburi is perhaps best known as the setting of the Death Railway/ Burma Railway, an infamous project initiated by the Japanese during the Second World War, using prisoner and civilian labor. It is estimated that over 100,000 peopled died in the treacherous conditions building the railway. 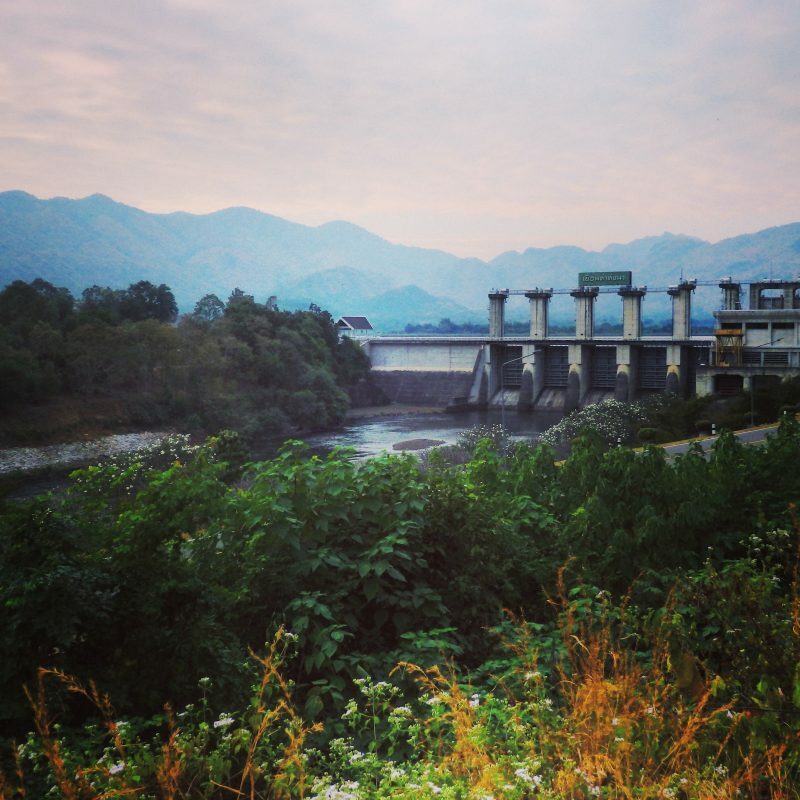 Today, many reminders of this past remains in Kanchanaburi, leaving a slightly dark side to this otherwise slow paced town surrounded by beautiful scenery. Hoping to be able to catch some of this scenery a little out of town, I got a bike and first sought out some stops within town. The Thailand-Burma Railway center, beside the war cemetery, was a good place to start to get a context of the events that happened. Had learnt a little about the Death Railway in primary school and the exhibits helped refreshed my memory and put these little bits of information into perspective. Kanchanaburi War Cemetery. 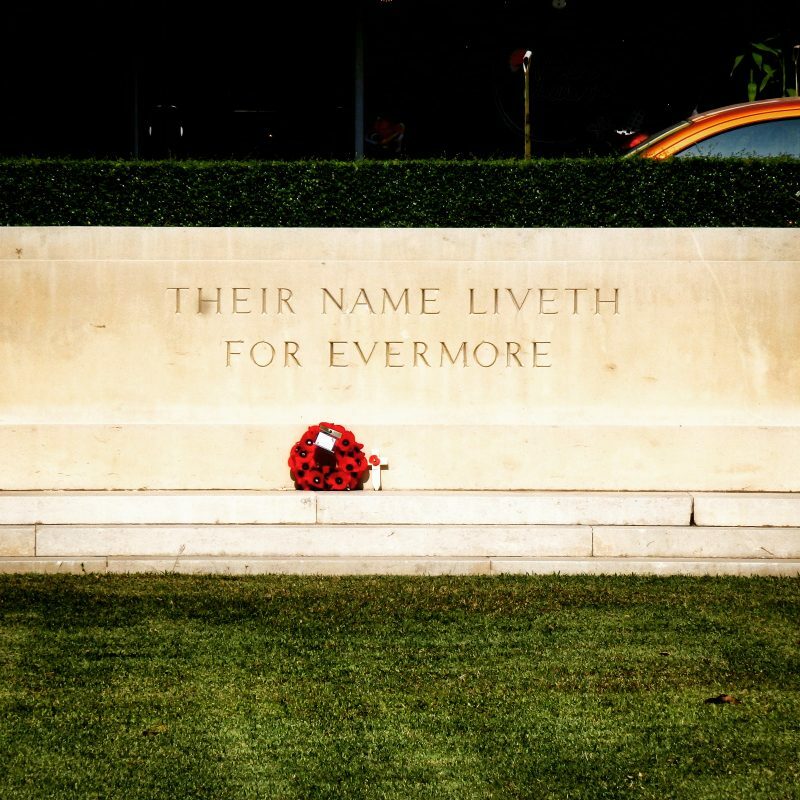 Final resting place for thousands of prisoners of war who died building the Burma Railway in WWII. Back at the start of the trail, at the memorial museum, on the viewing deck outside. 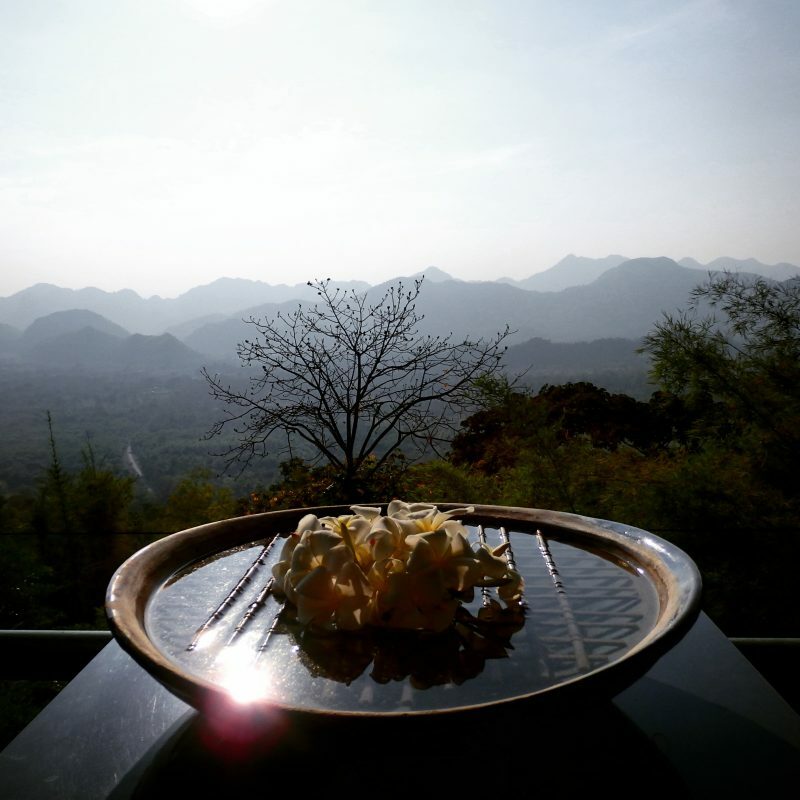 Overlooking the stunning Kwae Noi Valley. 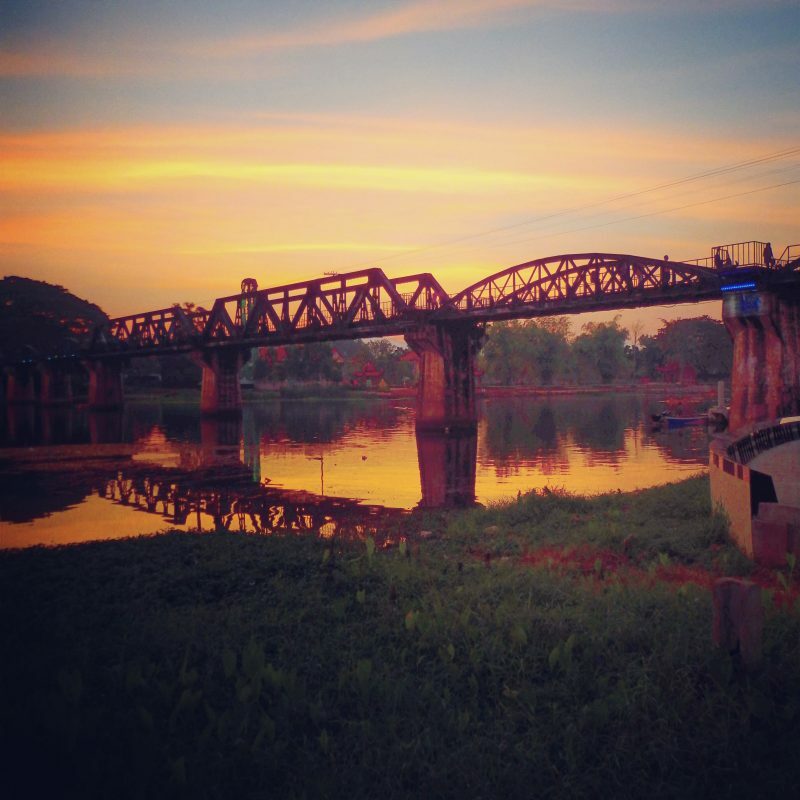 Then it was another 75km back to town, to catch sunset over the infamous Bridge over River Kwai, one of the surviving sections of the Death Railway. It’s possible to cross the bridge on foot, but I was lazy, so here’s an Instagram filtered shot of the bridge before it got too dark. Infamous bridge built with prisoners’ labor, and the subject of an acclaimed movie a decade after the war. Caught the train crossing too! Probably going really slowly because there were many people on the bridge. 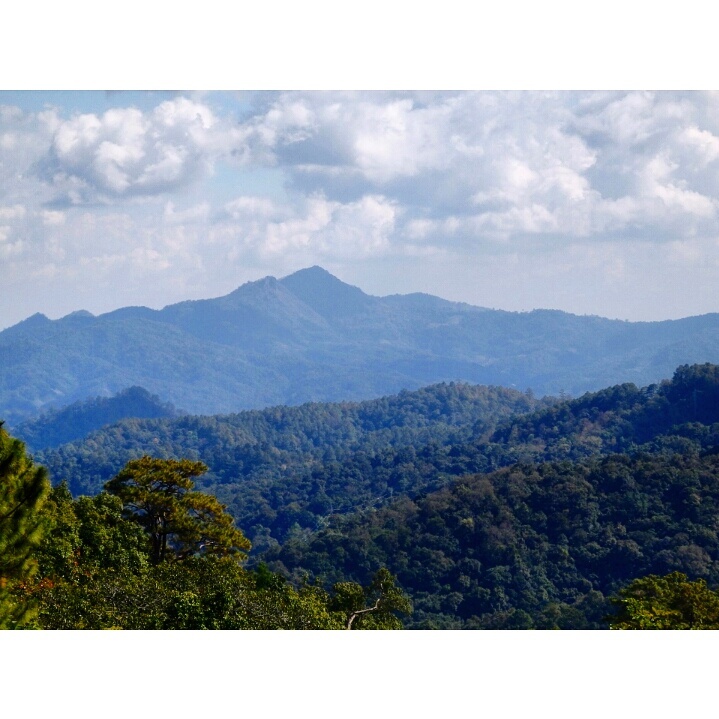 Day 4 started with a 50km ride out of town to the other side of the ridge, the Erawan National Park. 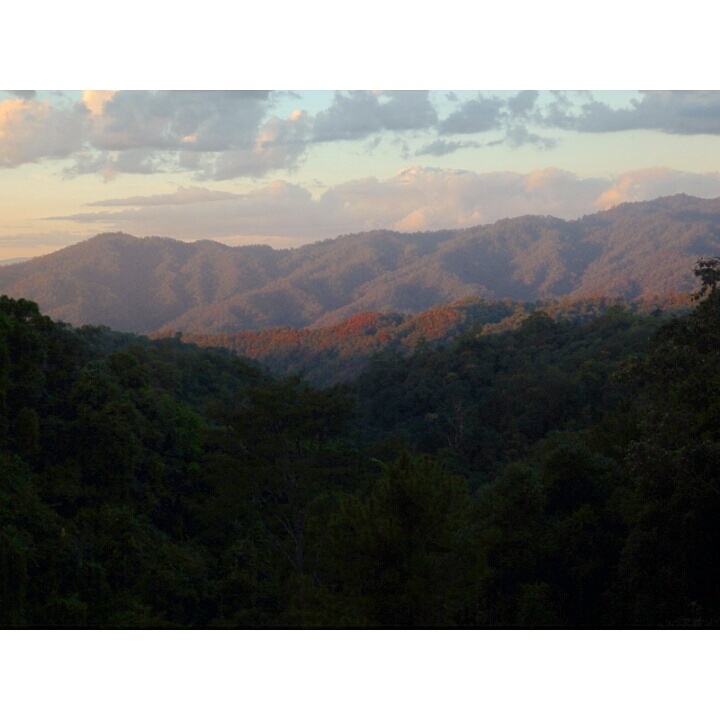 Road conditions were good and the scenery was great, as the route cuts through forests, snakes alongside rivers and crosses valleys. 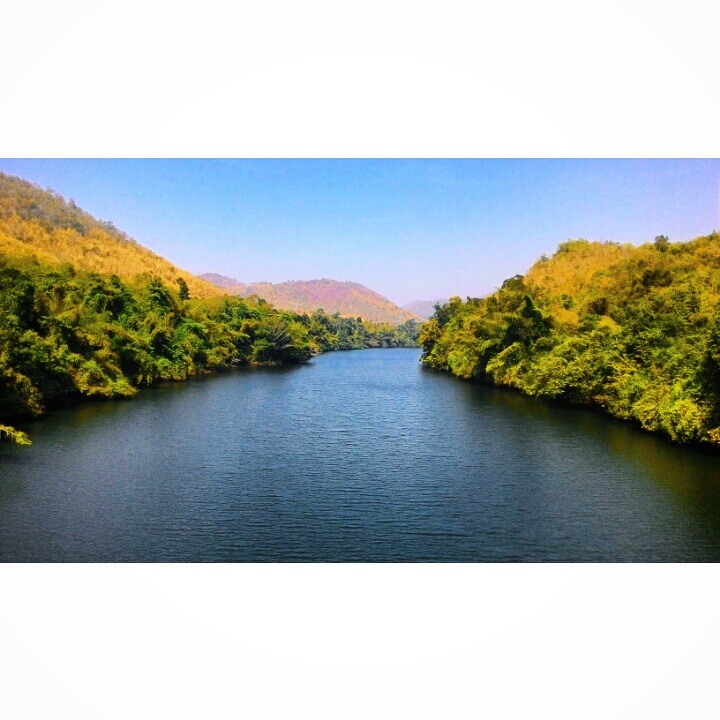 Beautiful scenery along the route from Kanchanaburi and Erawan National Park. 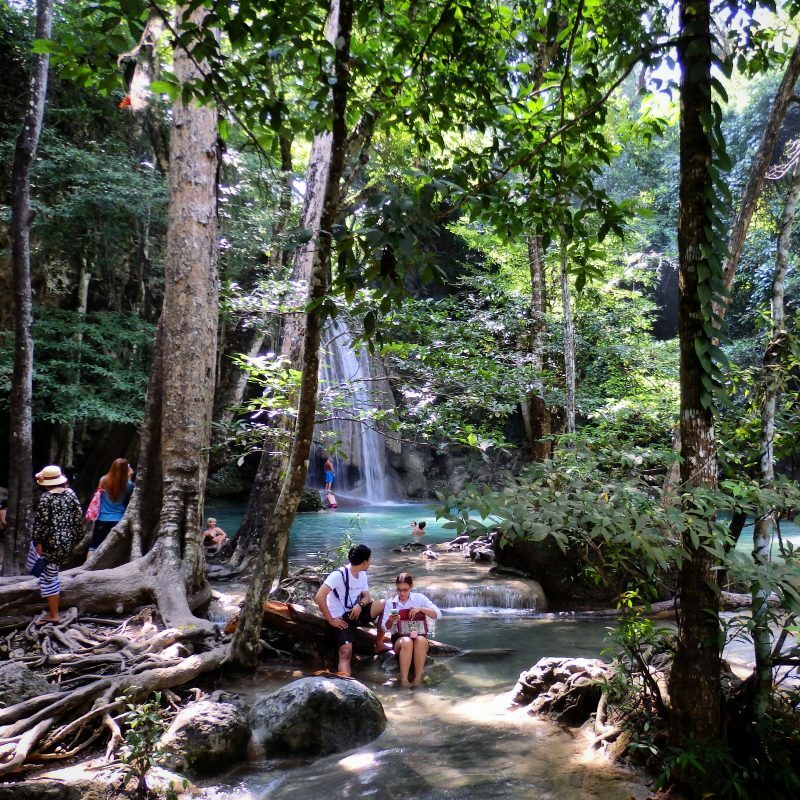 Erawan National Park is famous for the Erawan Falls, a series of beautiful waterfalls frequented by locals and tourists. The pristine waters and surrounding forests made the ride up worth it, and if any level of the waterfall was too crowded or if you’ve gotten bored or it, just head to the next tier. At the different tiers of the waterfalls. 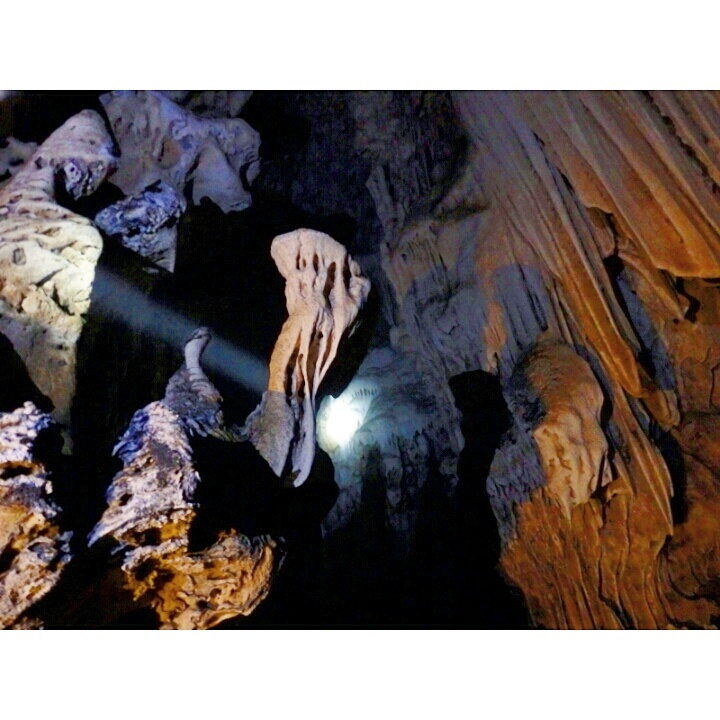 Amazing caves near Erawan Falls. Looked amazing, but it was hard to get pictures. This was one of the few clearer shots. After that, slightly over 60km back to town. 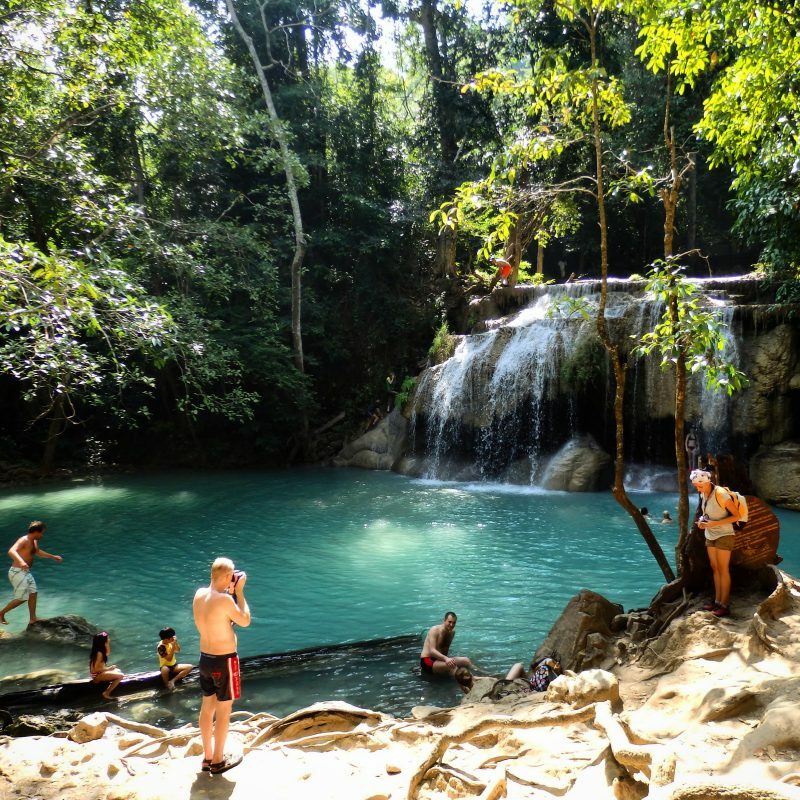 I think there is public transport to Erawan Falls but not the caves (need to verify). Stopped a couple of times on the way back to enjoy the scenery. 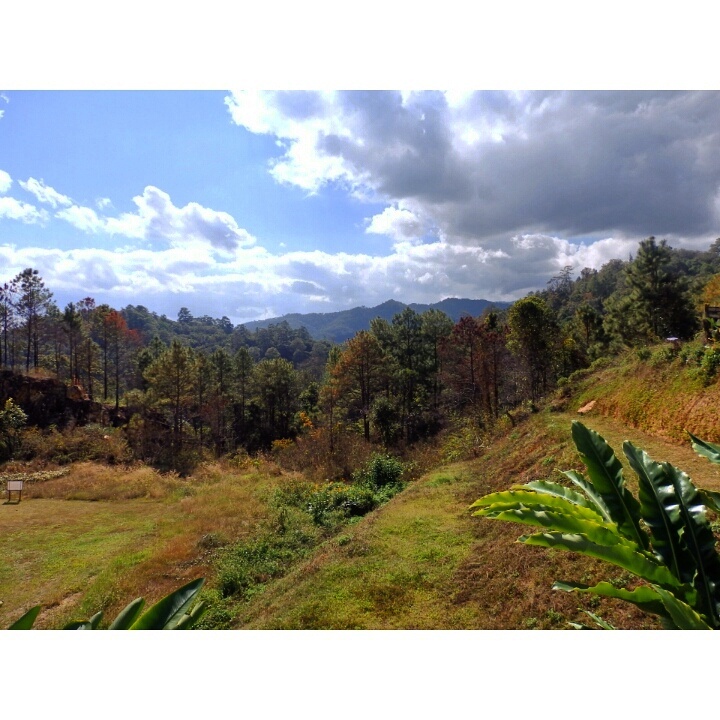 Along the highway between Erawan National Park and Kanchaburi Town. Back at Kanchanaburi, somewhere in the evening, I picked up my bags and took the minibus back to Bangkok to spend the night, before heading up north the next morning. Grabbed some breakfast to go on the way to the Hua Lamphong Station in Bangkok for the train to Ayutthaya. It was quite easy getting the tickets, and there were students (I think?) who were on hand to help if any English translation was required. In that hour or two on the train, the scenery transformed drastically, and gone were the crowd of people and tall buildings. 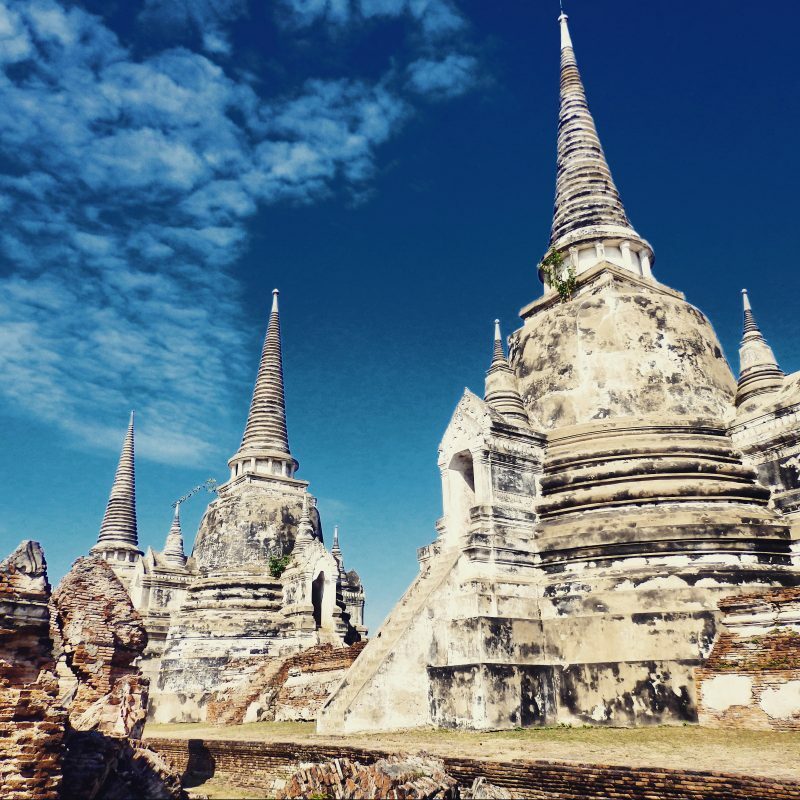 I dropped by bags off and rented a bicycle from the guesthouse (probably paid for the room and rental of the bicycle for around $10), and cycled off to explore the ruins of Ayutthaya. The different compounds were in varying states of degradation, and some were being restored. Nevertheless, the temples were magnificent to explore. 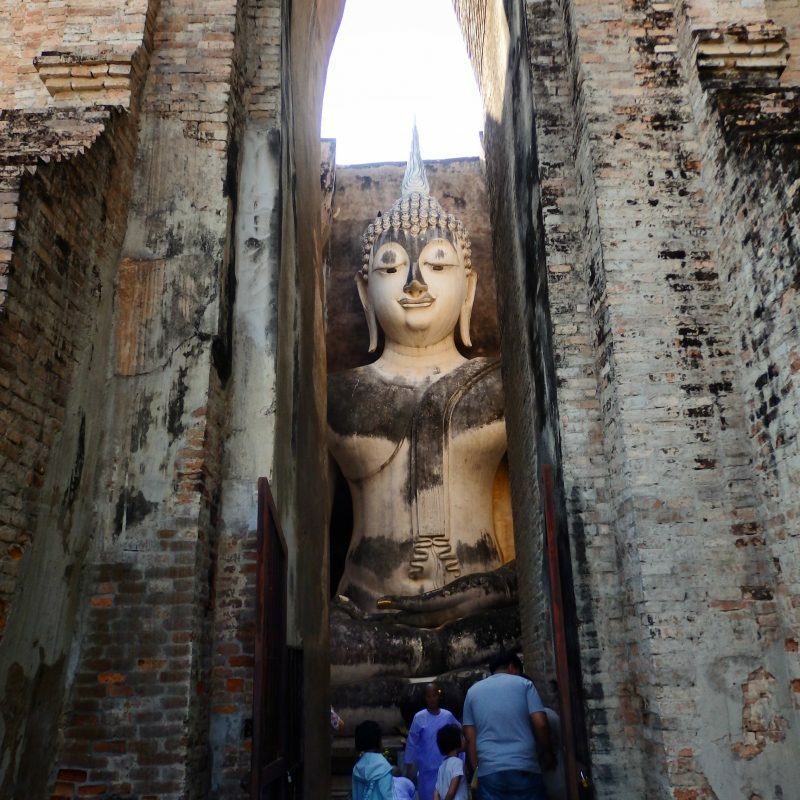 Took me awhile to figure out which places to visit in Ayutthaya but the temples below pretty much sums it up. Once the largest and grandest cities in the world, till invading Burmese gave an abrupt and violent end to the second capital of Siam. Wat Ratchaburana, which had an underground chamber with mysterious wall paintings. At Wat Mahatthat. What (or should I say, Wat?) 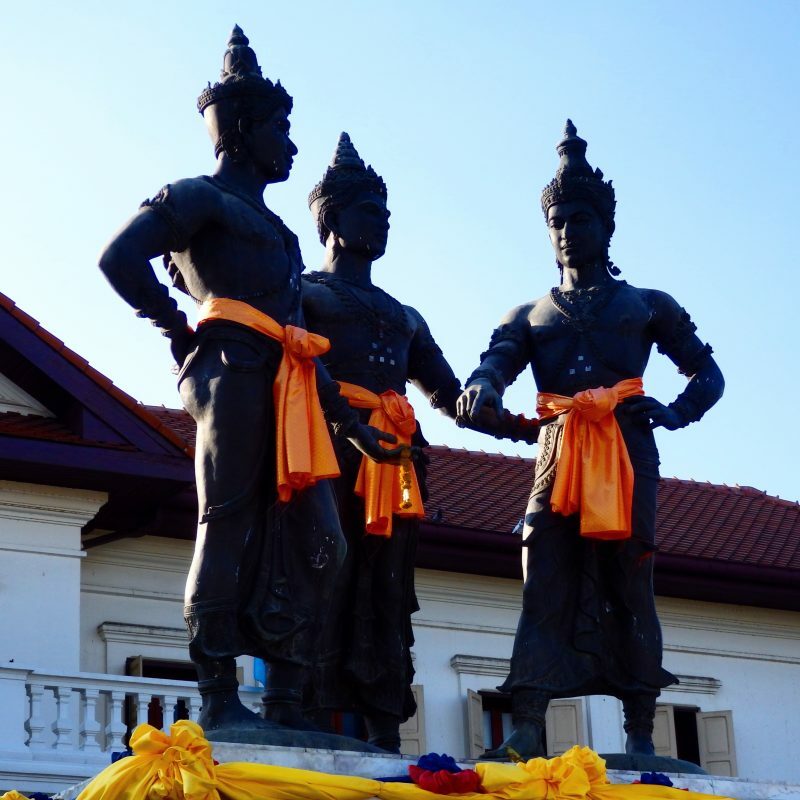 almost everyone came to Ayutthaya for. 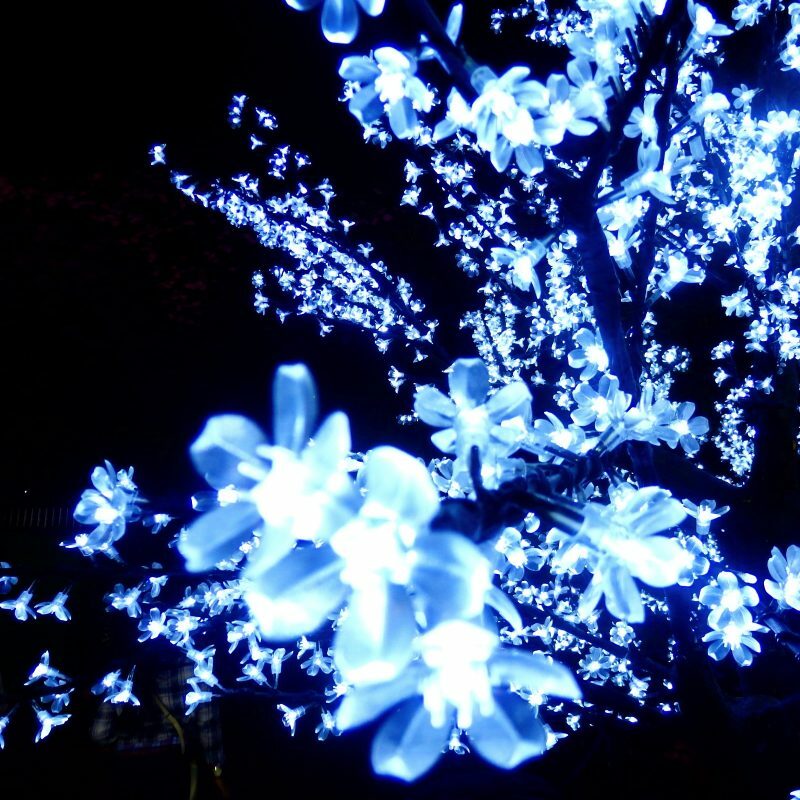 It was Christmas that day, but no one really cares, out in the suburbs in Southeast Asia. 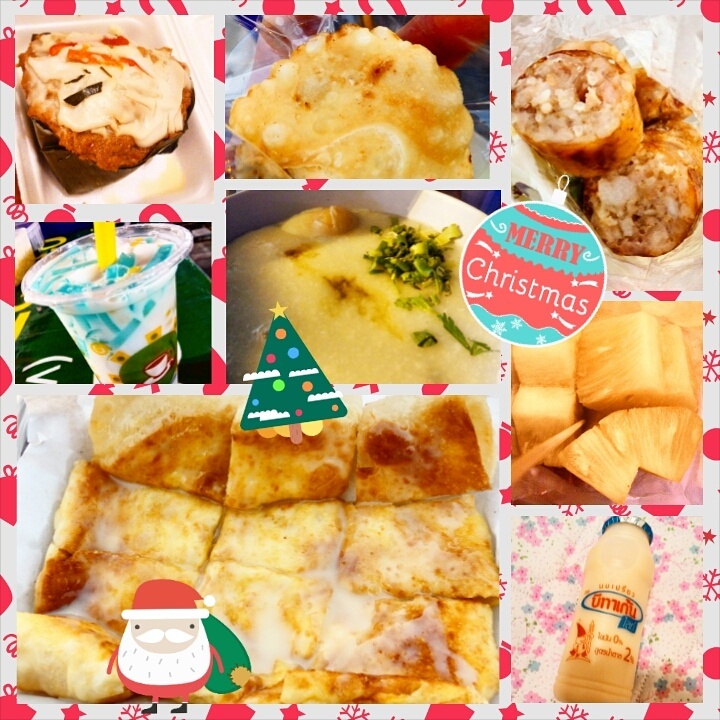 Actually, I usually don’t too, but needed an excuse to binge on some food at the night market. A small selection of the wide variety of food available at the night market. 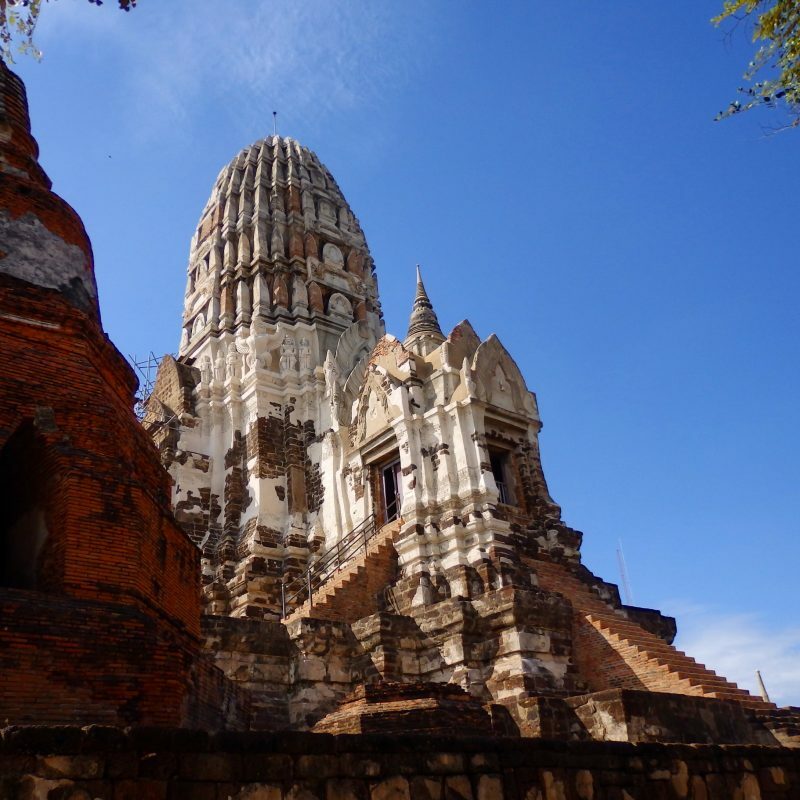 Ayutthaya is quite a nice place to wander around if not for the rather warm weather. First stop, Wat Phra Si Sanphet, once the Royal Palace, and one of the holiest sites in Ayutthaya, housing the remains of past kings. Raiders of the lost Ark at Wat Phra Si Sanphet. Gravity defying pillars still standing after hundreds of years of neglect. 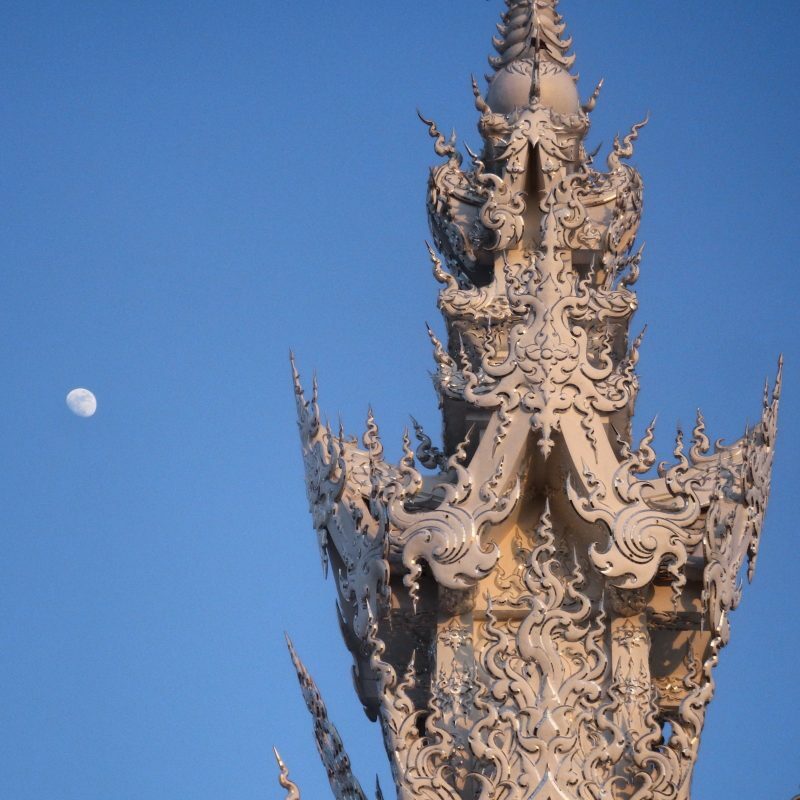 Restored Chedis at Wat Phra Si Sanphet. A couple temples laters, at the last stop, Wat Chaiwatthanaram. It was a little out of the way, but I’m glad I didn’t miss it. I guess it’s one of the most recognised temples at Ayutthaya for a good reason. Spectacular temple grounds at Wat Chaiwatthanaram. 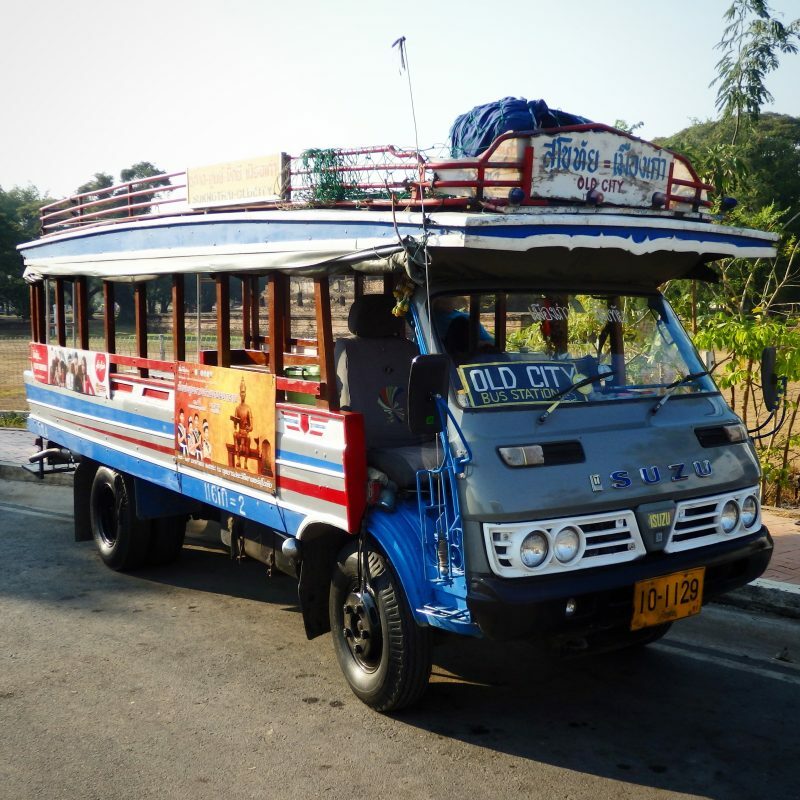 Later that day, continued my tour of Thailand with an overnight bus to Chiang Mai. Buses heading north (towards Chiang Mai and other cities) stop by the road outside of town. I had bought my ticket in town the day before. 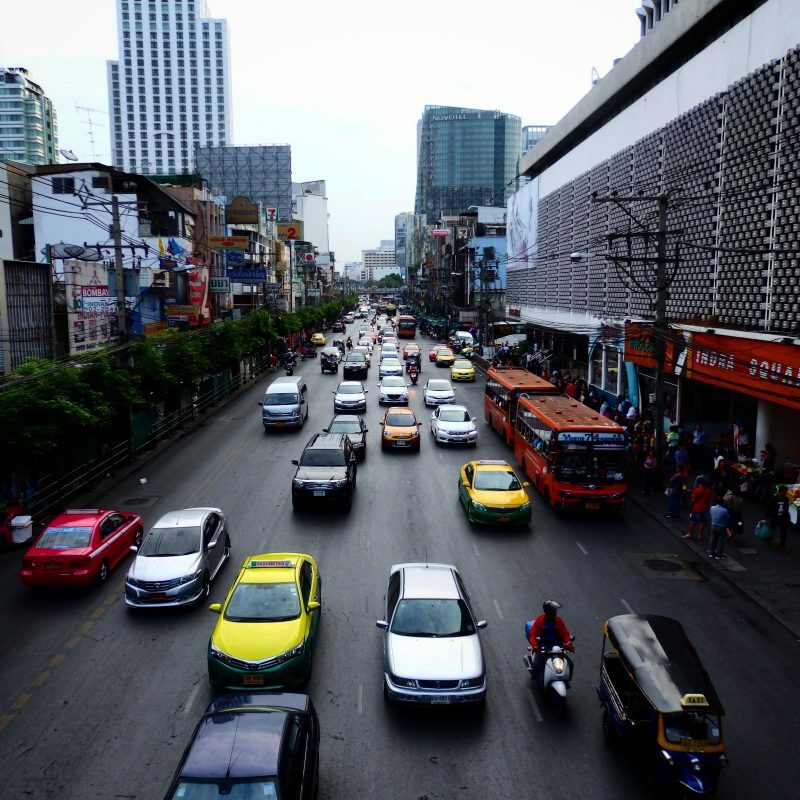 It was kinda chaotic without bus station/ berths, and the touts, bus delays and my inability with Thai complicated matters slightly. I was glad to finally be able to find my bus, and snuggled in for the night. A little too tired to mind the lack of a proper bed. Woke up next morning in Chiang Mai feeling kinda rested. Washed up at the hostel, then headed straight to grab a bike (or scooter?) and went looking for coffee and breakfast before heading up the Doi Suthep, a mountain overlooking Chiang Mai city. 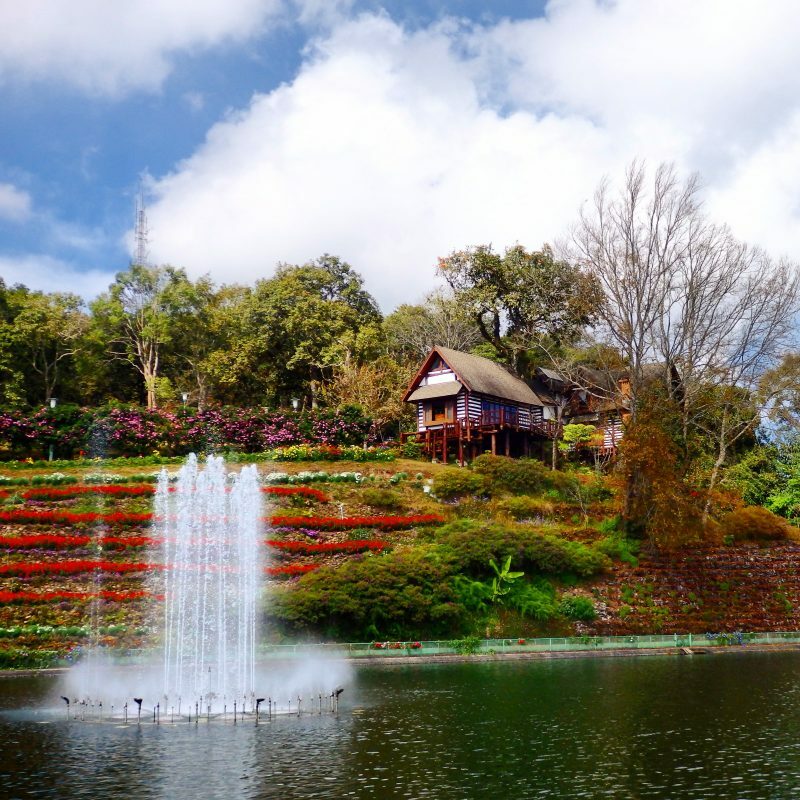 Up on Doi Suthep, I first made a stop at Bhuping Royal Palace Gardens, royal residences that’s usually open to the public. Probably one of the most beautiful residences and gardens around. I guess the climate at the higher altitude helps with the flowers too. Beautiful gardens at the royal residence. Paradise recreated. But not for commoners. 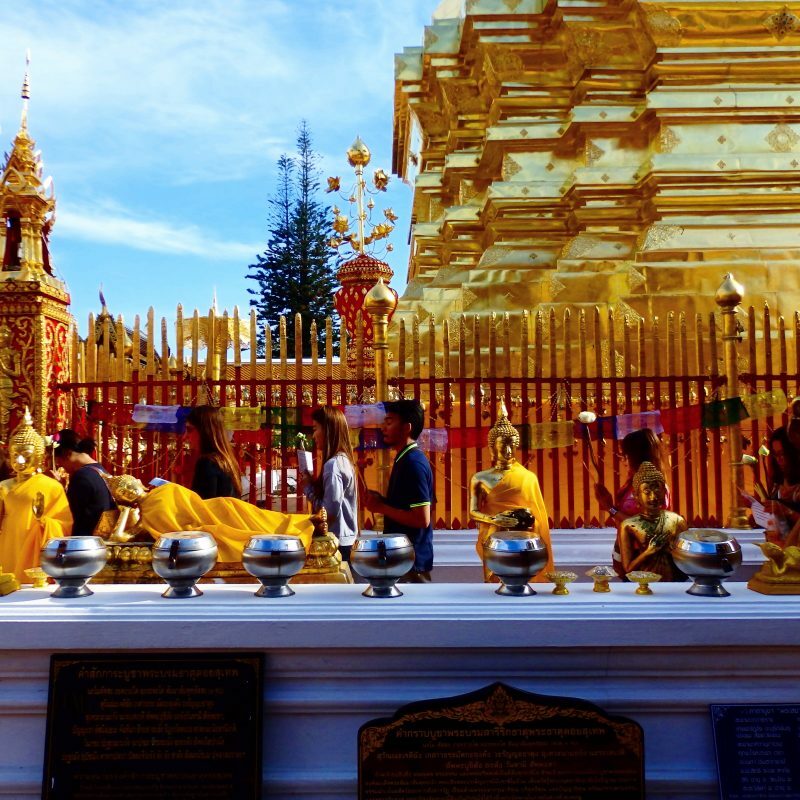 Also on Doi Suthep, or what most tourists come to Doi Suthep for, is Wat Phrathat Doi Suthep, with a legend behind the founding of the temple involving an elephant. 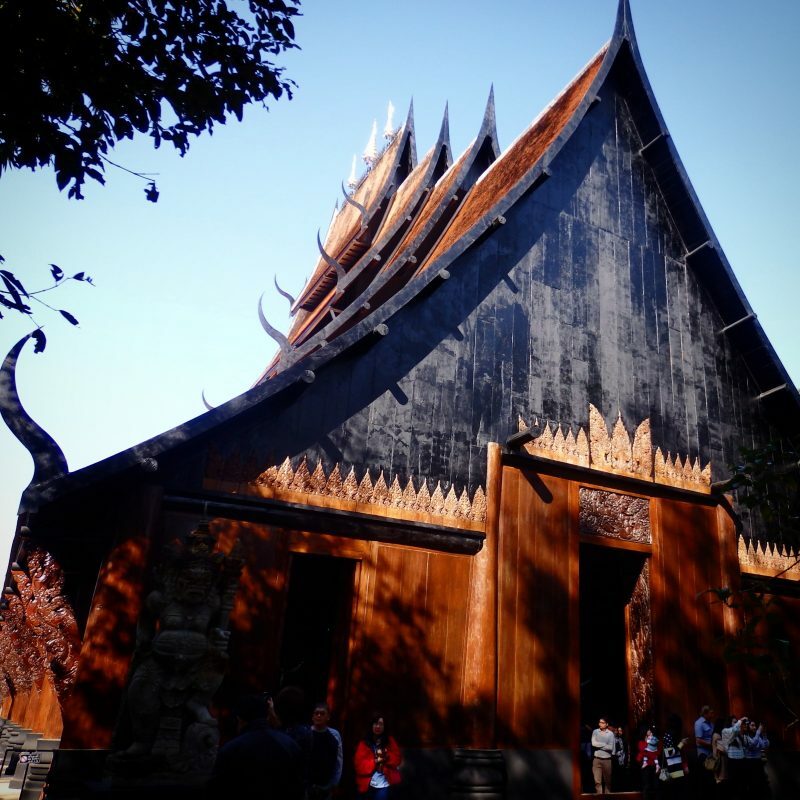 Magnificent temple over a kilometre above Chiang Mai, 18km away, with great views of the city. Golden Stupa at the sacred temple. 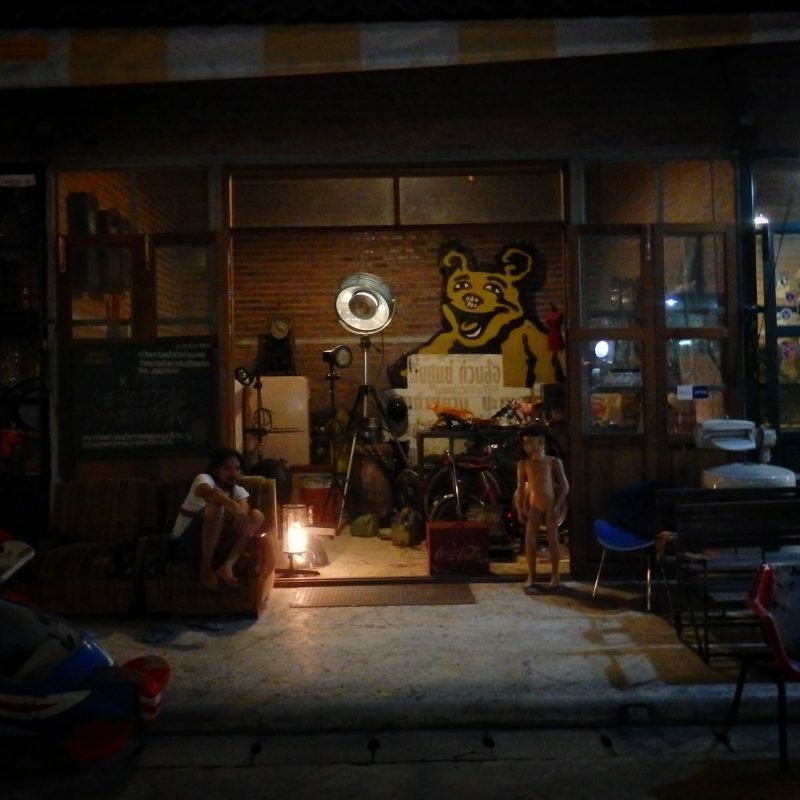 Nice long and windy ride back down the mountain to Chiang Mai, where I stopped by Bay’s Cafe for some drip coffee. Chiang Mai has some really nice cafes, and I’m glad to have stopped by Bay’s. In the same compound was Food4Thought, which served great vegetarian food (I had Food4Thought for breakfast). There couldn’t have been a more awesome combination. 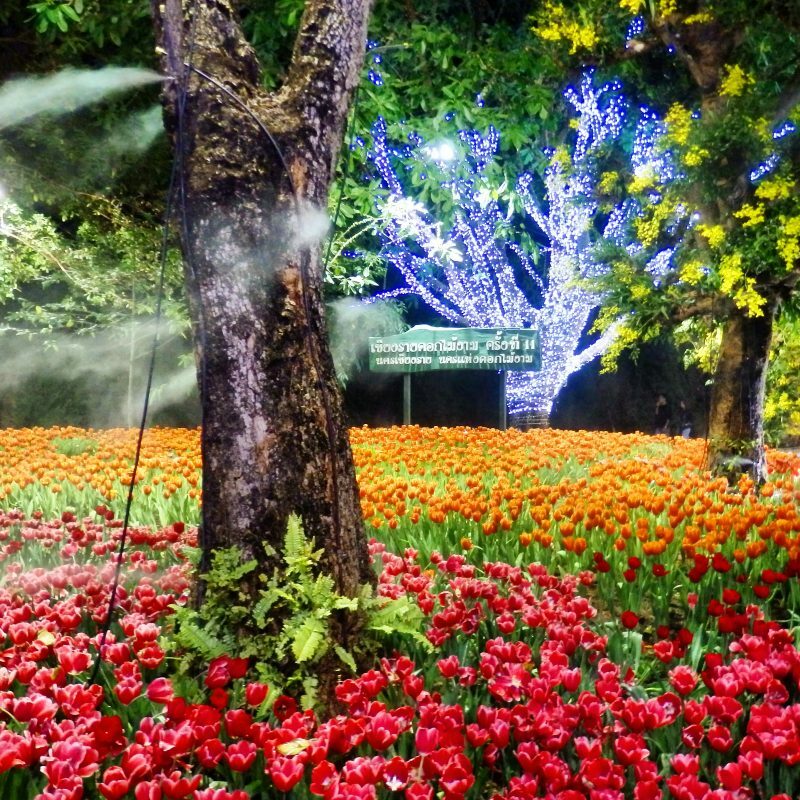 Would definitely be on my to do list if I were ever to be back at Chiang Mai. 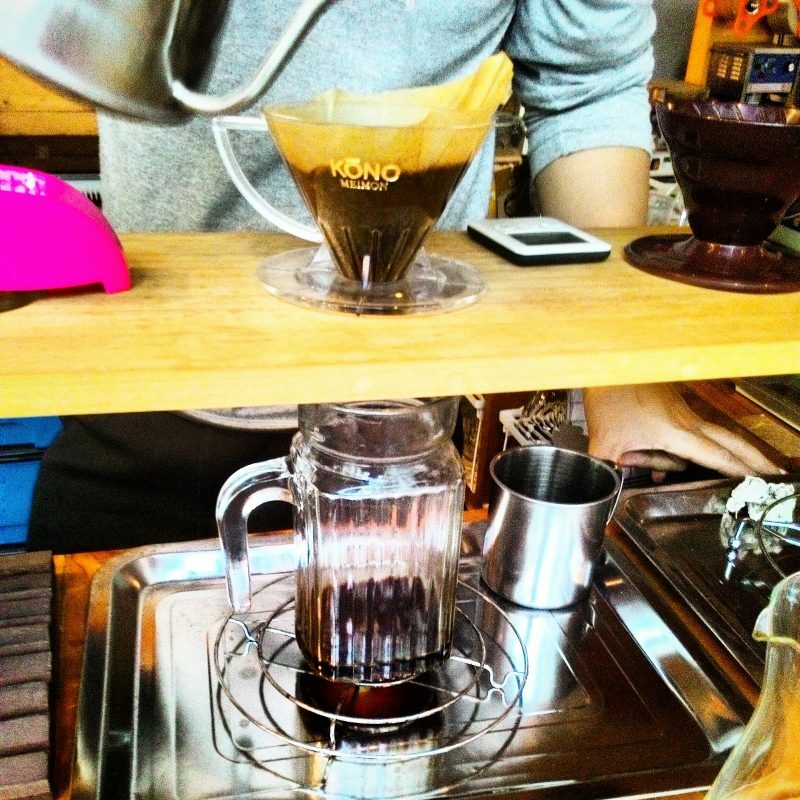 Drip coffee by someone really passionate about his craft. Spent the day exploring temples within the old city walls. Should be manageable on foot, but more manageable on bike. 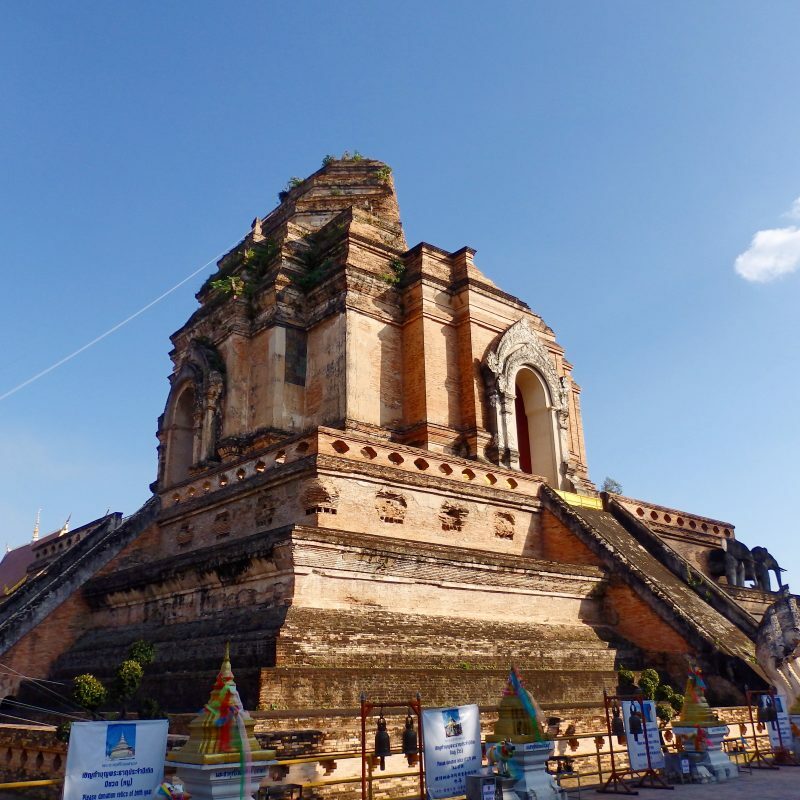 #excusesforlaziness There are many grand old temples within the city walls, having been the capital of the Lanna Kingdom many, many centuries ago. 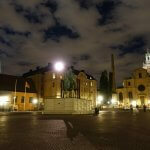 Most have been modernly restored, but still lend an air of mysteriosity to the ancient but bustling city. 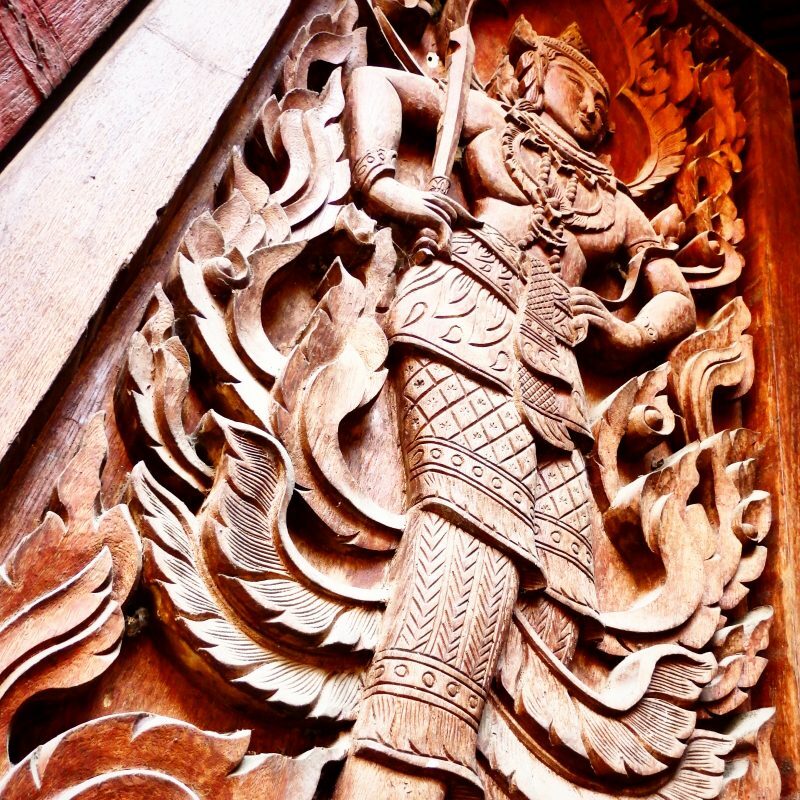 Carved wood panels at Wat Phra Singh. 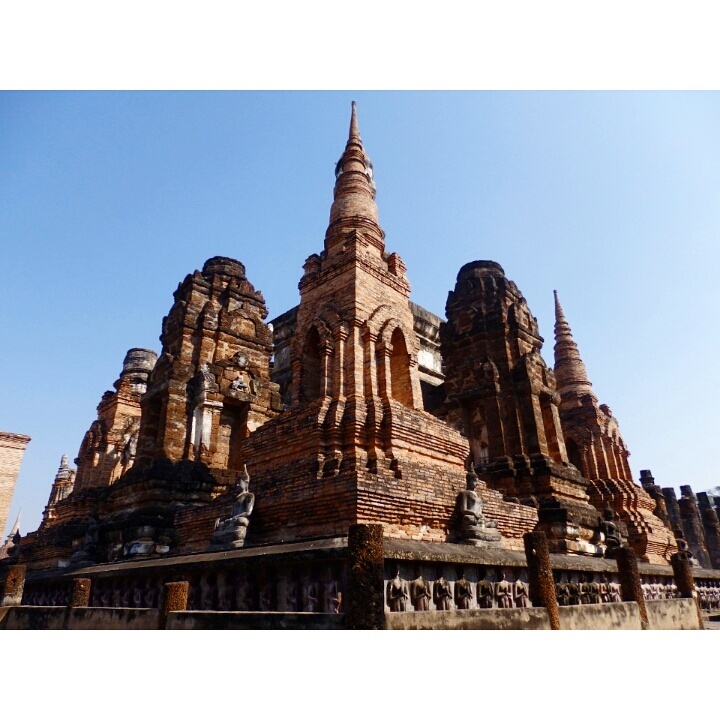 The main attraction of Wat Chedi Luang, the enormous Chedi in the middle of the walled city. Was one of the largest buildings in the 15th century. Still huge even after losing good portions of the structure to an earthquake in the 16th century. Three Kings Monument, good meeting spot in the city. 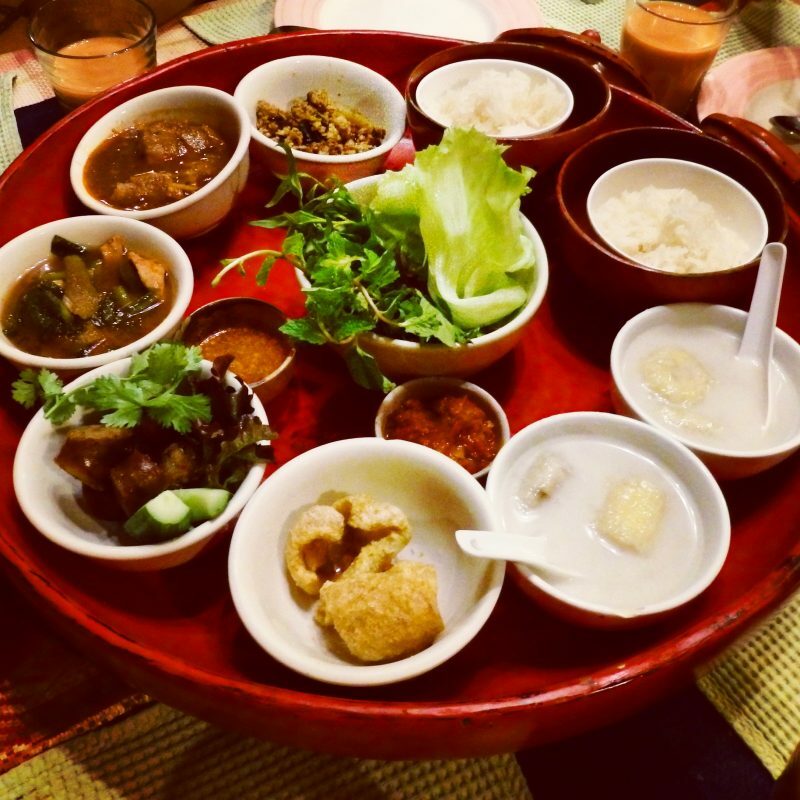 A friend whom I first met in Taiwan was coincidentally in Chaing Mai, so we met at Huen Phen, which seemed like a popular spot to try out Northern Thai Cuisine. Interesting decoration, food was decent but felt a little too tourist oriented. Met another friend, who was from Chiang Mai, and whom I had first met in Singapore at a university event after dinner, to explore the Sunday night market within the city walls. 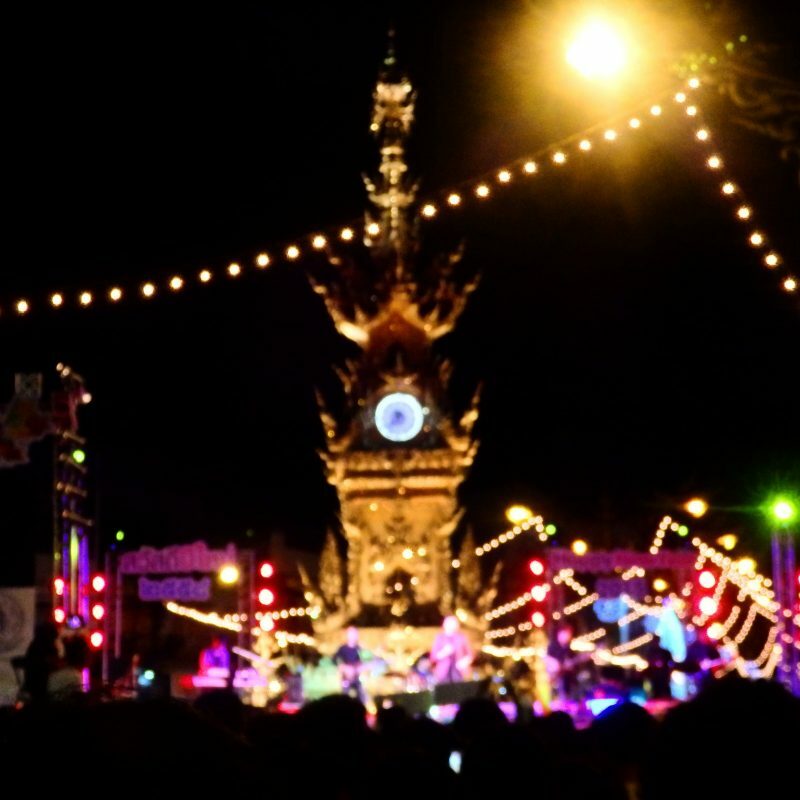 This was a totally different facade of Chiang Mai from the one I experienced earlier in the day. 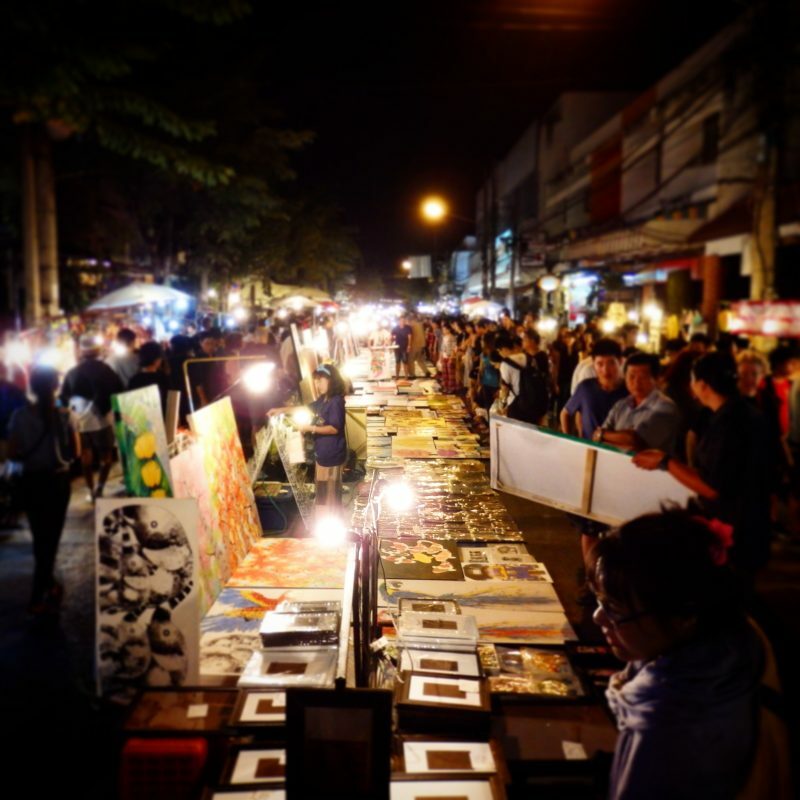 One of the more fascinating night markets I’ve been to, with lots of arts and cultural stuff (other than having lots of delicious looking food). 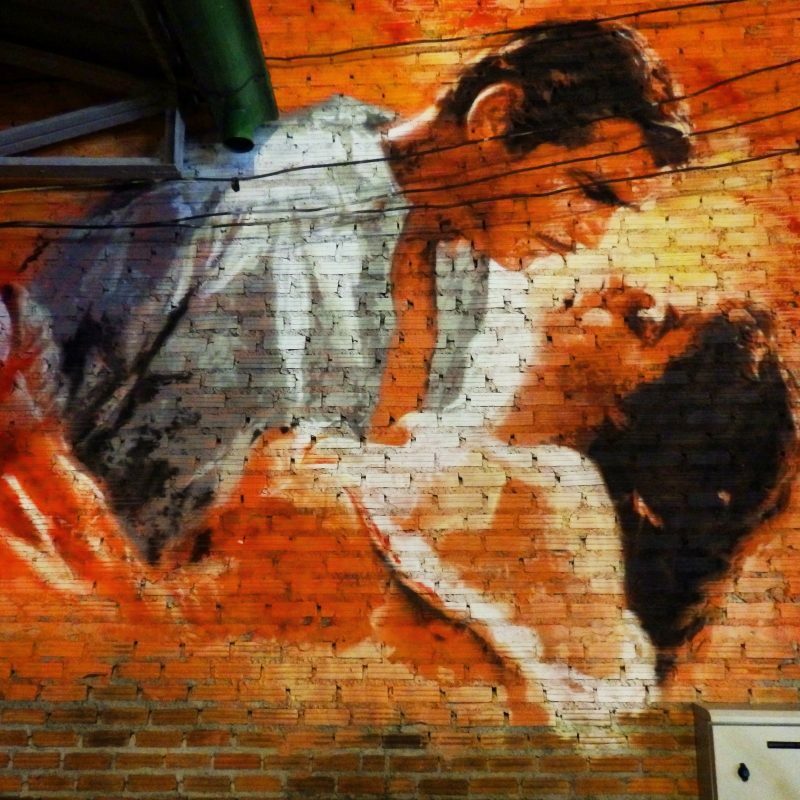 Probably the other side of Chiang Mai that it is known for, the hip and artistic side. Thanks to my friend for bringing me there! With that, it was time to move on, to what was probably the craziest idea of the trip. I had originally not planned to visit Pai, some distance from Chiang Mai, but upon some raving recommendations from a colleague who had stayed in Chaing Mai for some time, I figured it should have something good. 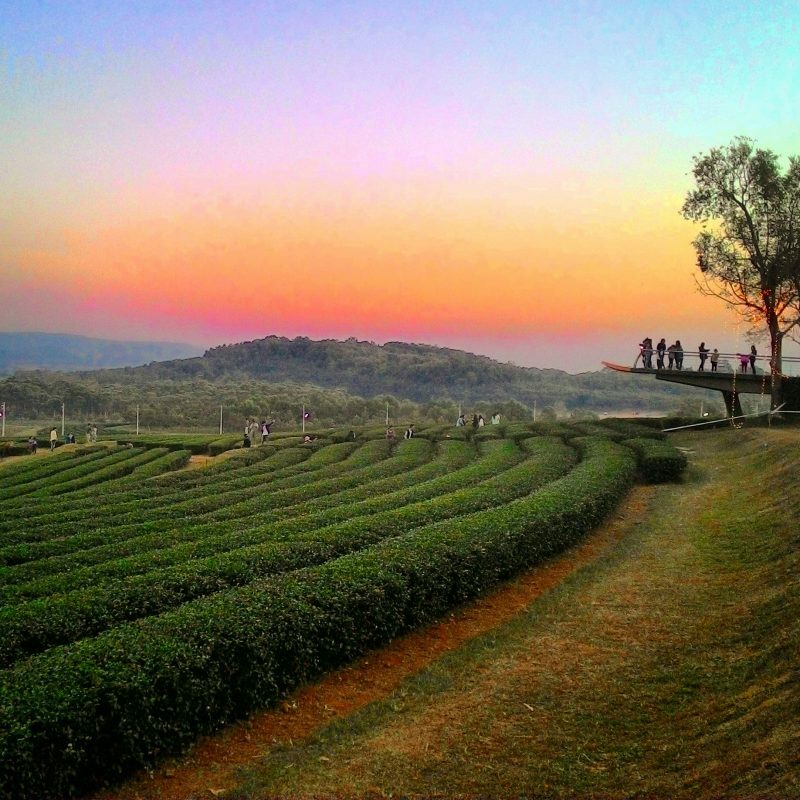 The decision to visit Pai wasn’t the crazy thing, but deciding to ride there was. 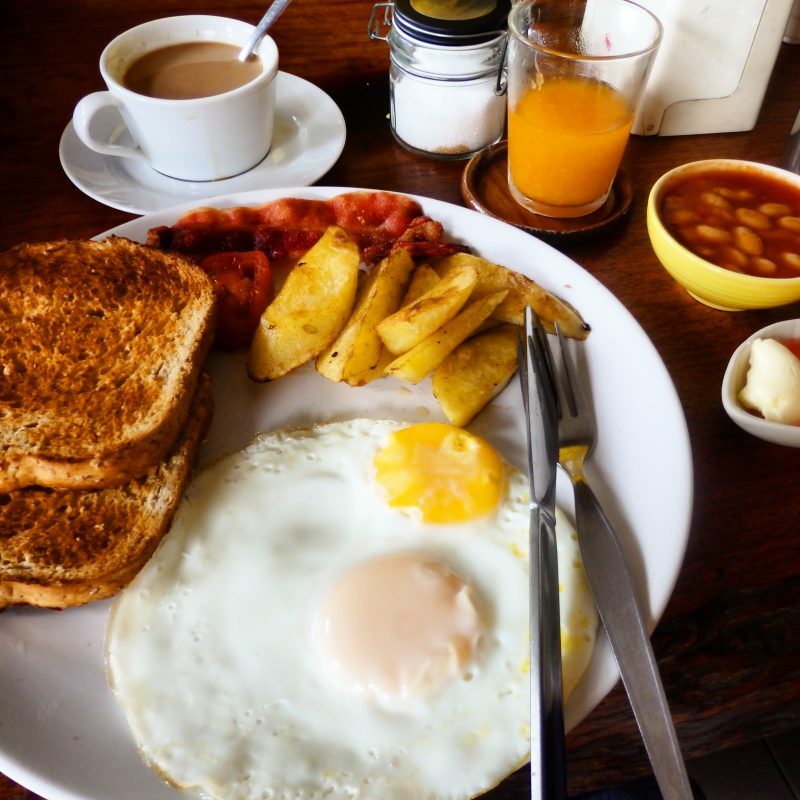 Hearty and affordable breakfast at the hostel. 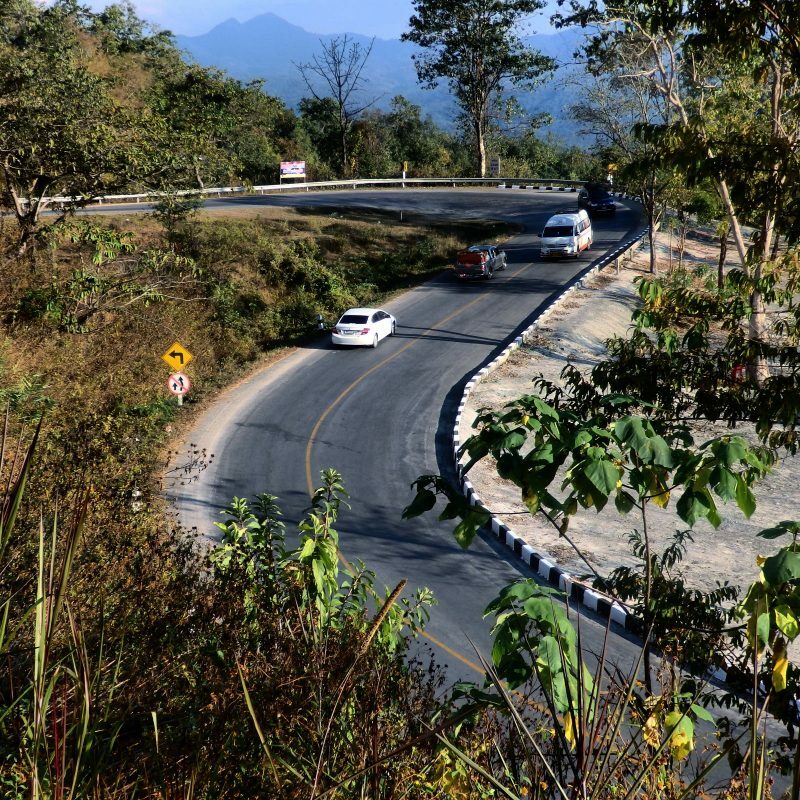 Then made my way down highway 1095 from Chiang Mai to Pai, famed for its 762 sharp bends over 136km through the mountains. It was a steep learning curve, both figuratively and literally. While the bends were manageable to handle with some patience and lots of composure, I must admit I underestimated road conditions up in the mountains. Got into a minor(?) incident and delayed by a couple of hours. Lost some blood, a pair of jeans and a side mirror, but otherwise good enough to continue the journey. Not really recommended for people on the fifth fifth time riding in their life. Highway 1095, Chiang Mai to Pai. Got myself patched up and continued the rest of the way to Pai, enjoying the amazing scenery along the way. After an arduous ride, finally arrived at Pai just before last light, in time to catch sunset on the Memorial Bridge at the entrance to Pai. 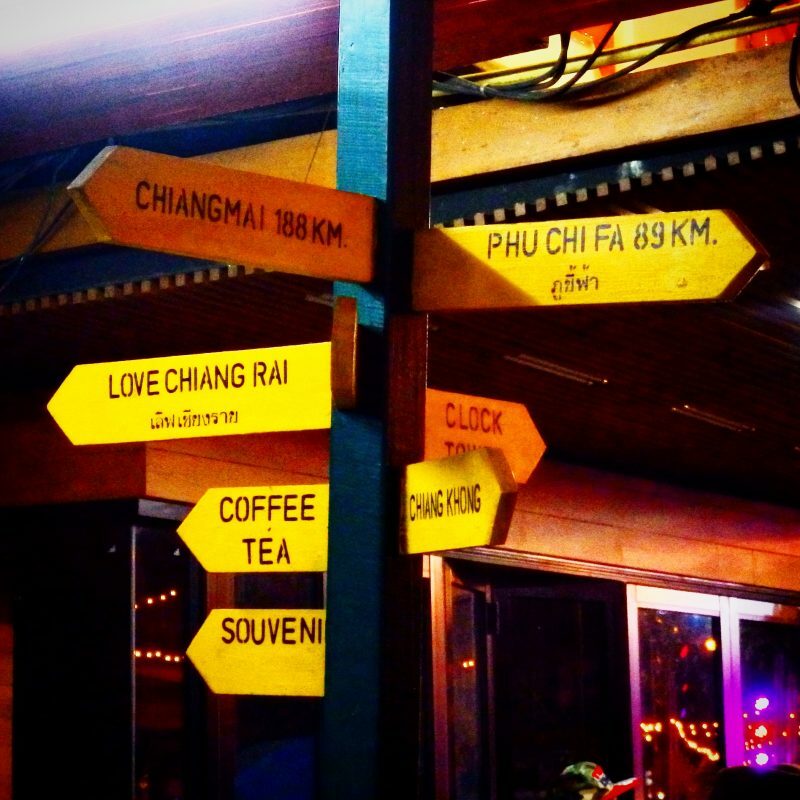 Met friends whom I had dinner with the previous day, for dinner at Pai, and explored the night markets at Pai. 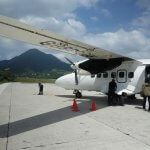 They arrived safely earlier, having made the smart choice of taking the minibus up. Sound advice from Pai. Pretty much hipster paradise, with lots of foreigners staying for the long term to escape from hectic city life. 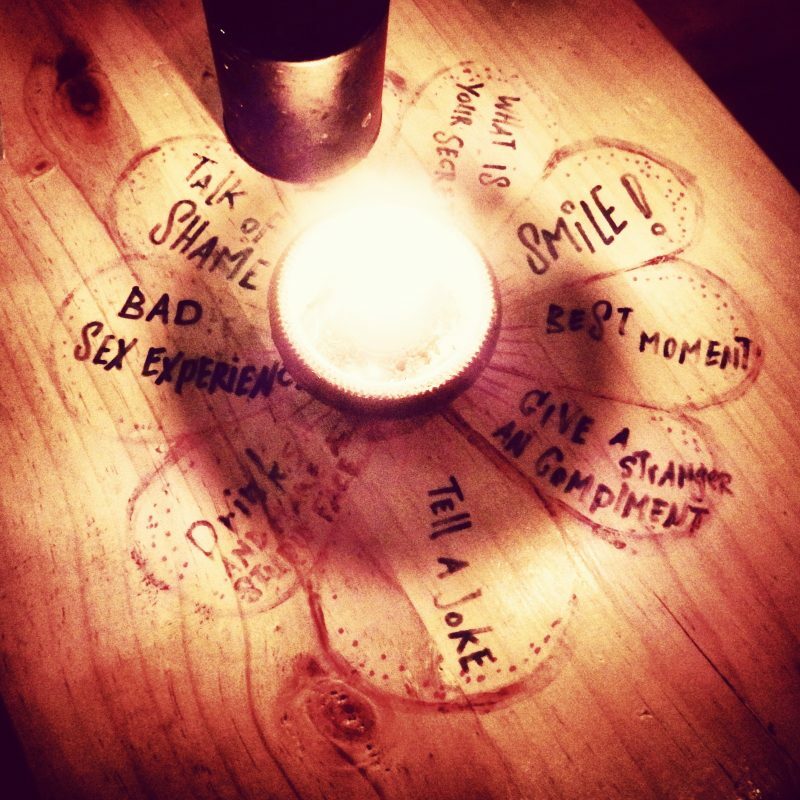 Ended the rather eventful day with some drinks at one of the many bars in Pai. 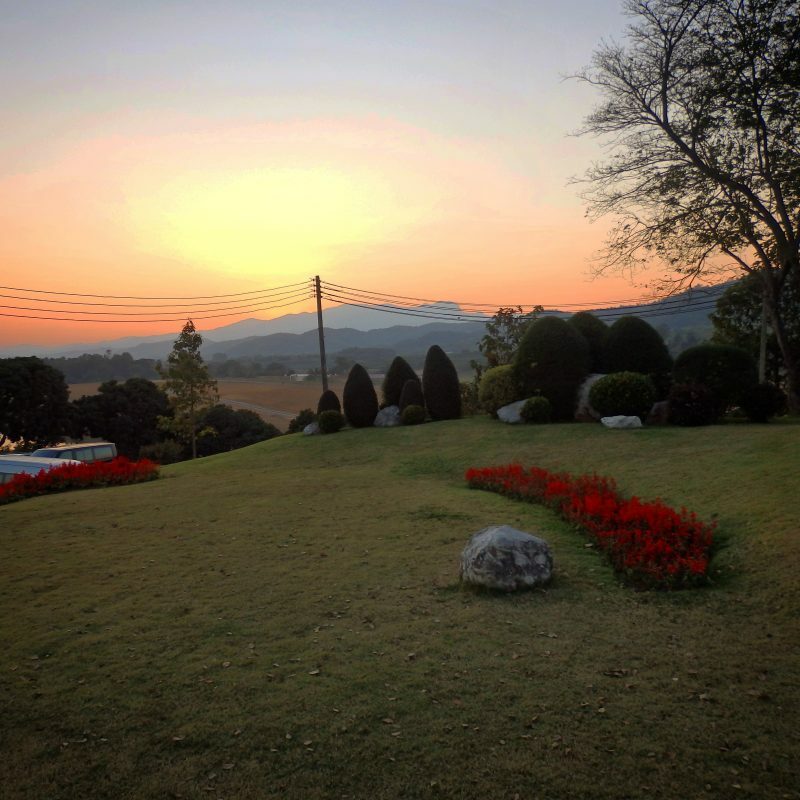 Would have loved to stay at Pai for a longer period of time to check out the nearby attractions, or just to chill in the mountains, in one of the numerous mountainside pool clubs where people soaked in pools reading books or drinking coffee agains the backdrop of lush greenery. Unfortunately, I had made plans to meet another friend in Chiang Rai two days later, so I had to be on my way. 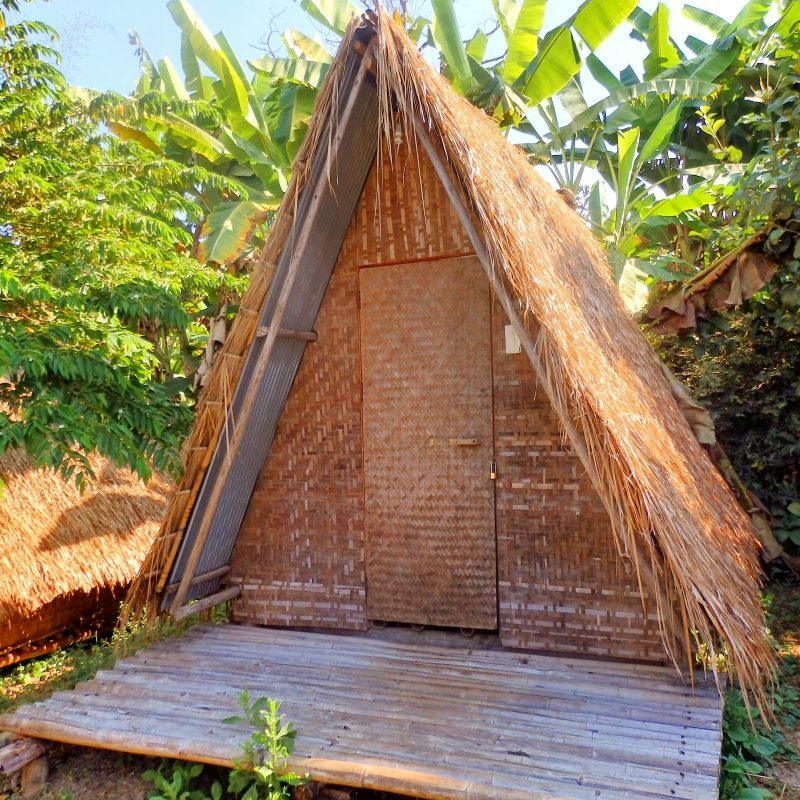 KK Hut Guesthouse, Pai. Where I slept for the night. Although appearing quite rugged on the outside, it was quite comfortable inside with a mattress, fan and wall plugs. Toilet was 20m away though. It was uch cleaner than some of the other hostels I stayed at while in Thailand. There are other more ‘normal’ places to stay in closer to the center of town but I’m glad I made the choice to spend the night here. 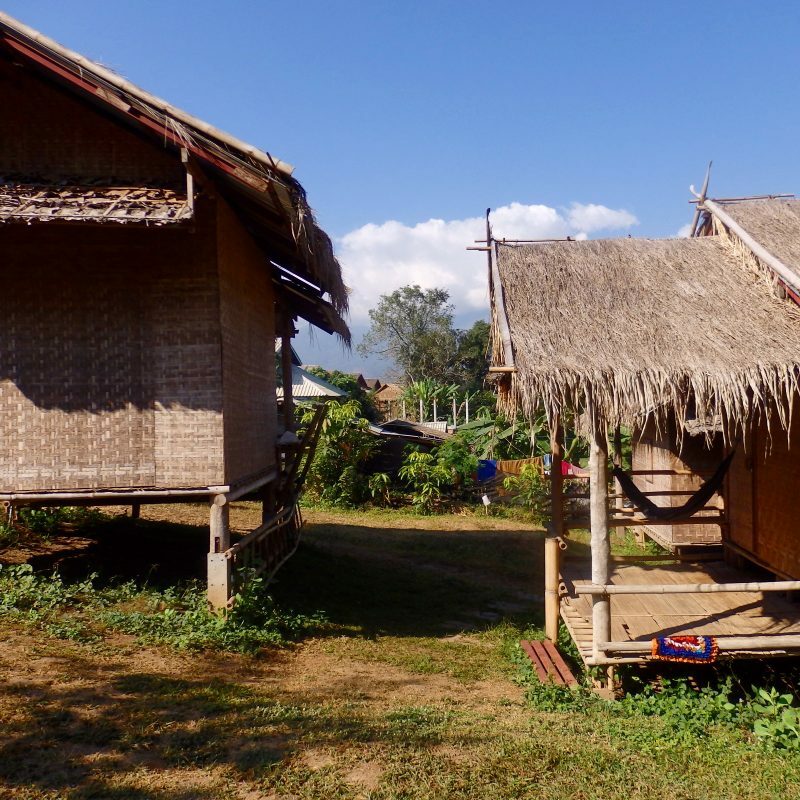 There were also larger ‘rooms’ which came with hammocks on the porch overlooking the fields and mountains in the distance (maybe partially blocked by trees and other houses). Little kittens at the guesthouse. 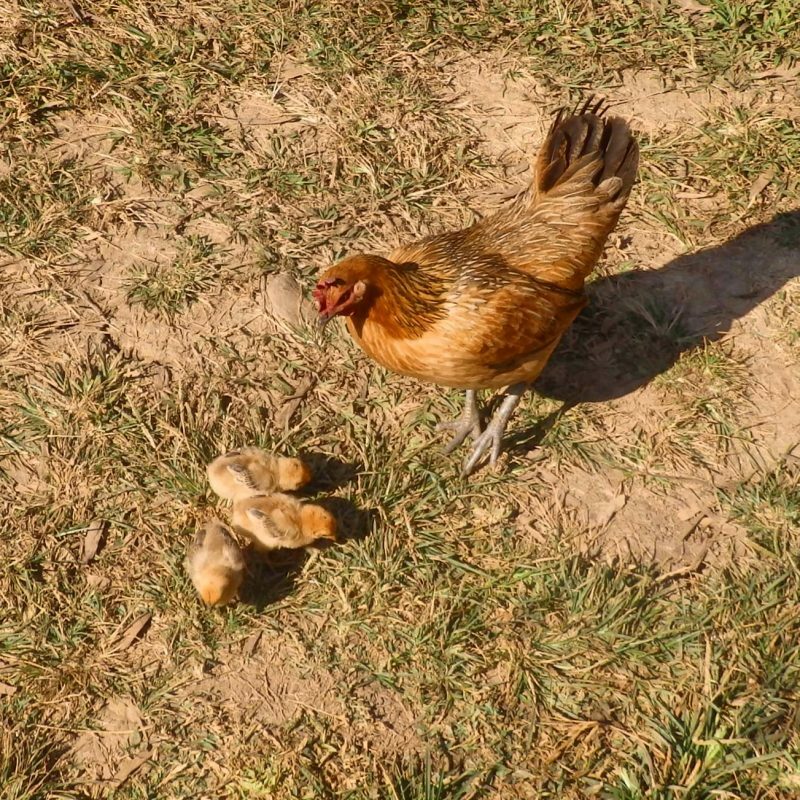 Free roaming chickens and chicks at the guesthouse. Felt almost like a farm stay. Memorial Bridge. Exiting by the same way I went in, this time in daylight. Back on the 1095. At the rest stop closest to Pai. Stopped here the previous day too but wasn’t in a mood for taking photos after a full day on the road without any food. And a little low on blood. This rest stop sells simple food and drinks, considerably pricey in Thailand, but still cheaper than in Singapore. Alfresco cup noodles, anyone? Another shot from the rest stop. Not sure if I was still in Southeat Asia, but yep, that’s it from Pai. Will definitely want to include it as part of any complete Thailand itinerary. I was supposed to buy the evening bus ticket from Chaing Mai to Chiang Rai, but the tickets were sold out by the time I arrived back in Chiang Mai. Isn’t such a good idea to underestimate the travelling crowd around festive seasons (It was New Year’s Eve the next day). Spent the night at the bus station, talked to random people, fell asleep somewhere in between, and took the morning bus to Chiang Rai. In between naps on the bus, woke up to snap this. No idea where it was, but sure looks surreal. Long distance buses in Thailand so far were comfortable, clean, and often provided snacks. Possibly better than some of those I took in Europe. Arrived at Chiang Rai around lunch but wasn’t feeling too good and slept till dinner. 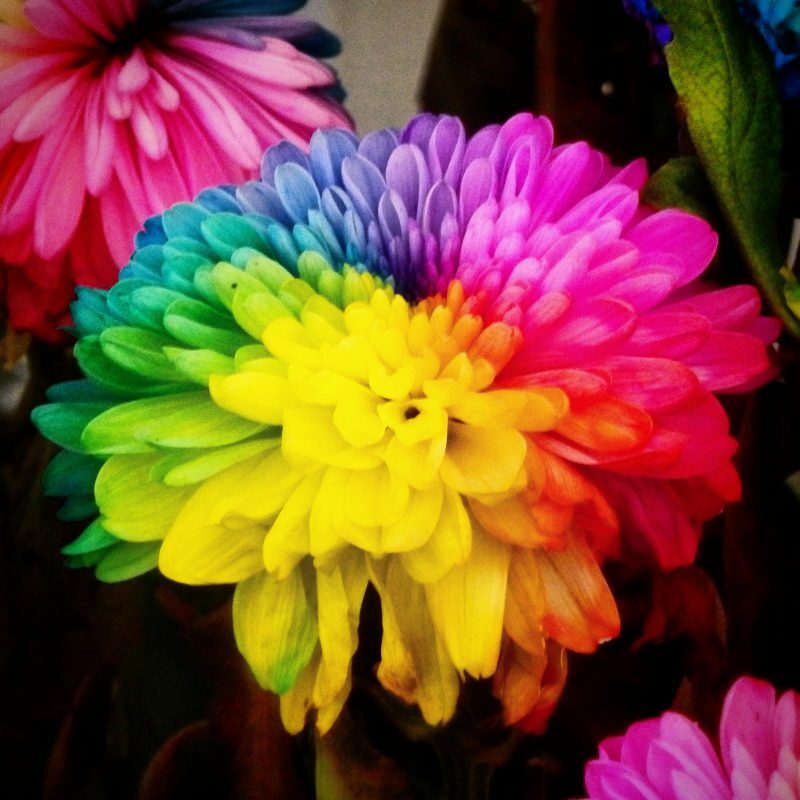 Met friends whom I met in Europe and they brought me to this amazing flower festival. 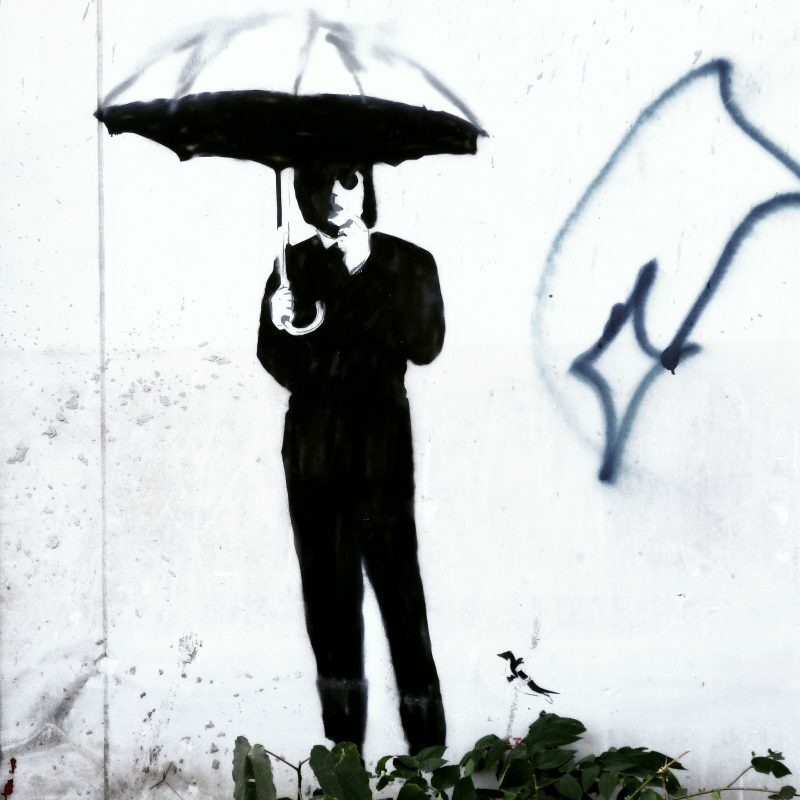 Hadn’t planned for this but turned out I was in Chiang Rai at the right time. 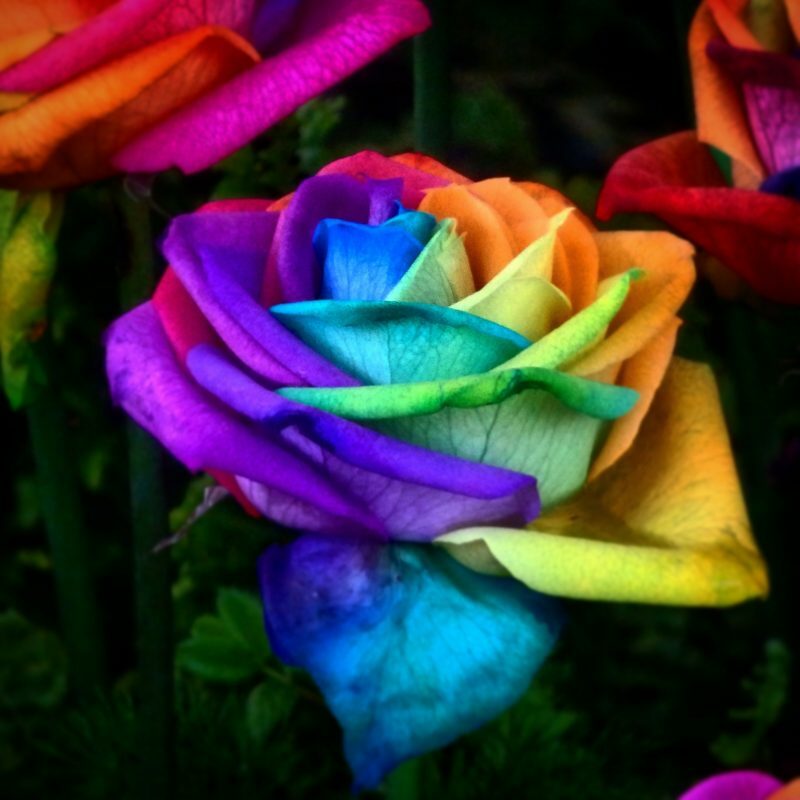 After the flowers. headed to the clock tower area where the countdown celebrations were to be held. 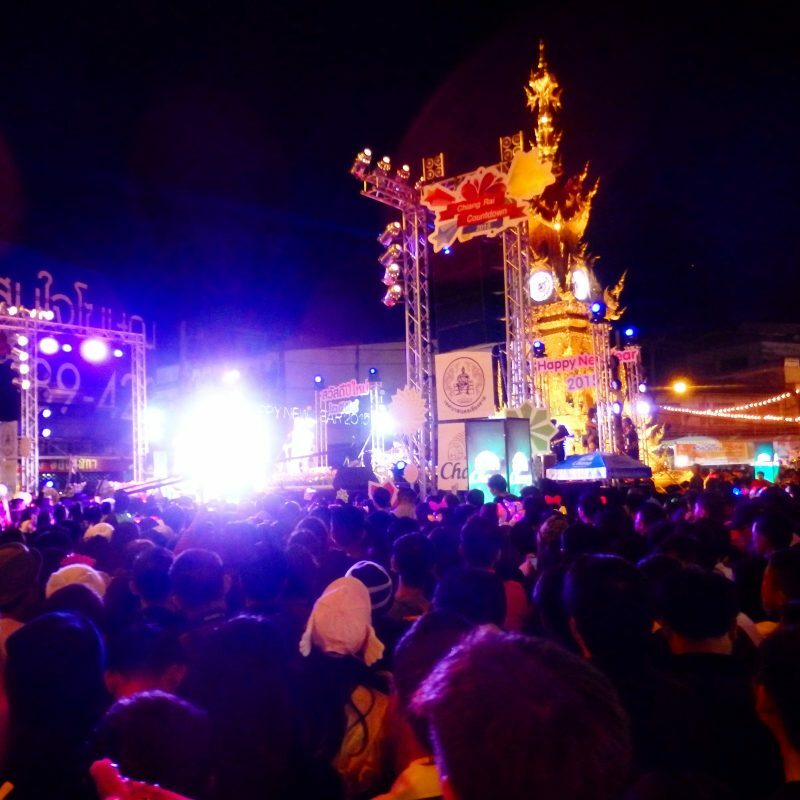 I’d never imagined Chiang Rai to be that crowded and happening. 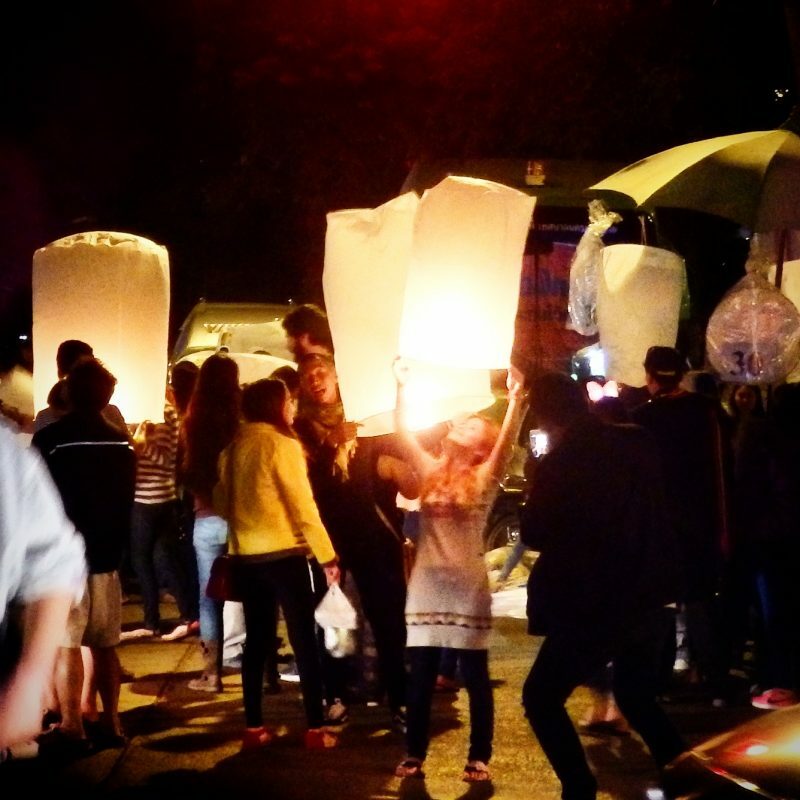 Many people were setting off these sky lanterns. I was told that after taking off, they often catch fire and land up on someones’ roofs. Doesn’t sound like a nice ending. Nice performances, lots of pushing and shoving, but we somehow survived. New Year was somewhat anticlimactic, but nevertheless intriguing. Being a supposedly small city, there weren’t any synchronised fireworks. People were setting off fireworks all over the place before and after midnight and it was a really amusing experience. Loved the night. Thanks friends! And that was how 2015 began for me. Met another friend from Chiang Rai, who very kindly showed me around the city for the next 2 days. It’s possible to do all of the 2 days without a guide, but likely more fun with friends. Wat Phra Kaeo. 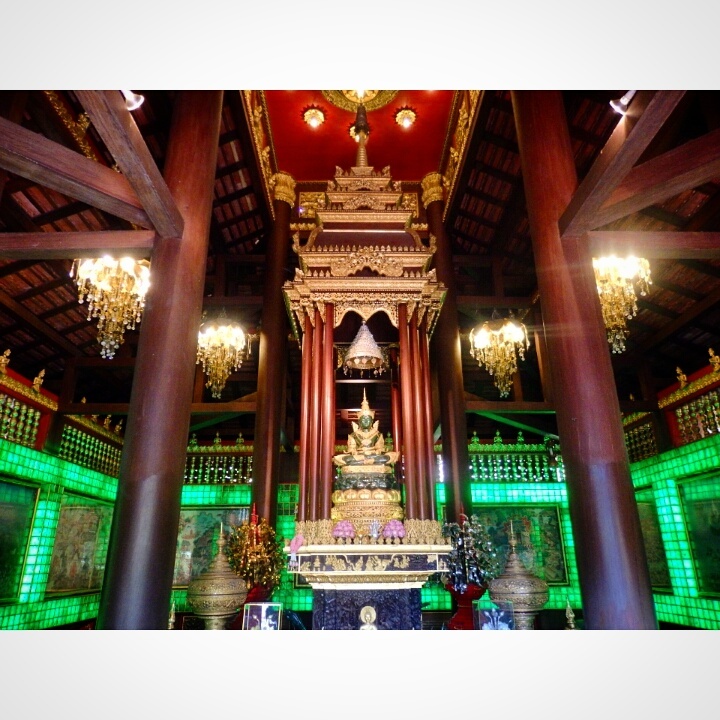 This temple was where the famous Emerald Buddha in Bangkok was found. The one currently there is a replica, but also in jade. 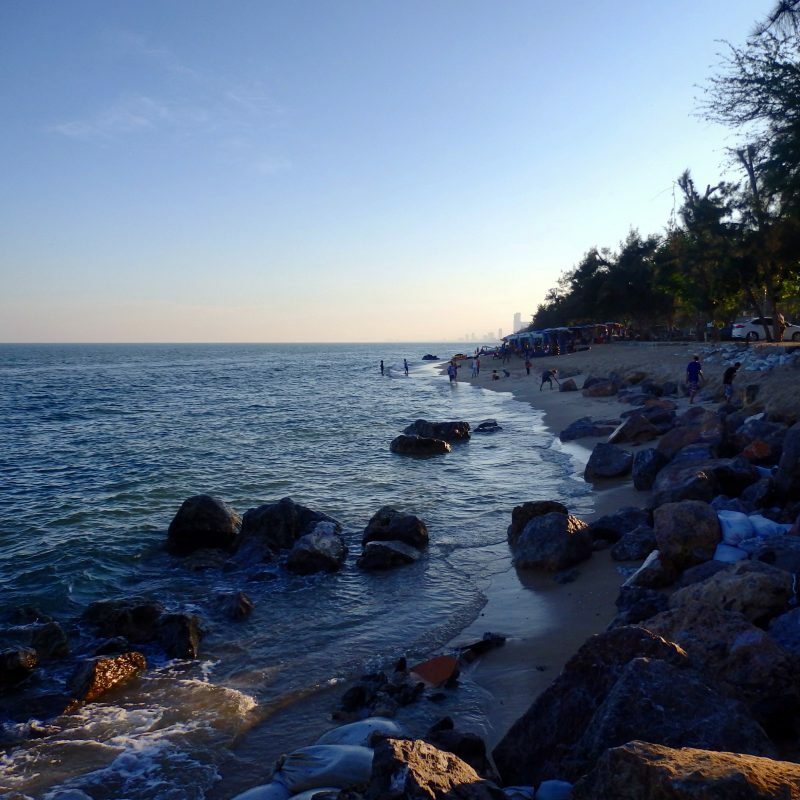 Chiang Rai Beach. 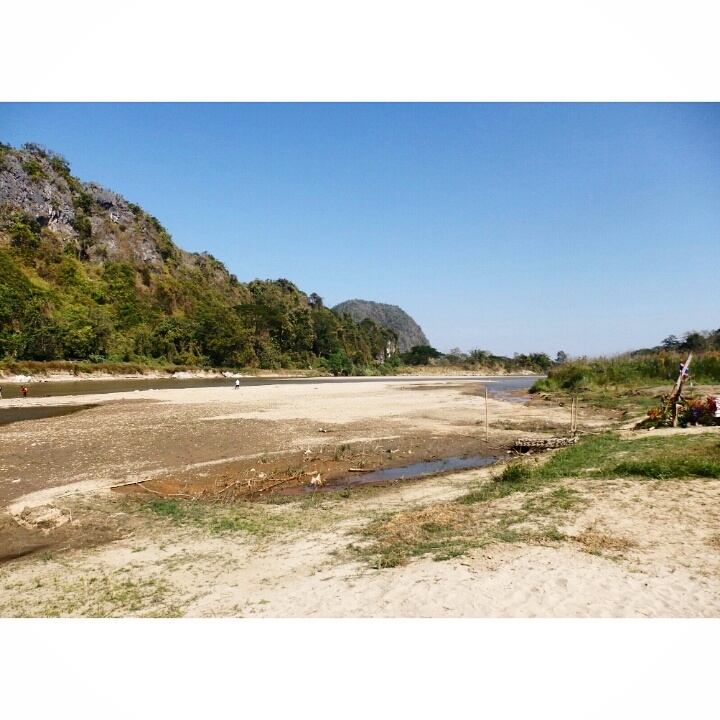 A beach in the mountains, along the Kok River. Nice place to chill, away from the crowds. 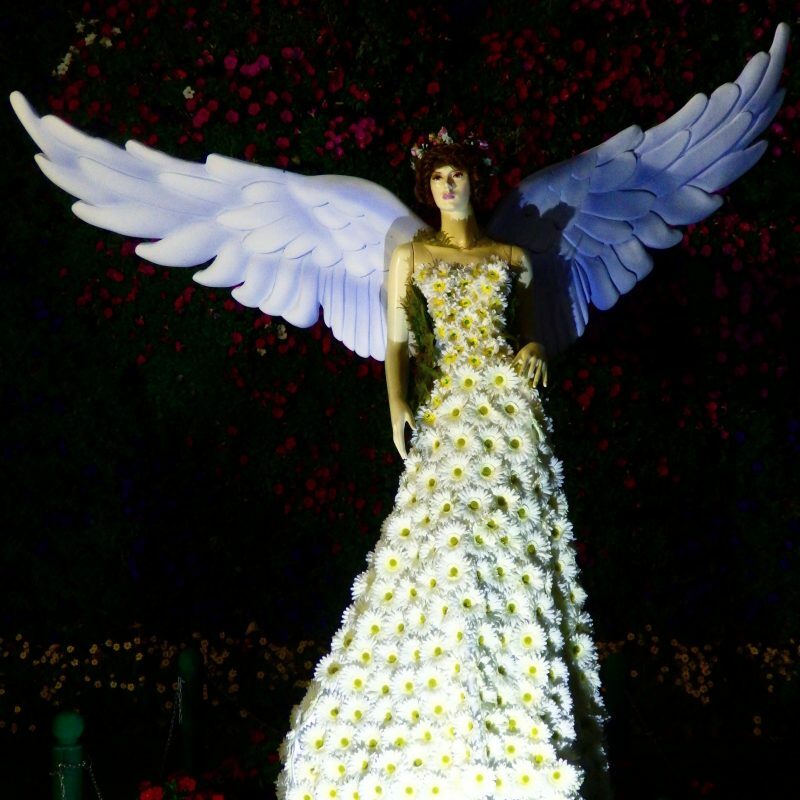 Went back to the flower festival to check out other stuff that was on display. 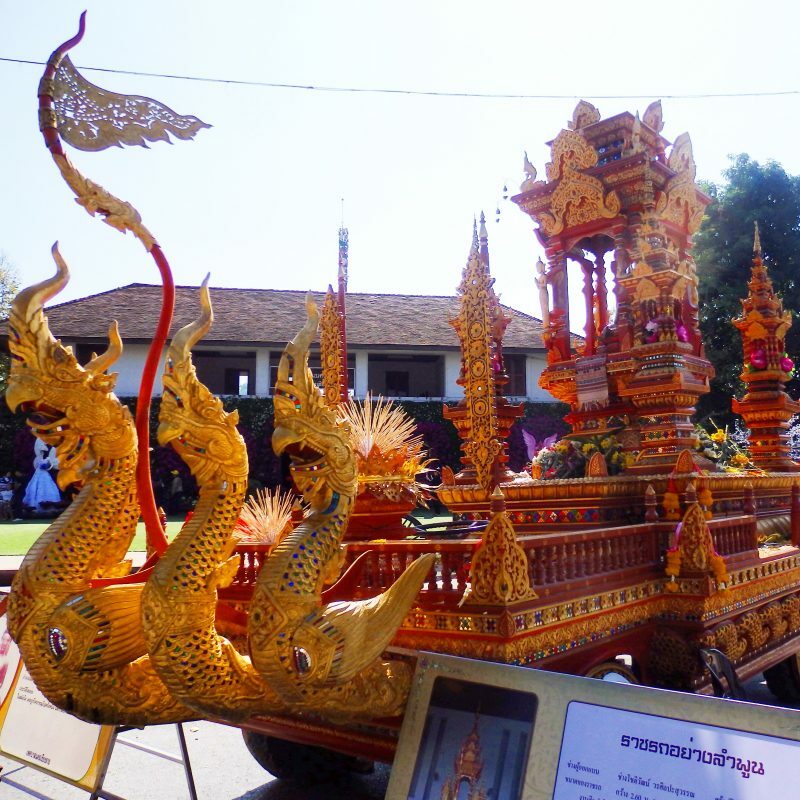 Beautiful floats on display at the flower festival. 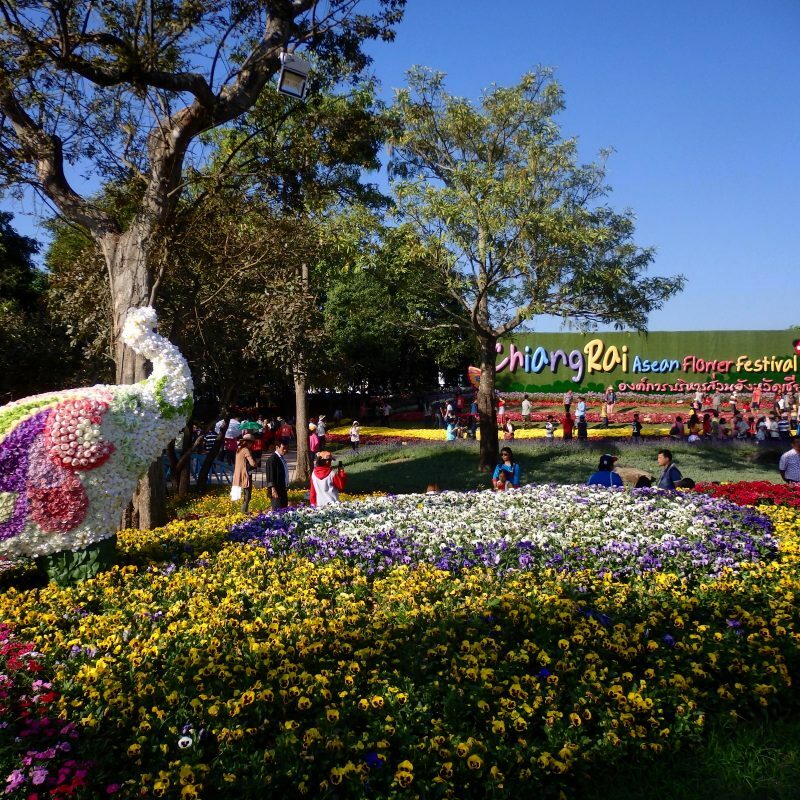 Chiang Rai ASEAN Flower Festival. Might have been part of the same event as the one in town, but this was quite a distance away from the other flower festival earlier, near the school where my friend used to teach. 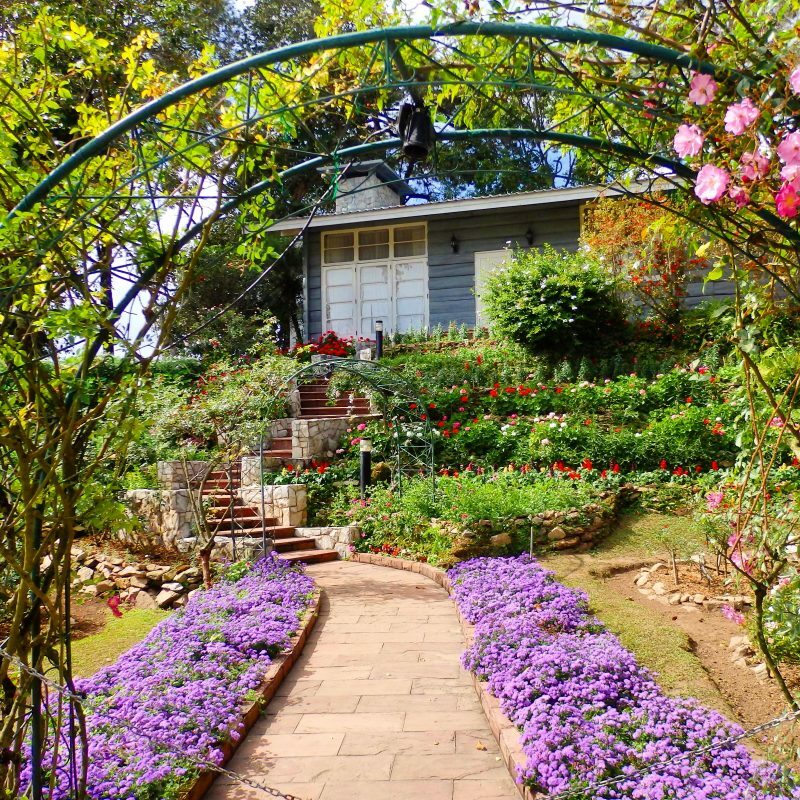 Beautifully landscaped gardens. I think the event venue is a park on normal days. Looks like it took quite an effort putting everything up, the park was quite big. 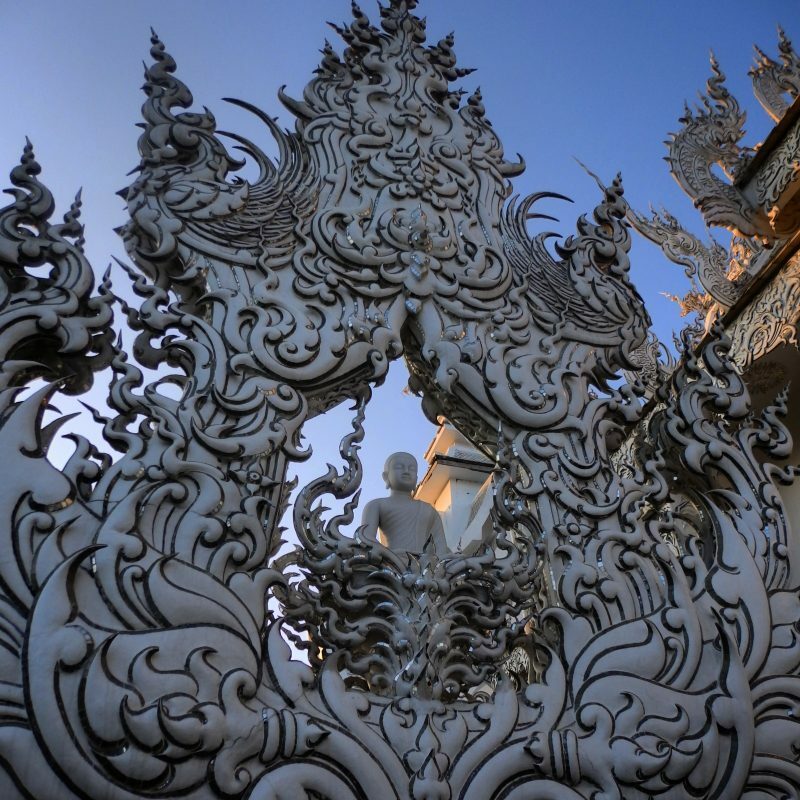 Wat Rong Khun, Chiang Rai. 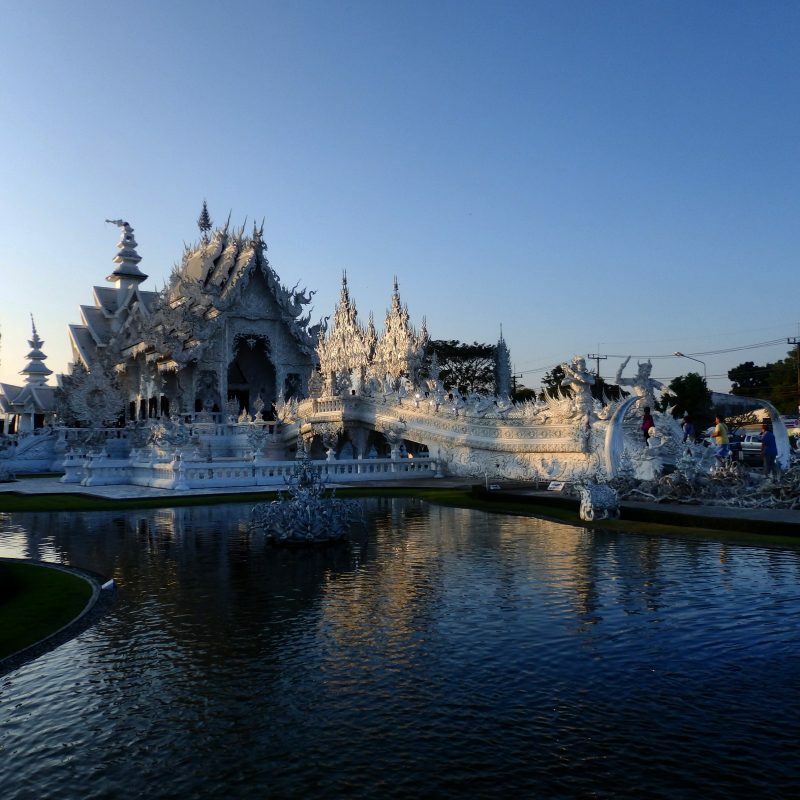 We then went to the famous White Temple, which was also some distance from the city center. Impressive work of art slightly damaged by an earthquake, currently a work in progress. Intricate artworks around the temple, all done by a single artist. 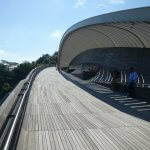 After the temple, we were heading to Singha Park when the bike sputtered and died. Turned out we had forgotten to top up the gas tank. Felt bad waiting under a tree in the middle of somewhere while my friend pushed the bike for about a kilometer to the nearest gas station. Still, we made it to Singha Park to catch sunset. Another spot popular with locals. Looks like a tea farm but functions more like a attraction, with amazing, sweeping views of the tea plantation on one side, and the mountains on the other. Ended the day with a walk through the night bazaar and dinner somewhere in it which was somewhat like an outdoor hawker center. Nice Thai dining experience. 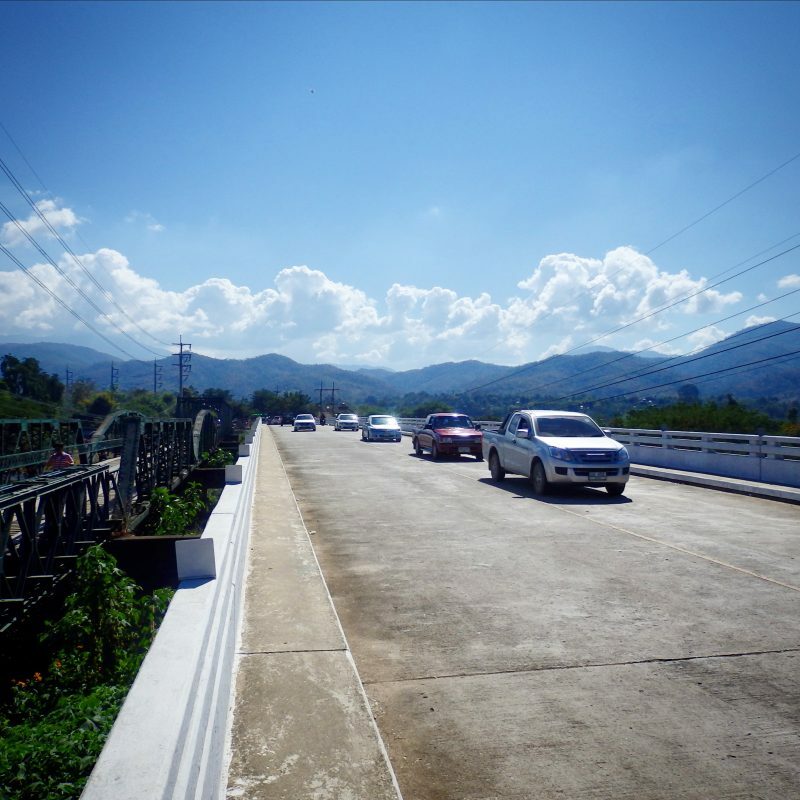 My friend who showed me around Chiang Rai the previous day borrowed a pickup from his friend, and together with his friends, we traveled to the attractions slightly further from Chiang Rai city. 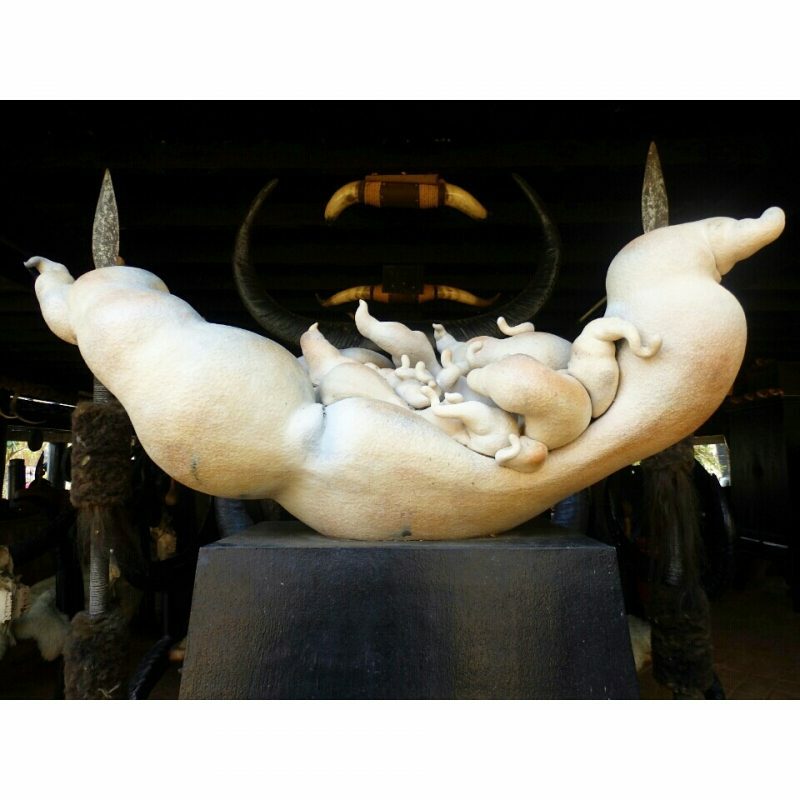 First stop, Bandaam Museum, about 30 min by bus from Chiang Rai city. 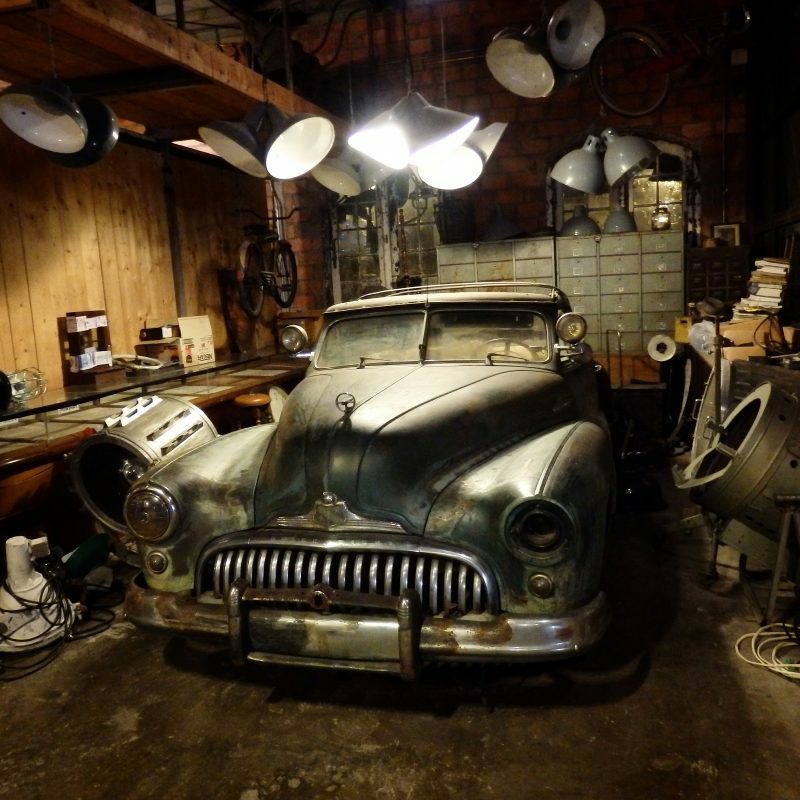 Fascinating art space all created by an artist. Some pieces a little bizarre or morbid. Bandaam Museum (Black House/ Temple). One of the buildings at the compound. And the bizarre. Not too sure what this is. Next, we stopped by Choui Fong Tea Plantation. 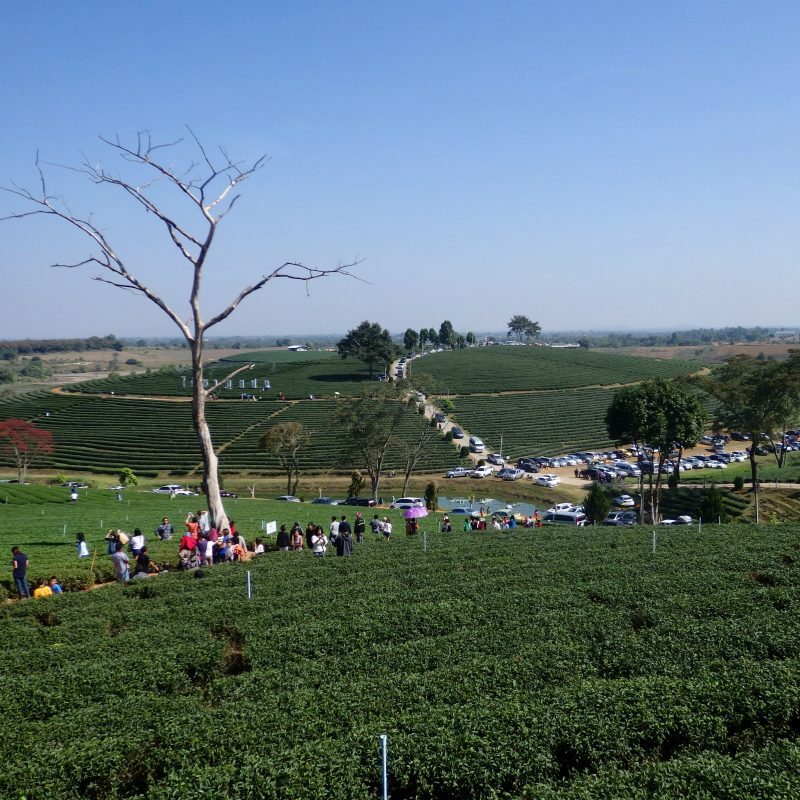 Further beyond the city were some tea plantations, but this seemed to be the most popular among locals. 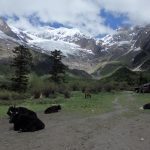 We then went further north, to the Golden Triangle. Really nothing much to see here, but good to visit for its significance. 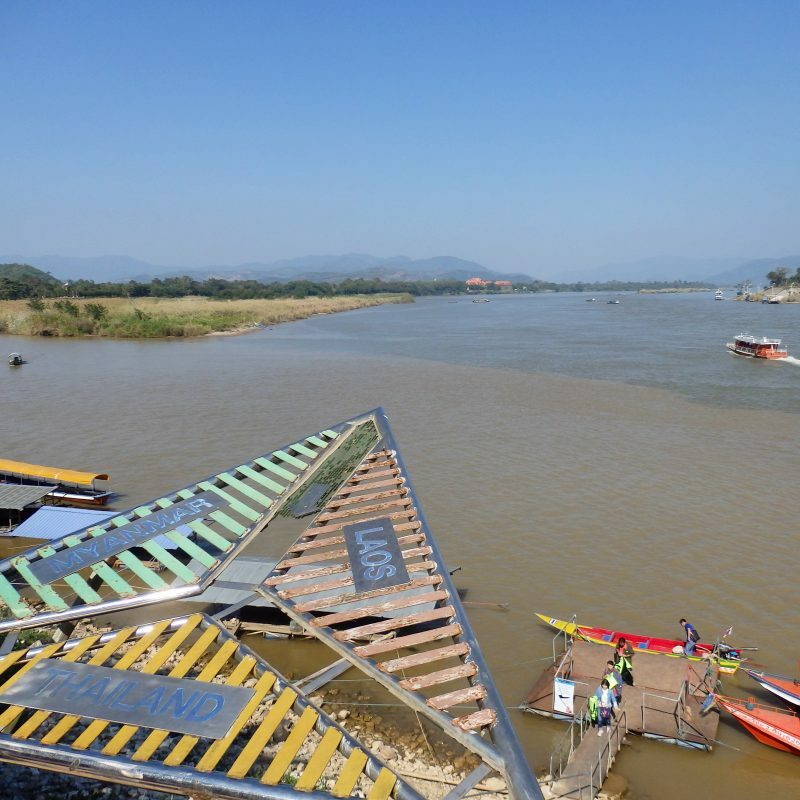 This is where the borders of Myanmar, Laos and Thailand meet, and where there used to be a booming opium trade. Most plantations have turned to tea and coffee in recent years and opium activity is mostly confined to the museums nearby (I hope). 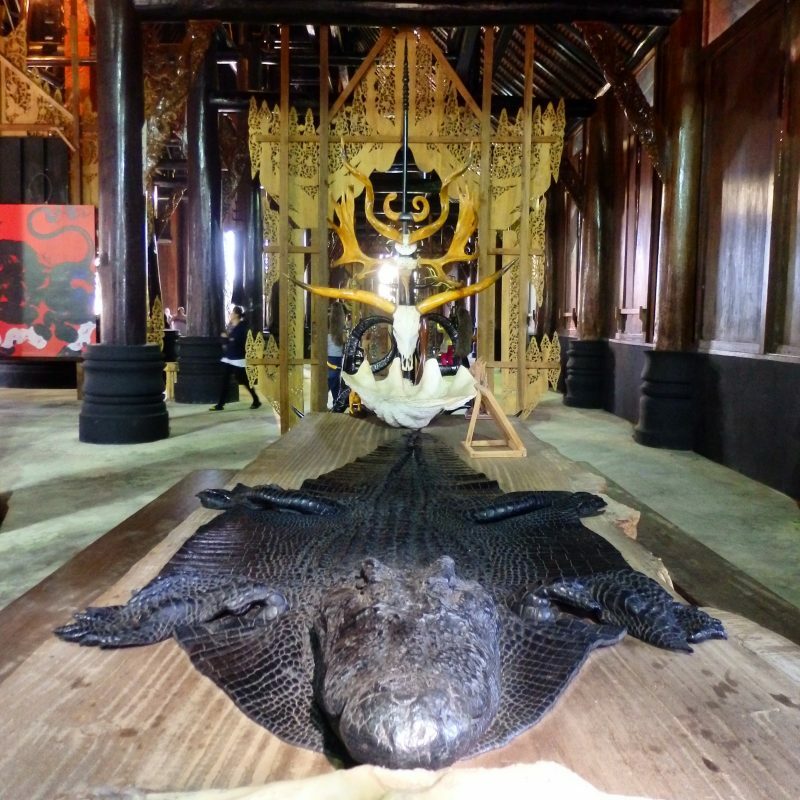 Anyway, Wikitravel branded this place ‘the largest tourist trap in northern Thailand’. Had a nice lunch beside the river. Golden Triangle. Thailand in the foreground, Myanmar (or Burma) on the top left, and Laos on top right. After lunch, we headed back towards Chiang Rai city, stopping at a couple of temples along the way. Some were crumbling from the wear and tear over hundreds of years. 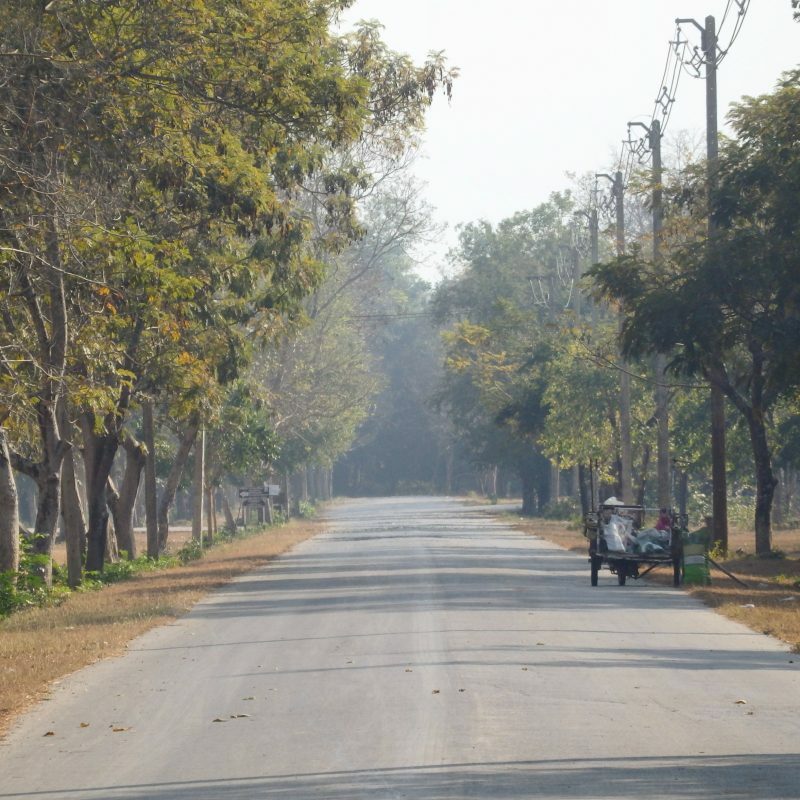 By the time we were near Chiang Rai city, it was late in the afternoon. 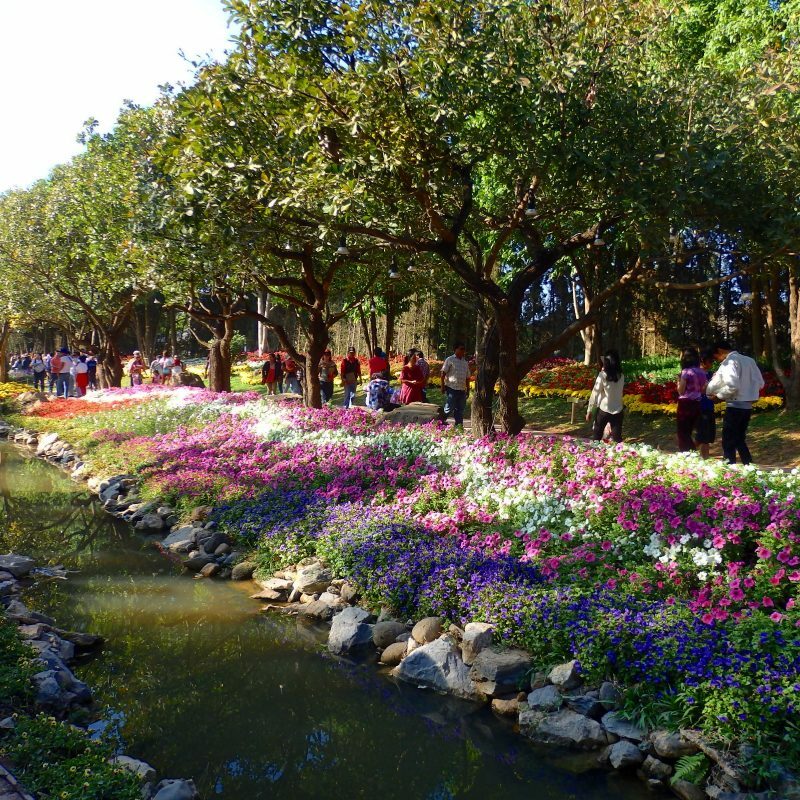 We made a stop at Singha Park again, this time with ample time to catch sunset. Sun setting behind the mountains on the side of the park, where I didn’t manage to get a shot of the previous day. There’s also a nice restaurant overlooking the scenery. Back in the city, we had a Thai steamboat or mookata for dinner. I had seen lots of mookata restaurants in Singapore but hadn’t been to any before so I was quite excited. Didn’t look too clean but it didn’t matter. The experience was great. And I think it costed about S$6 or S$8 per person. Wide selection of food available at the mookata. 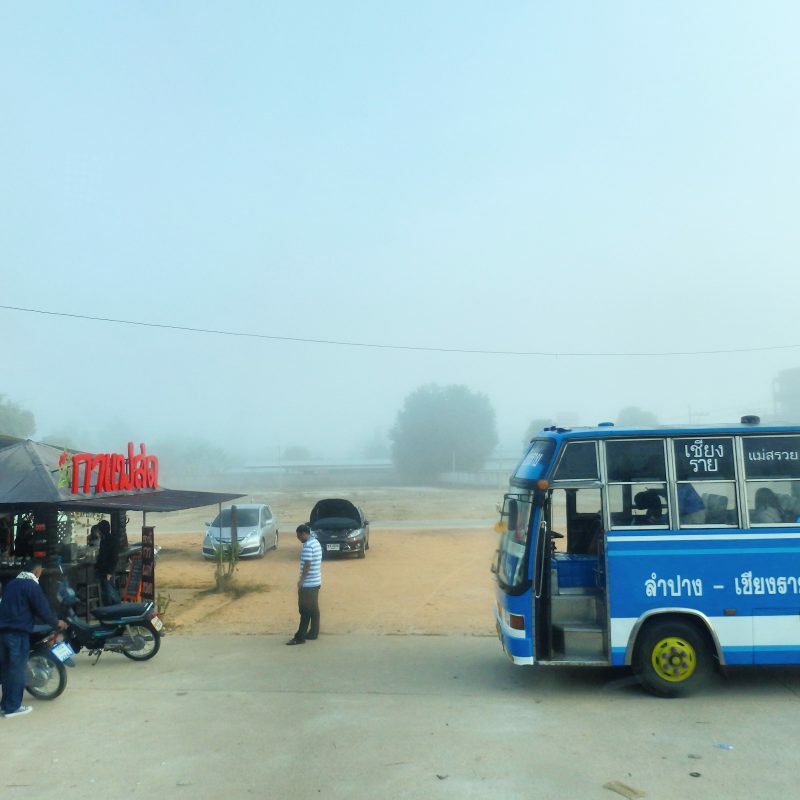 There weren’t any overnight buses to Sukhothai so I spent the entire 14th day on the bus from Chiang Rai to Sukhothai. This was the first public bus I took (the rest were run by private companies) and it was an eye opening experience. Nowhere as clean or spacious, but I still managed to catch some sleep most of the way. 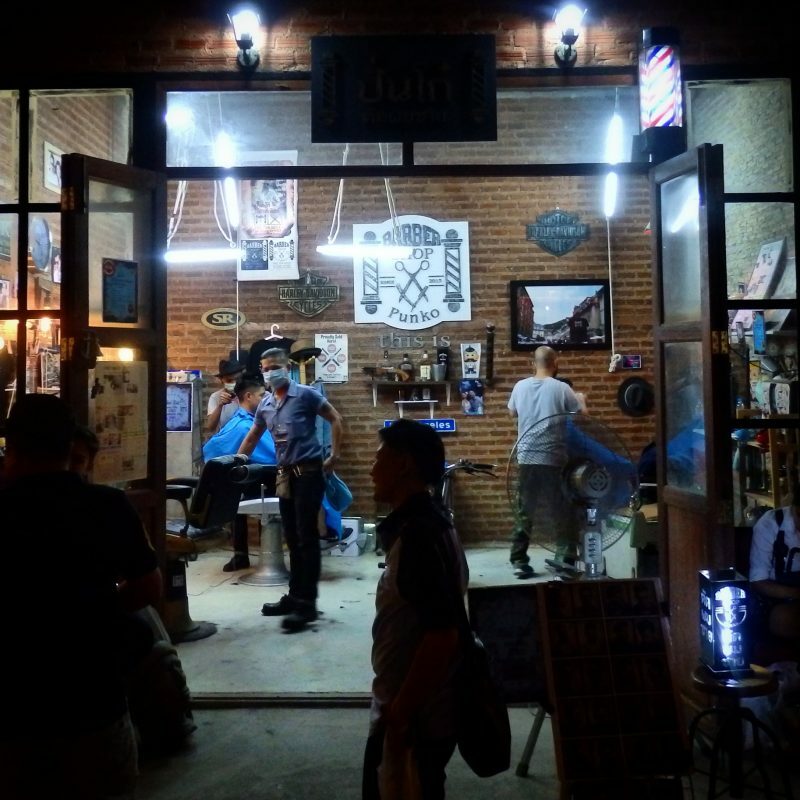 Sukhothai had a weekly night market and somehow it coincided with the day I arrived. Wasn’t aware of it until the hostel staff told me so, and it was conveniently located across the river from my hostel so that was great. Tried some interesting looking food such as noodles with egg steamed on a cloth and some instant noodles looking tidbit. And for the second time on this trip, I had a double room to myself so it was good night’s rest (somehow in some cities it’s cheaper to get a double room than a single one). 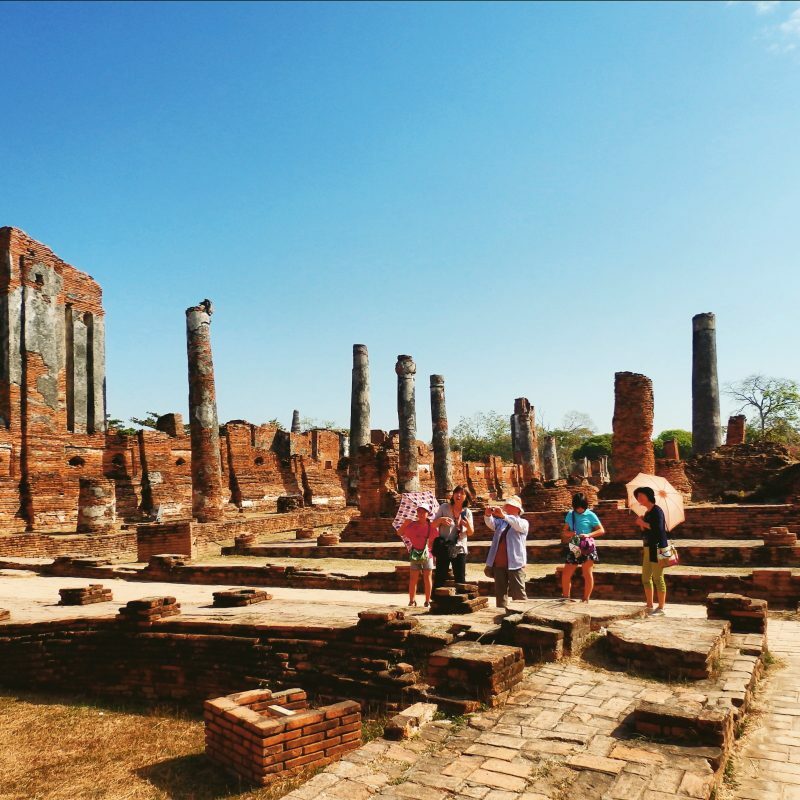 Spent the day exploring Sukhothai Historical Park. 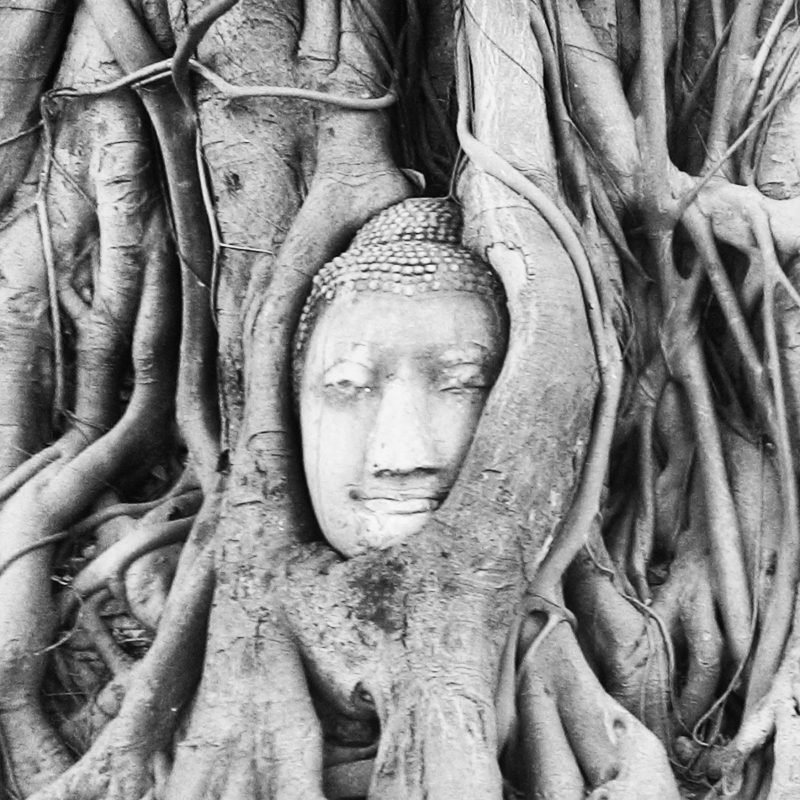 In some ways similar to Ayutthaya but then again different. 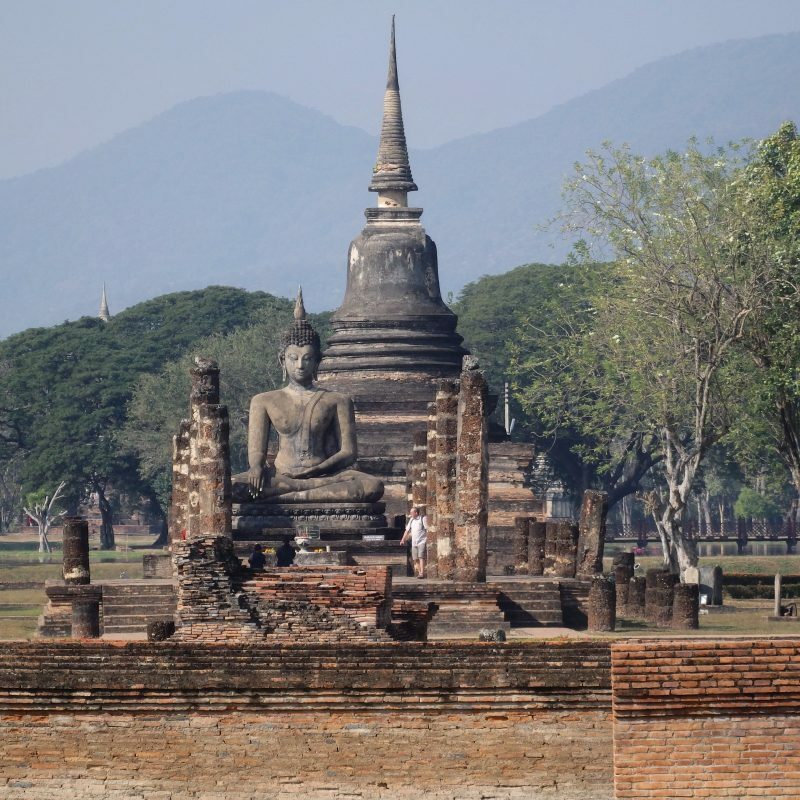 Sukhothai was the first capital of the Kingdom of Siam (Ayutthaya was the second). 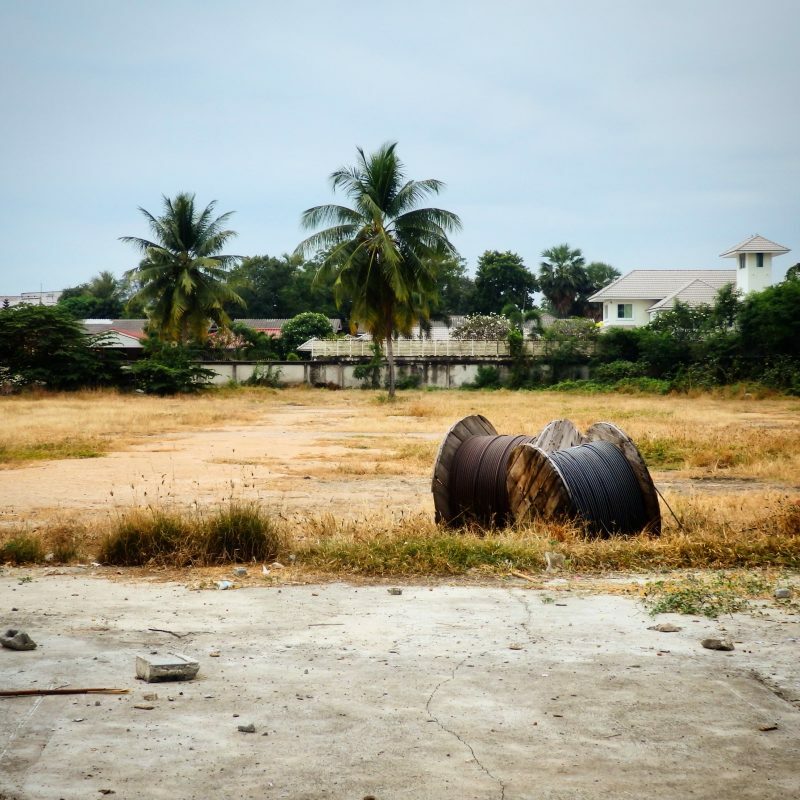 Lots of temples in varying states of preservation/ degradation spread over a sprawling complex. 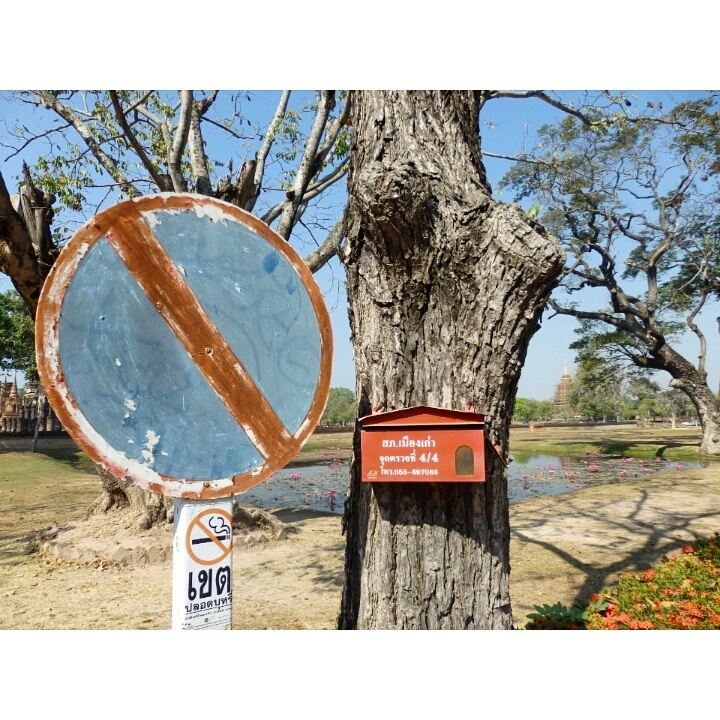 Unlike Ayutthaya, where ticketing for different temples is dome separately, the entire Sukhothai Historical Park is in an enclosed compound, and only one ticket is necessary for the entire park. 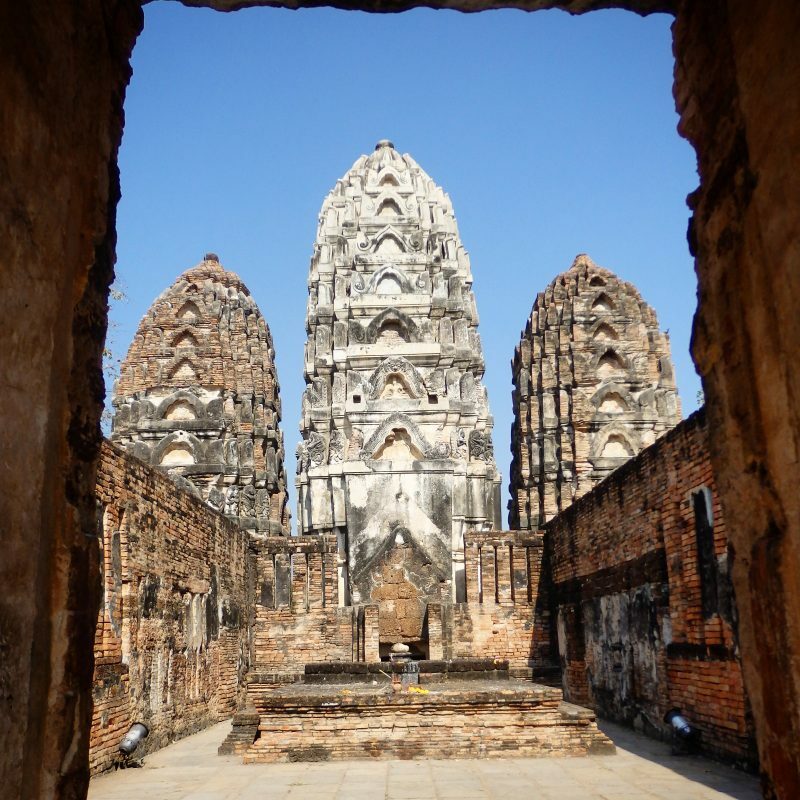 Also, the historical park is a distance away from the city, with regular transport service between the old and new city, in contrast to Ayutthaya, where the old city and new buildings sit side by side. Similar to Ayutthaya though, bicycles are available for rent, and they make exploring the whole area so much easier. 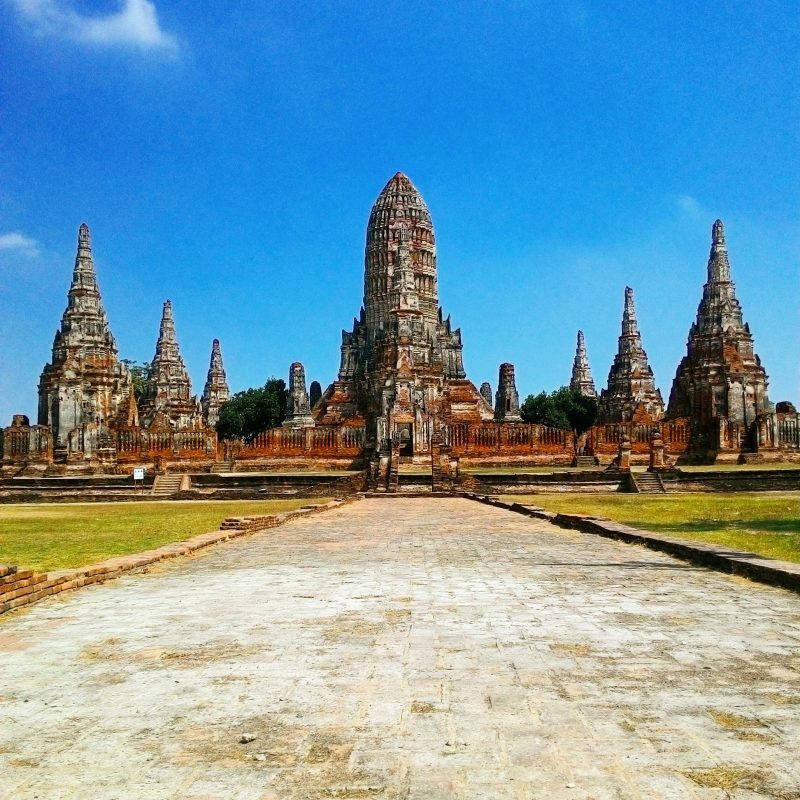 And finally, both Sukhothai and Ayutthaya are designated UNESCO World Heritage sites. 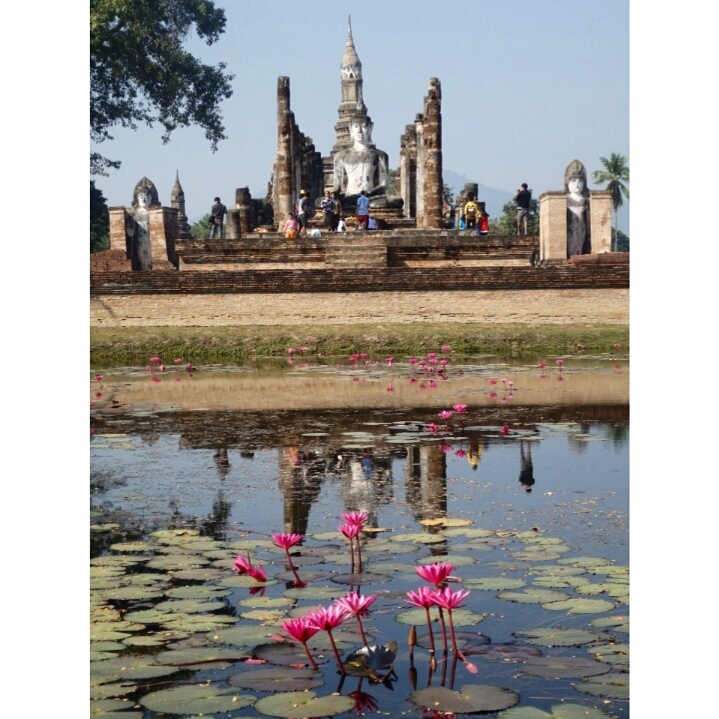 Sukhothai Historical Park. 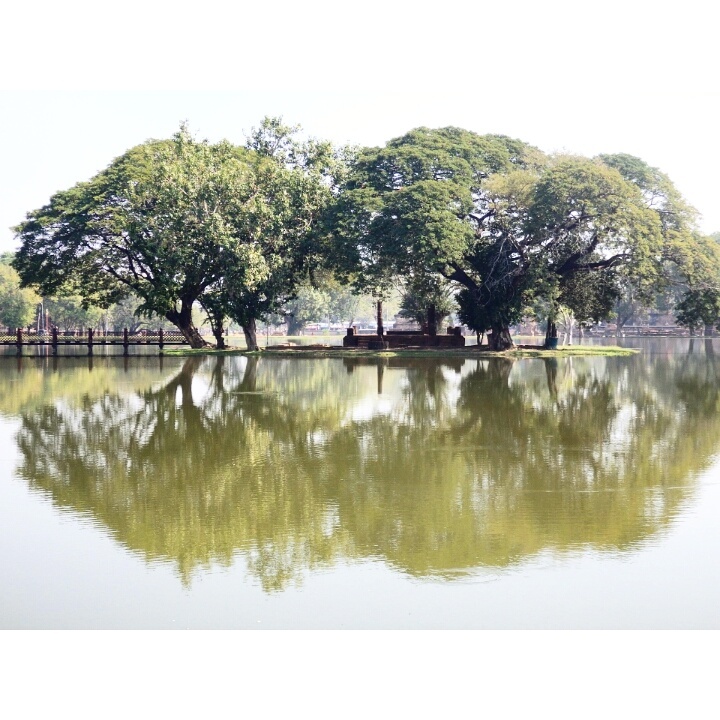 Beautiful Park with lakes and trees alongside centuries old temples. Exploring the (partially restored) ruins. 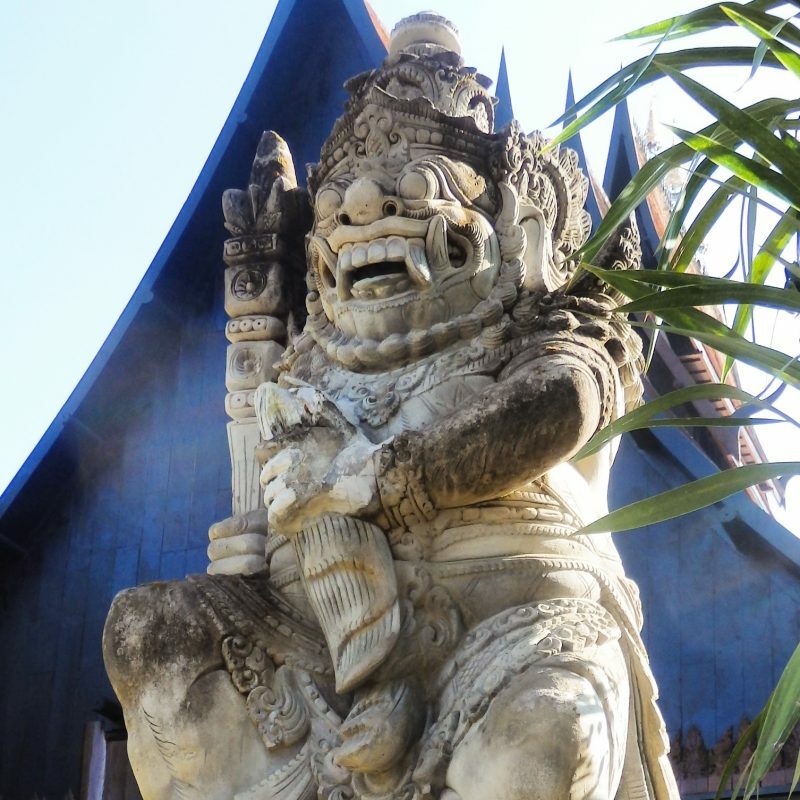 Wat Si Sawai, in Hindu-style. Grassy plains further out from the central area. I think this area (couple more temples including the following pictures) required a different ticket, if I didn’t remember wrongly. Wat Si Chum, with a huge statue of Buddha. 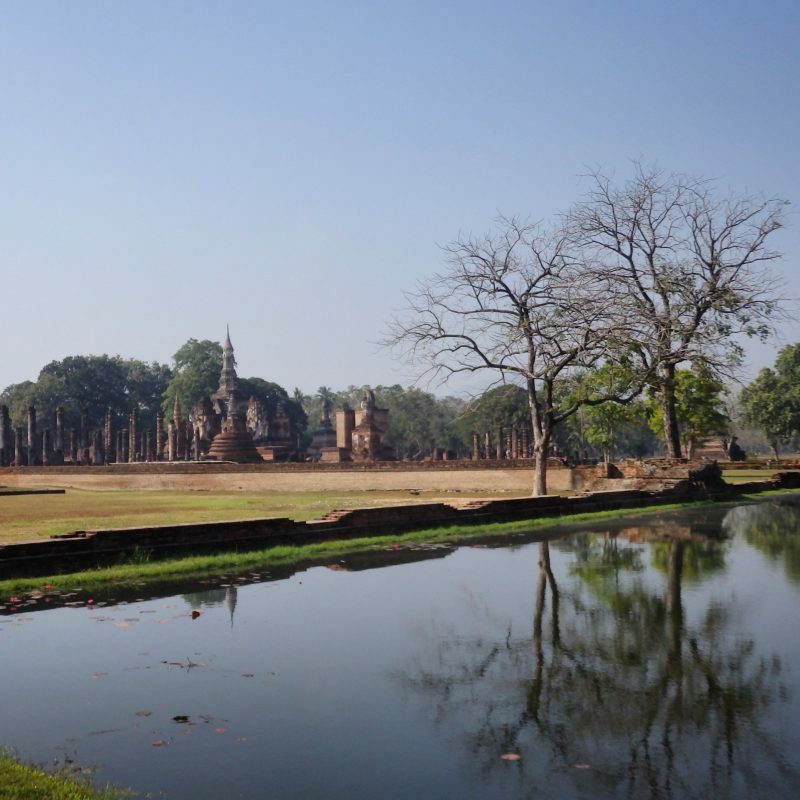 Sukhothai Historical Park, late in the afternoon. Trucks that shuttle people between the old and new city. There were also no overnight buses to Bangkok so I spent almost a day on the public bus from Sukhothai to Bangkok. Was really glad to meet a Singaporean at the hostel the next day. We had an interesting lunch of catfish salad and another Thai fish dish together. Then I was off alone again, on the minibus to Cha Am, about 2 hours south of Bangkok. 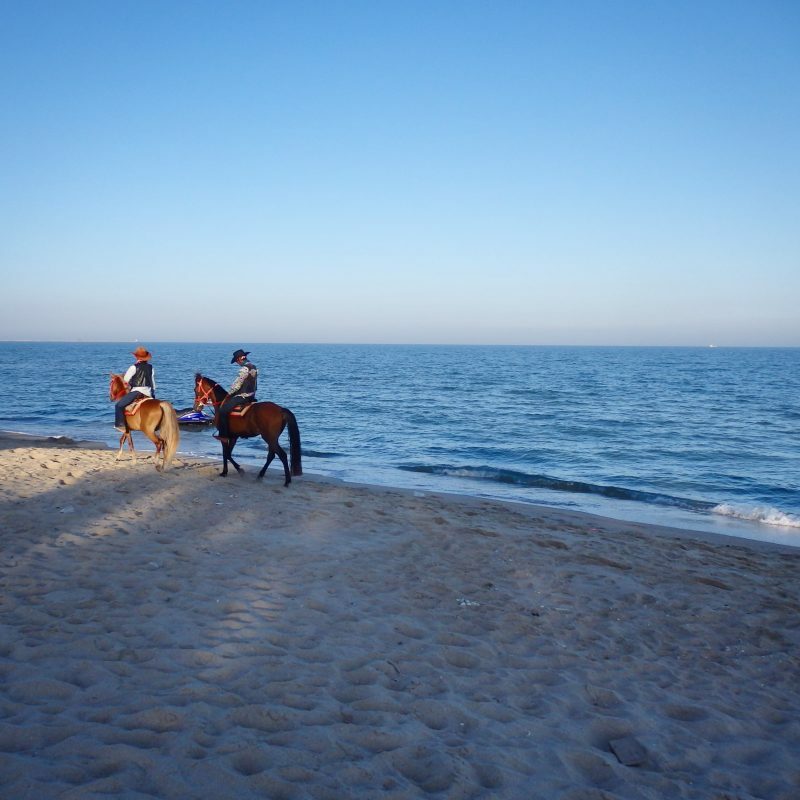 Cha Am, quiet town beside the sea, 2 hrs from Bangkok. 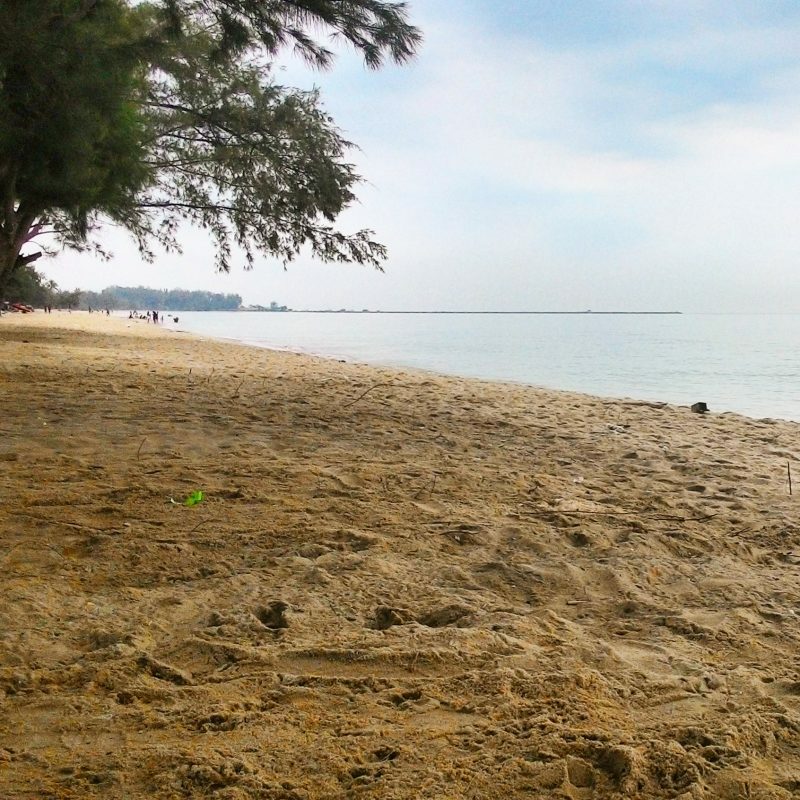 Much less crowded than the other popular beach destinations in Thailand’s famous south, perfect for some quiet time away from the crowds but still close to civilisation. Lots of foreigners have settled down here, opening shops and restaurants. 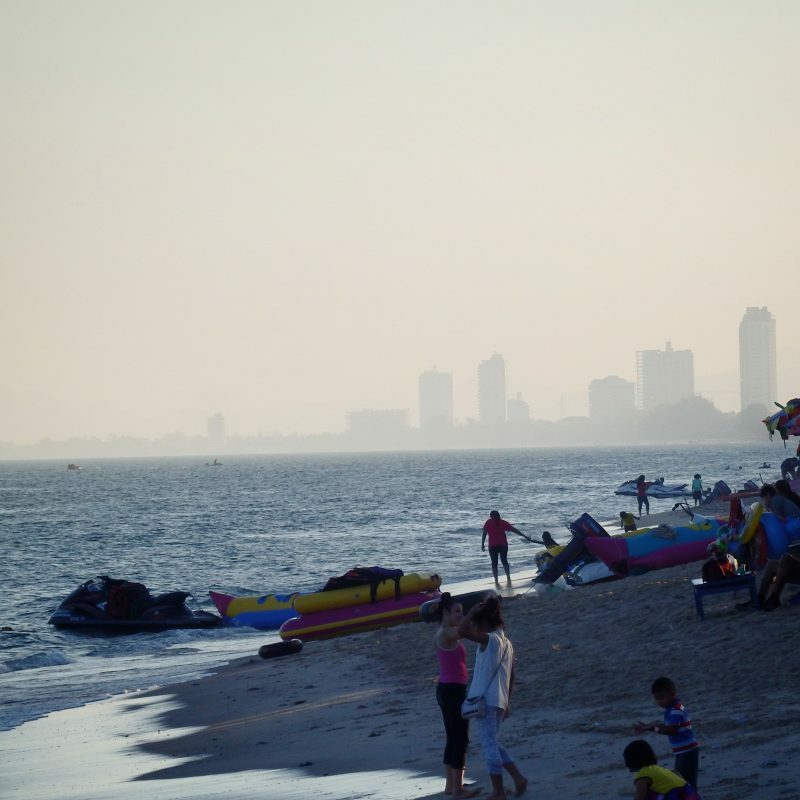 Hua Hin in the distance. 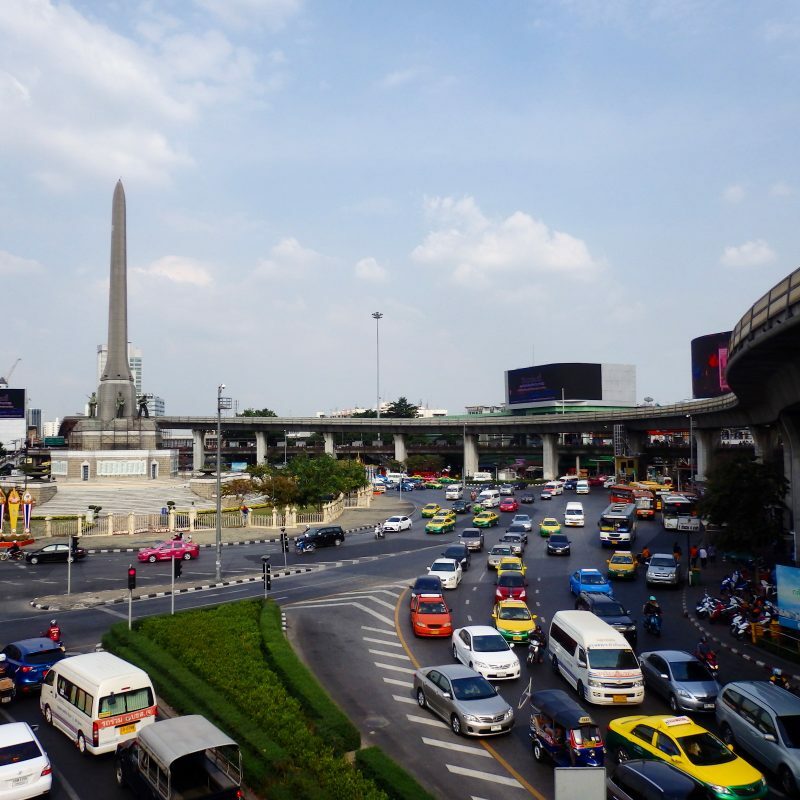 After the lazy breakfast, took the minibus back to Bangkok and landed right back in the middle of the bustle, at Victory Monument. Victory Monument is a great spot for experiencing the energy of the city, and it’s quite impressive how they built the subway tracks around the monument. 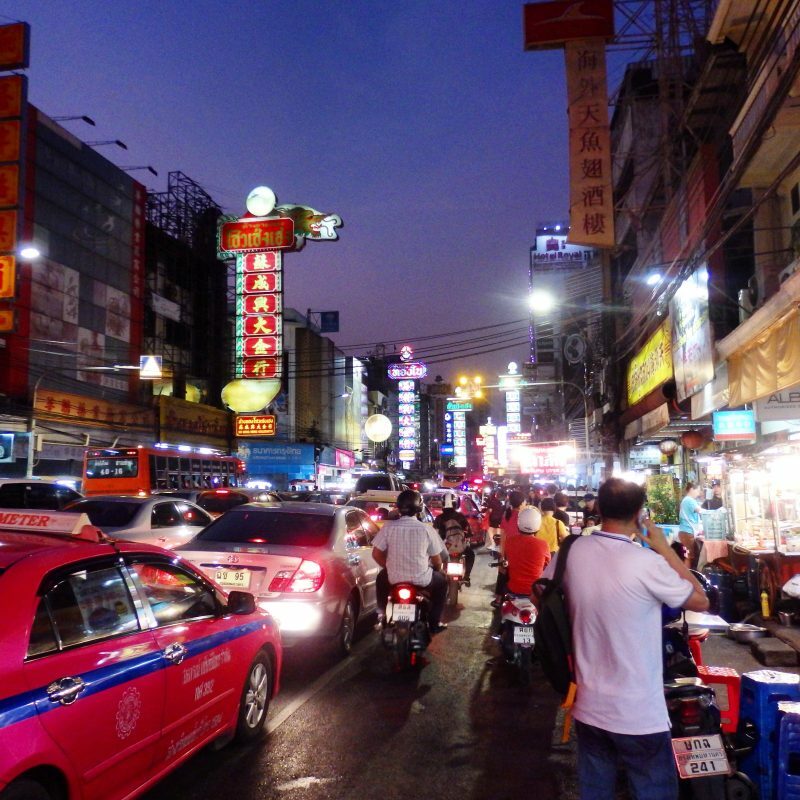 Checked in to the hostel, took a break, then headed to Yaowarat, Bangkok’s Chinatown. 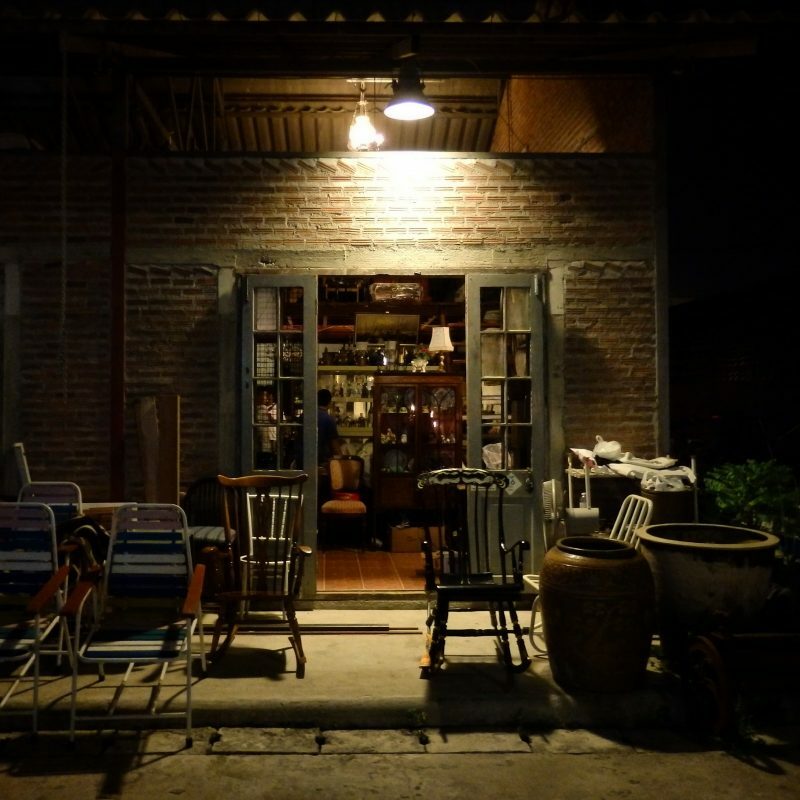 Yaowarat in the evening is another spot that’s bursting with energy. 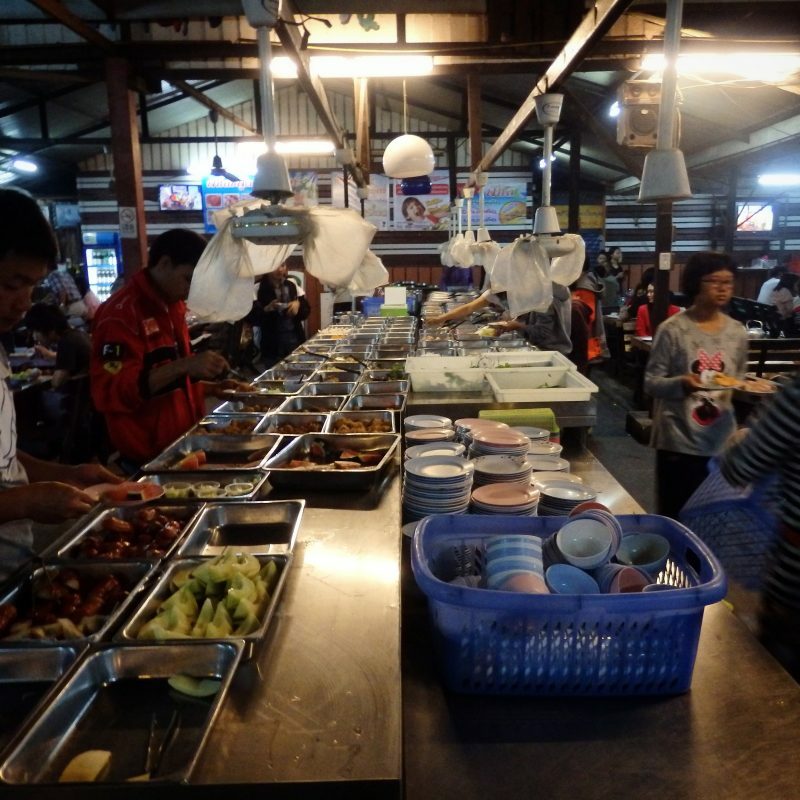 Seems like huge loads of locals and tourists head there every night around dinner time, and the range of food available is simply bewildering. Lots of roadside stalls and hawkers extend deep into the alleys that stretch from the main road. Some pretty flamboyant cooking in one of the alleys I went into, with flames shooting high into the sky every few minutes from one of the stalls. 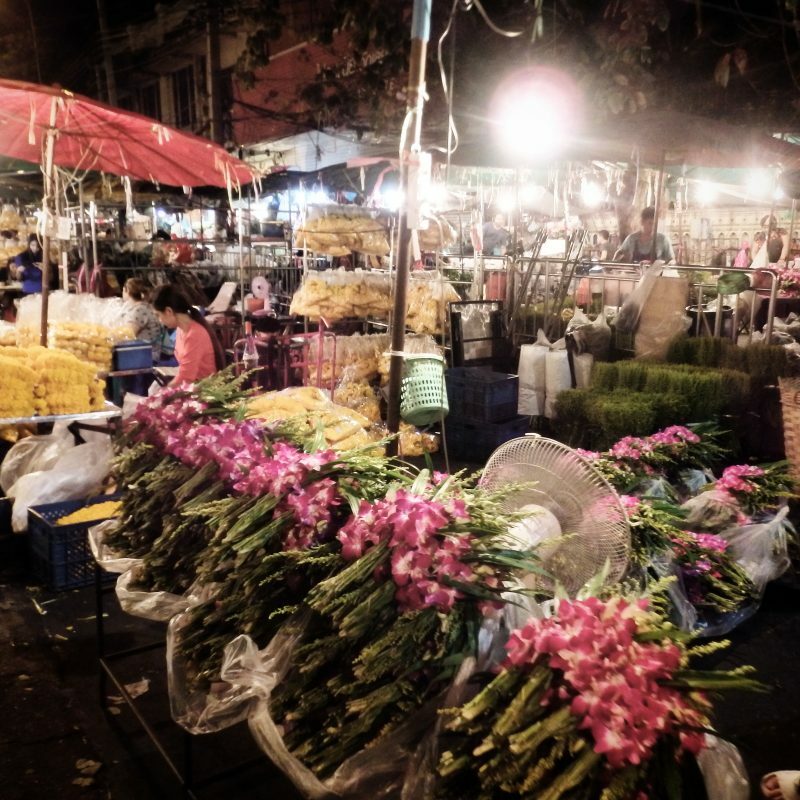 Near the Memorial Bridge, there’s a night market that’s open some days a week, but also a flower market that runs 24/7. I think I passed by this place on the first day I was in Thailand, but earlier in the day there wasn’t that much action. Nothing much I could buy, but a fascinating place to visit at night, so lively and colourful when the market starts to get busy as the sun goes down. Decided to do my part as a Singaporean and do some shopping around Pratunam Market. Didn’t manage to find anything to buy, but was nice exploring the place (and finding nice food). Spent the day checking out food stalls near the hostel and doing some grocery shopping. Bought some stuff that supposedly can’t be found back home, such as some Thai steamboat/chili sauces and some seasoning cubes. 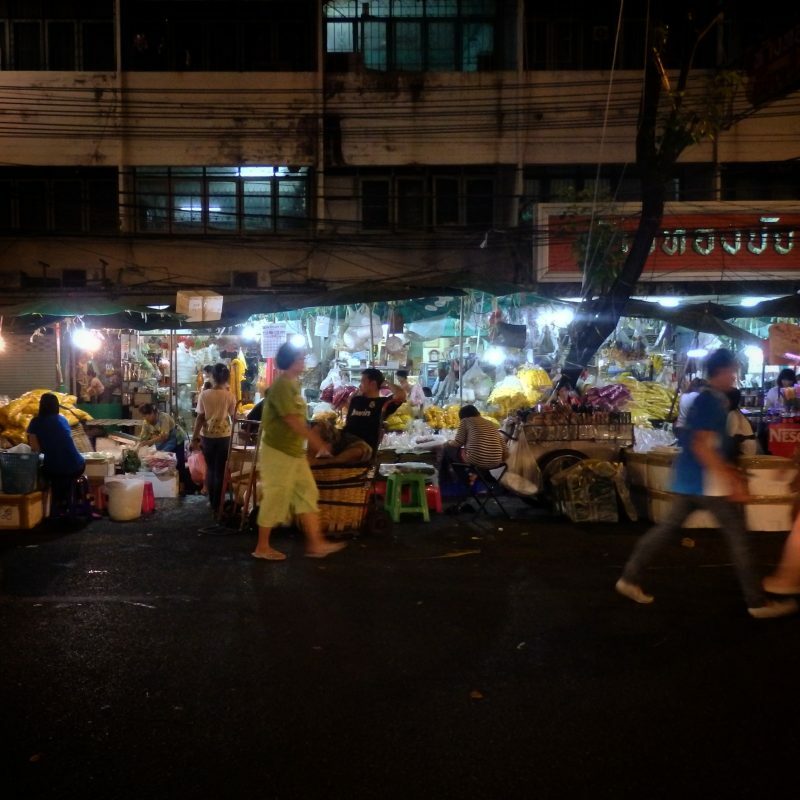 Checked out Talad Rod Fai (Train Market) that evening. 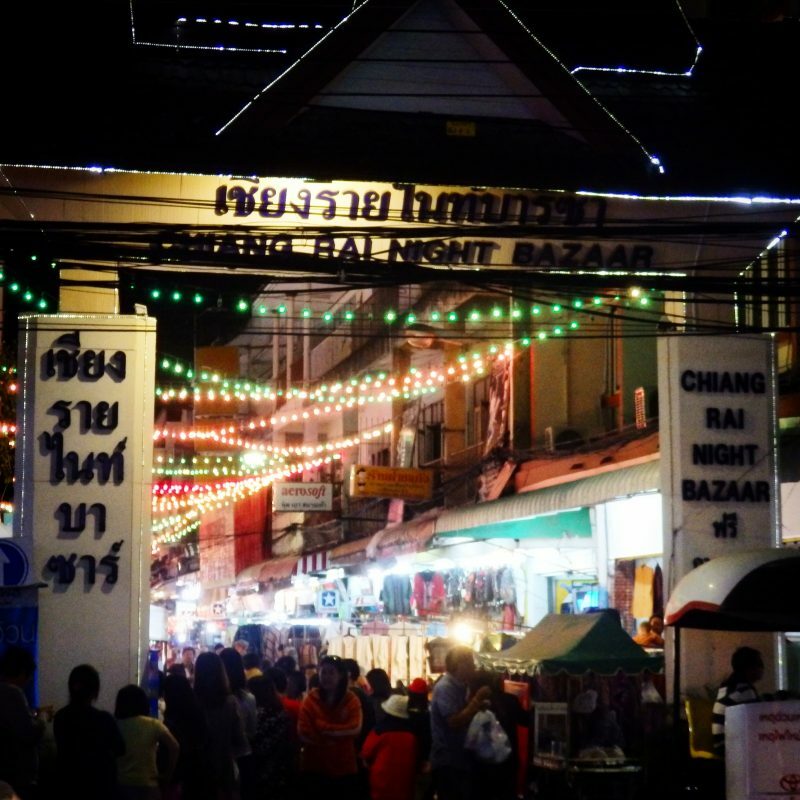 This night market, together with the one at Chiang Mai, were probably the most memorable. The stuff that were sold here weren’t special, but the atmosphere felt different. There were nice pubs and bars with or without live music, great for hanging out. 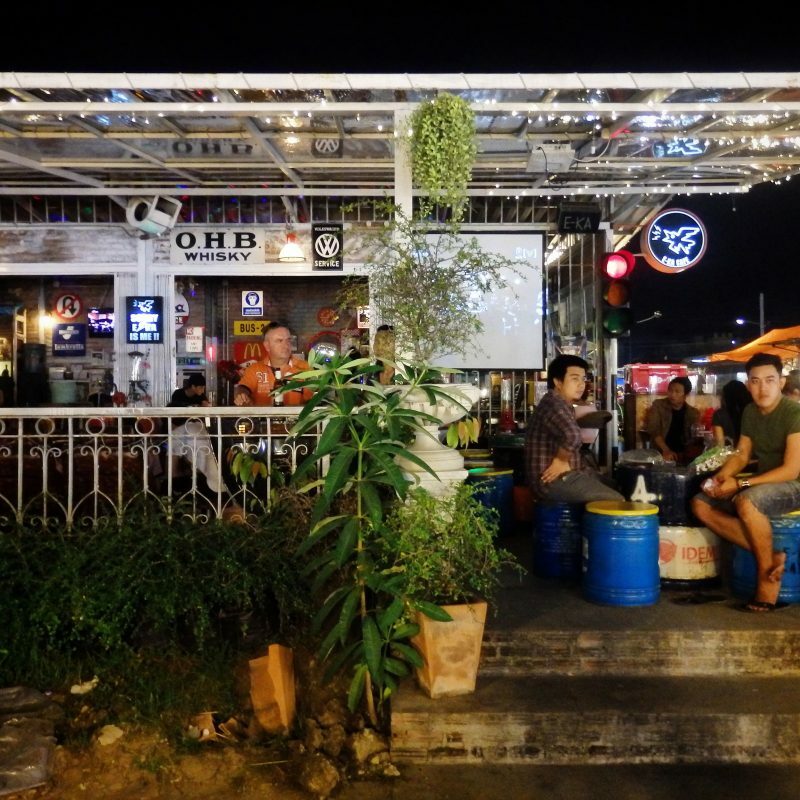 One of the pubs at Talad Rod Fai. The night market had a retro theme and it felt sincerely done. Sincerely sounds like a weird adjective here. 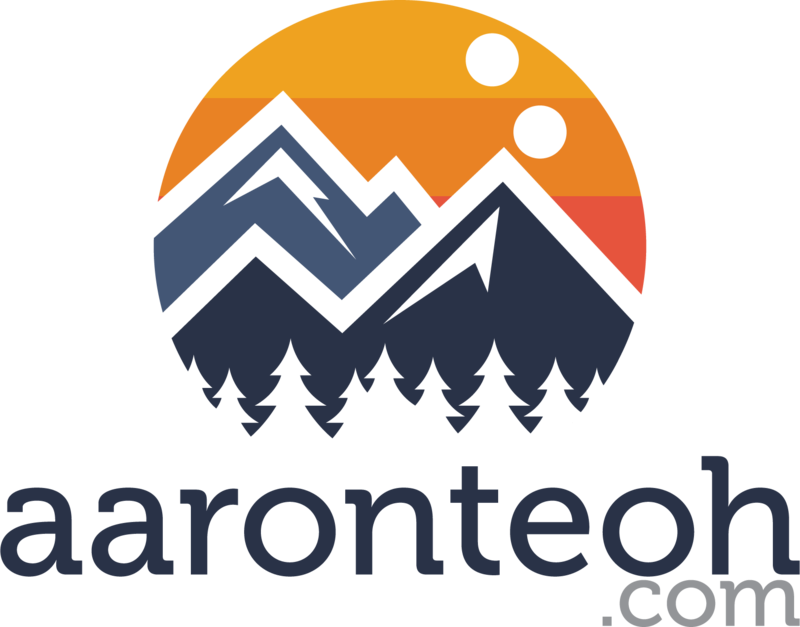 But anyway, definitely worth checking out. The interesting stuff is located quite far deep in though. 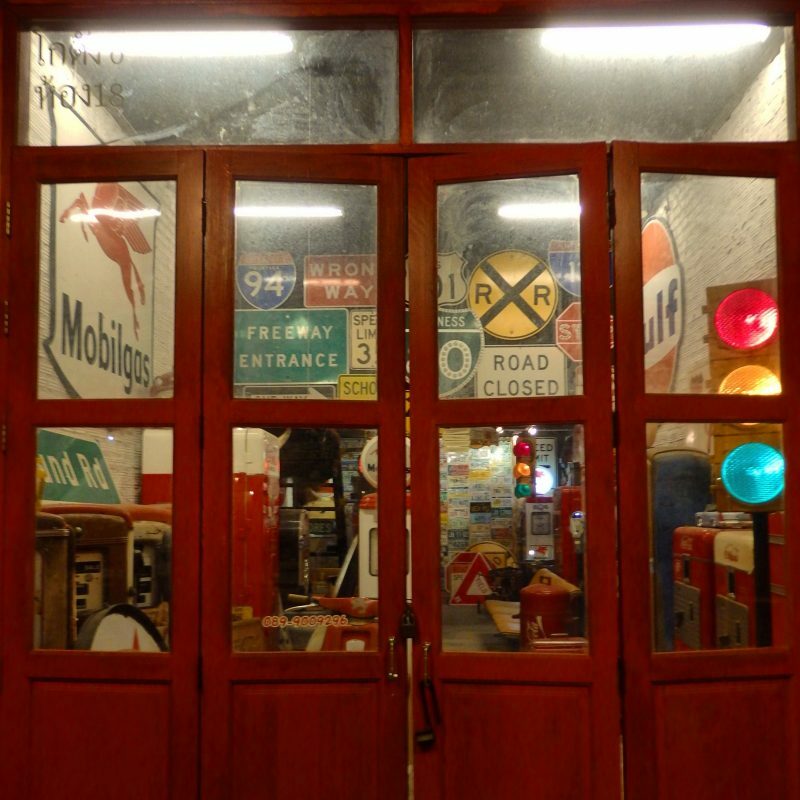 The garage was cool, lots of retro stuff inside. 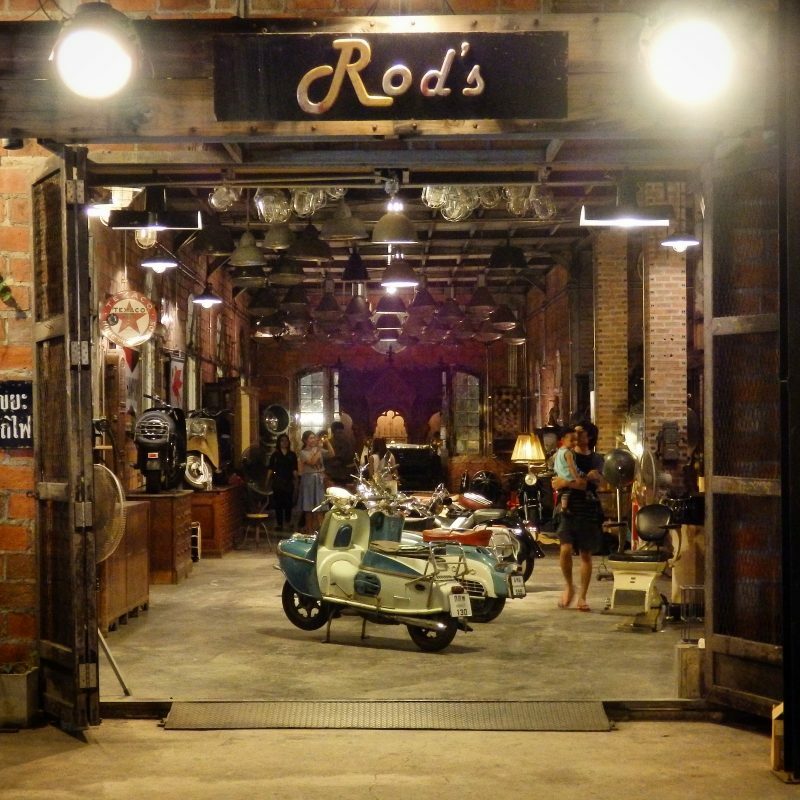 Retro looking shops at Talad Rod Fai. Maybe a little lonely, but certainly photo worthy. Not too sure what this was. 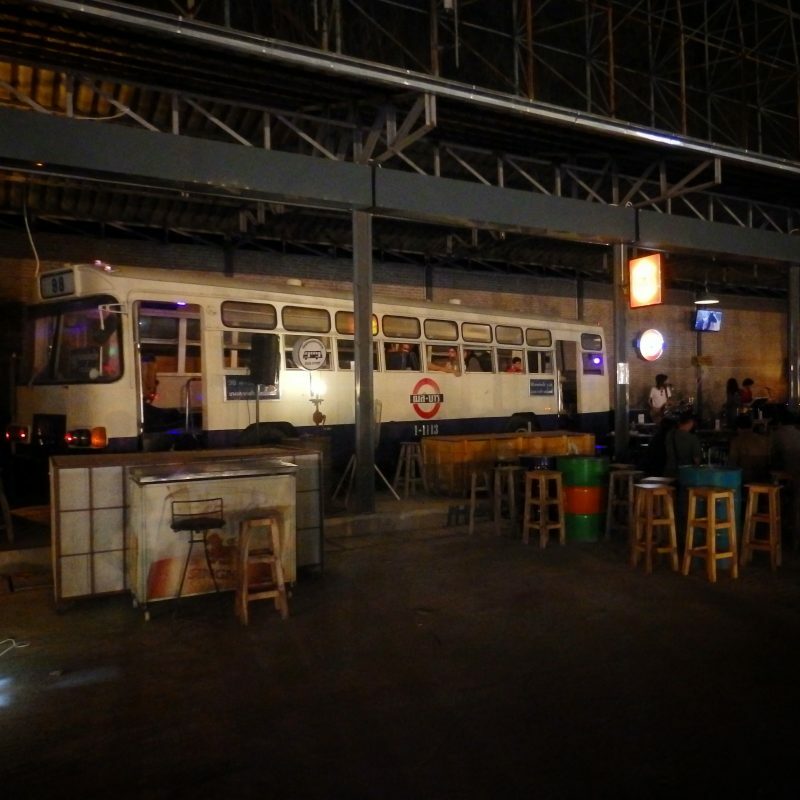 No worries about missing the last bus if you’re drinking here. 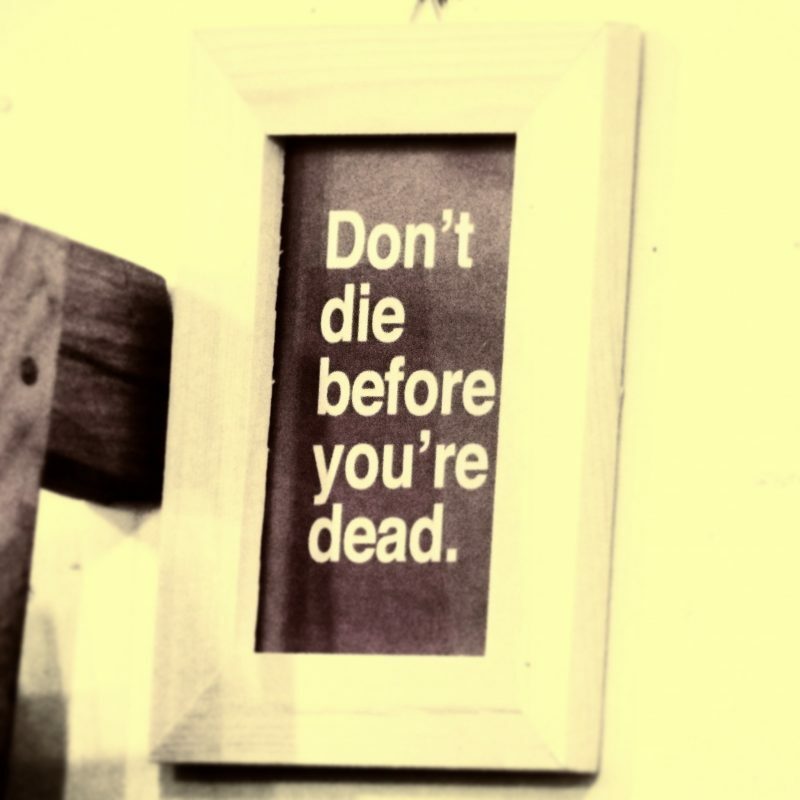 Except you might still be here the following morning. Being in Bangkok on a Sunday on the last day of this trip, there was only one place left to visit. Milk tea at Chatuchak Weekend Market. 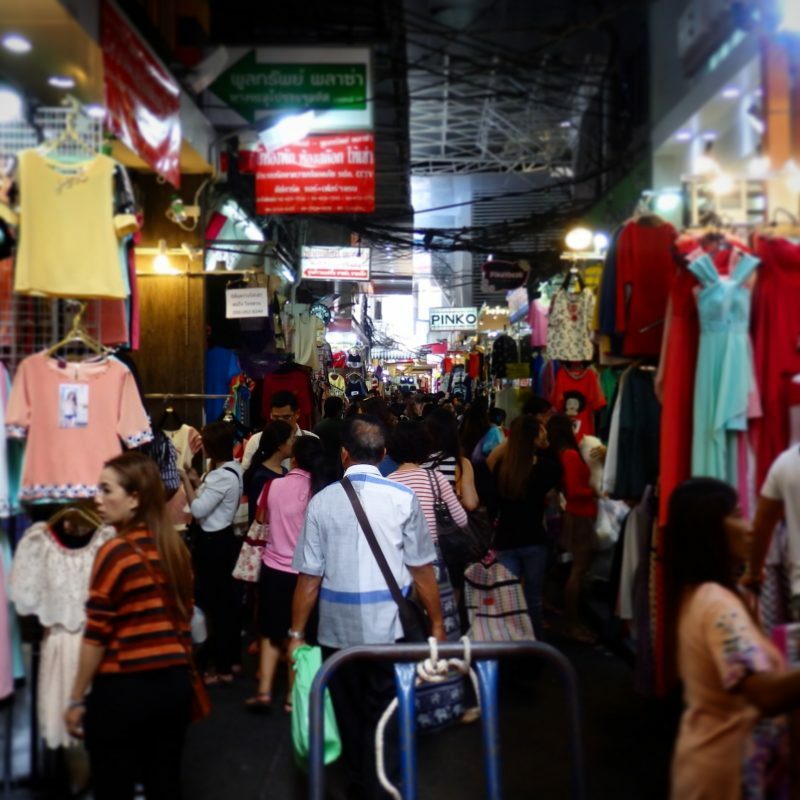 As with almost any other tourist in Bangkok on a Sunday, I visited the Chatuchak Weekend Market, Bangkok. Didn’t queue for the coconut ice cream everyone was raving about, but caught this guy in action. 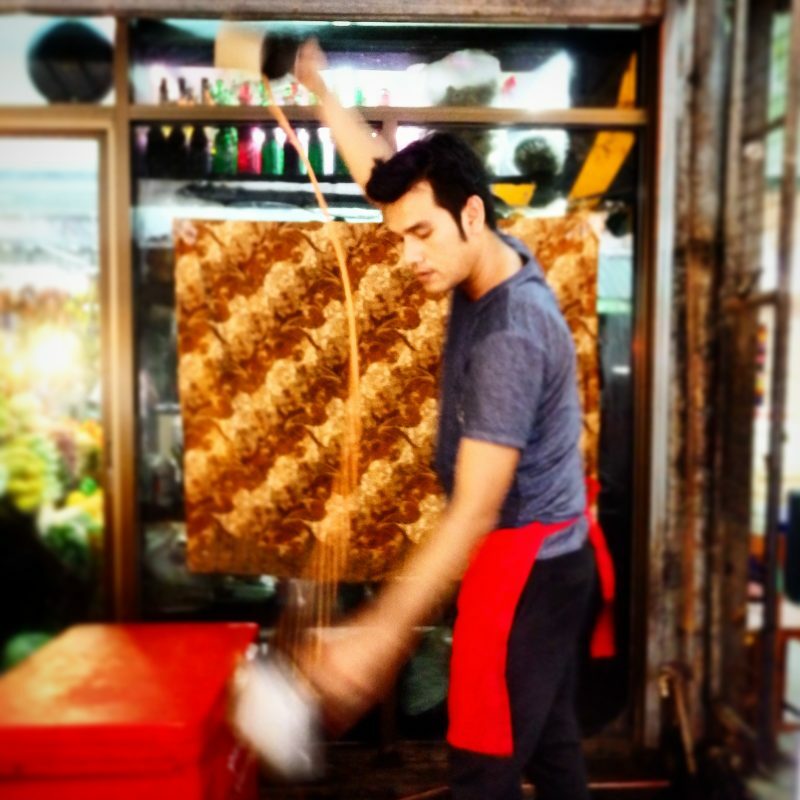 Had seen him on vids circulating but didn’t know this was in Chatuchak. Pretty cool performance, slightly different milk tea from the other ones in Thailand, which are very, very sweet. This was less sweet. Couple more interesting food stalls (when in doubt, follow the crowd) and lots and lots of shopping at Chatuchak too. That’s it, 21 days in Thailand, a real eye opener for me, and really glad to have been able to meet and make friends on this trip. 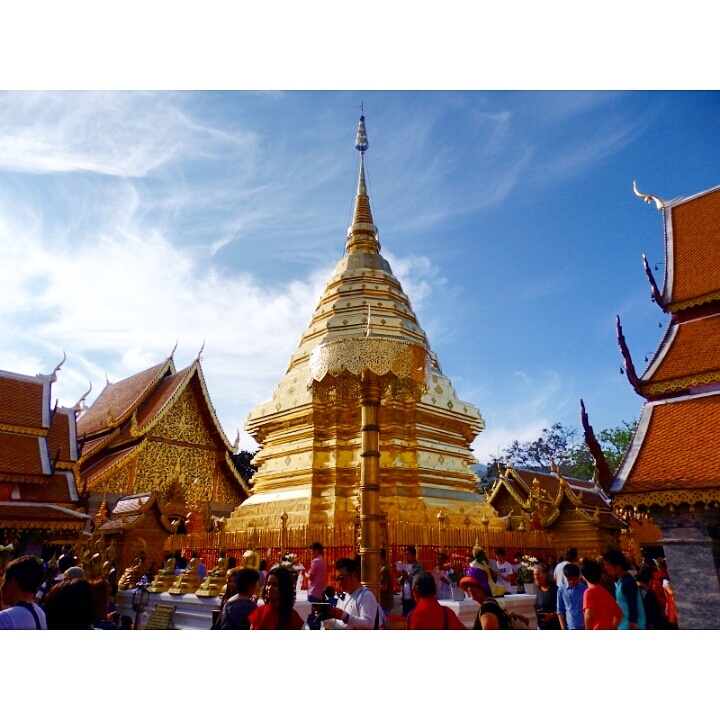 I’d say that most places shared above are recommended places to visit, in addition to other must visits in Thailand that I did not check out this time, such as the Grand Palace in Bangkok, and the famous beaches further down south. Thailand’s an amazing country, and I hope to be back again!